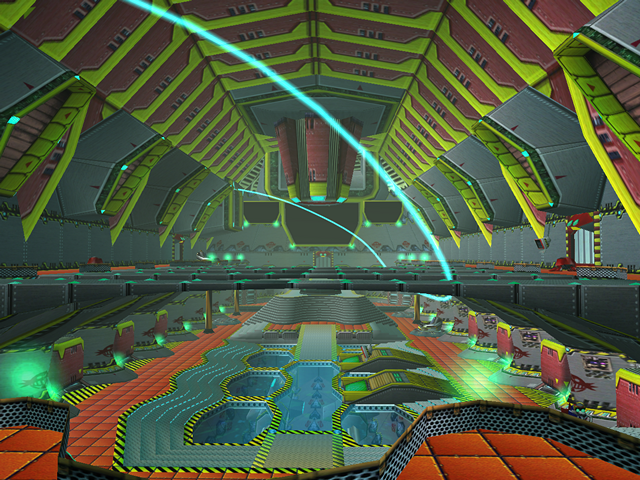 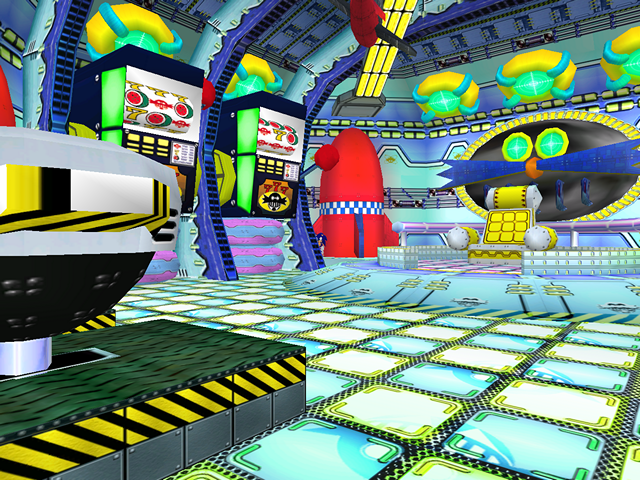 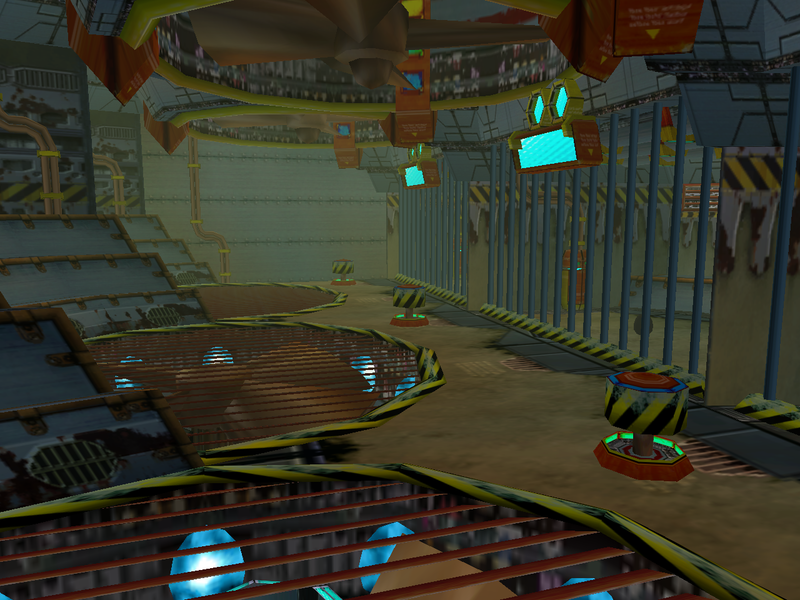 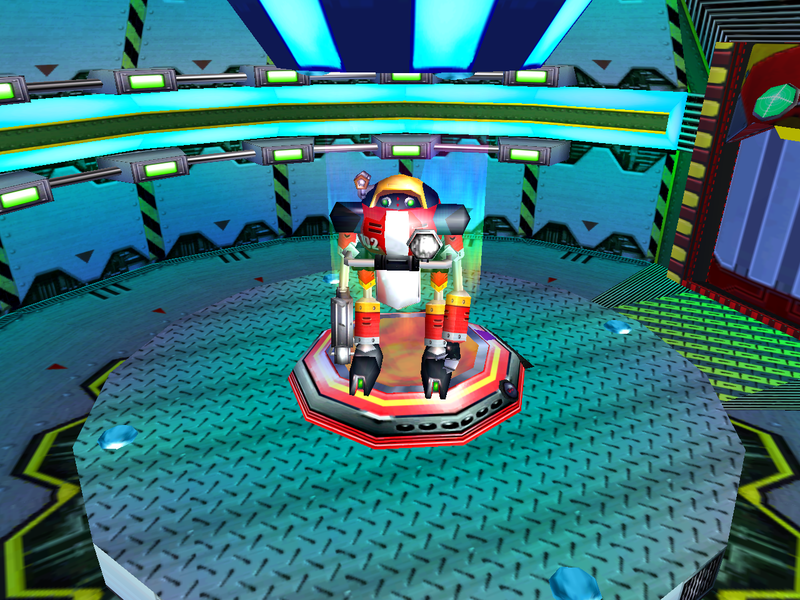 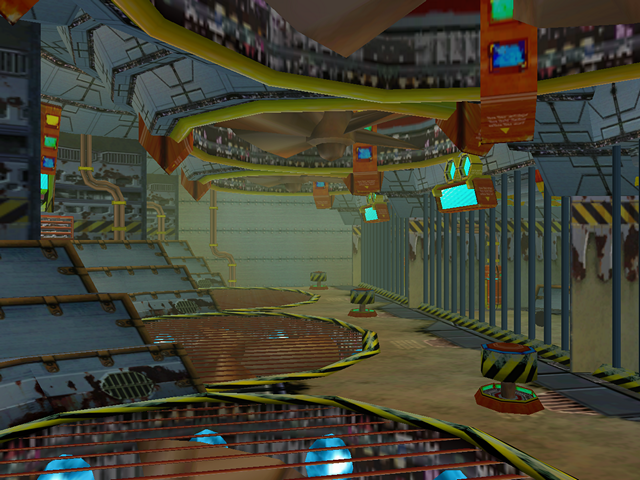 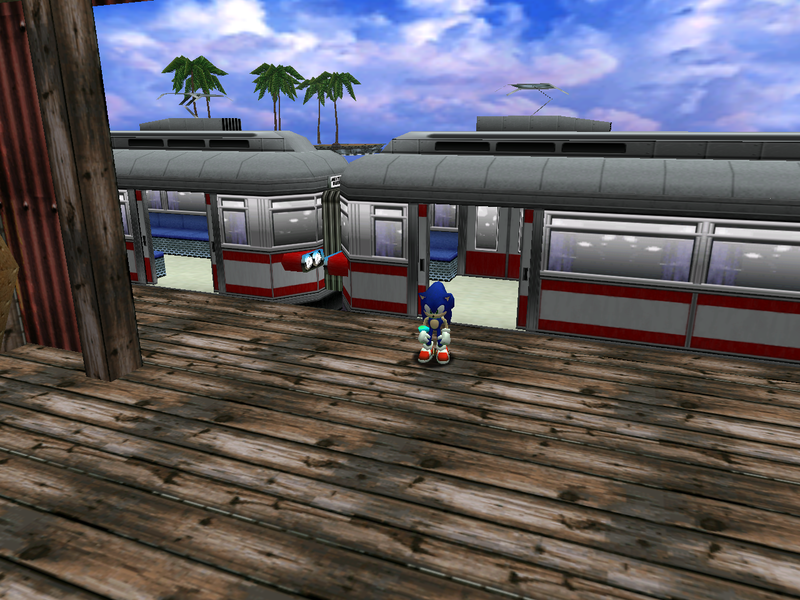 In comparison to Station Square or the Mystic Ruins, the Egg Carrier has received a less radical redesign in SADX. 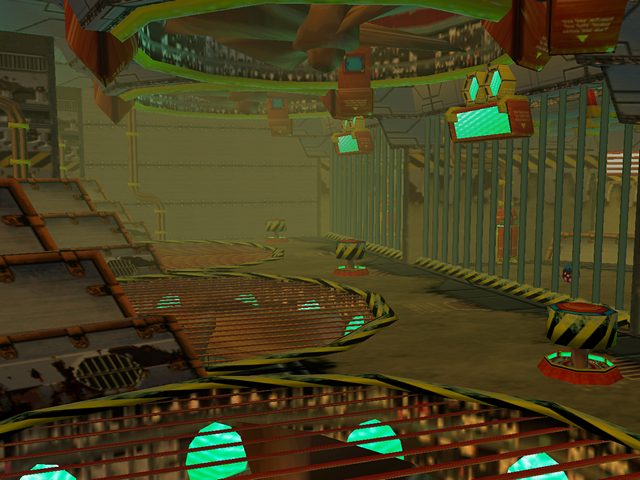 However, the changes introduced in this level range from minor improvements to serious loss of detail and vibrancy. 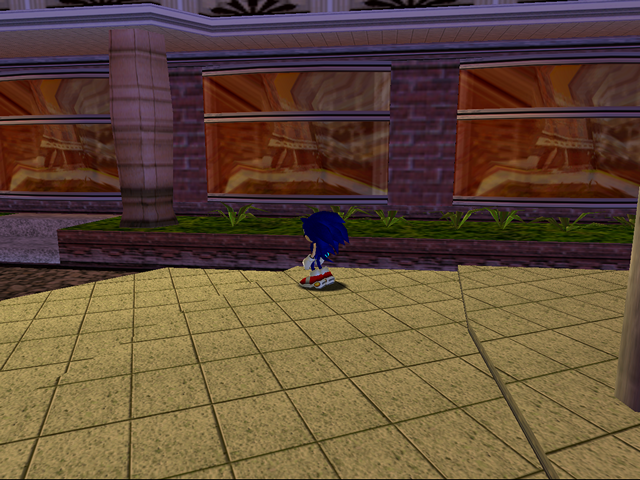 Let’s have a look at what’s been lost in the transition. The “different” texture used for the green glass floor in SADX is the same texture used for windows in SADX and the Dreamcast version. 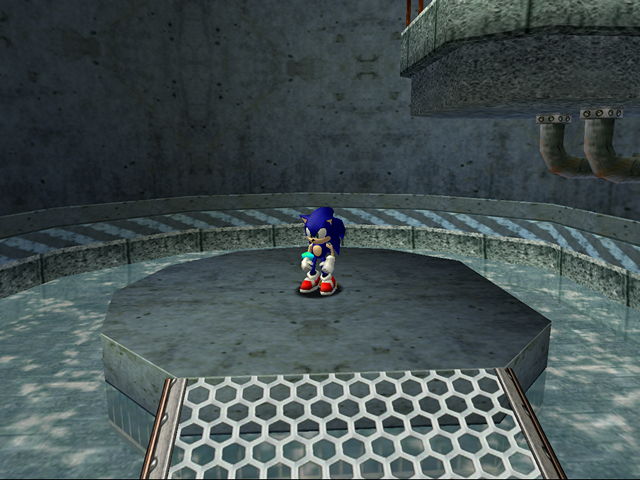 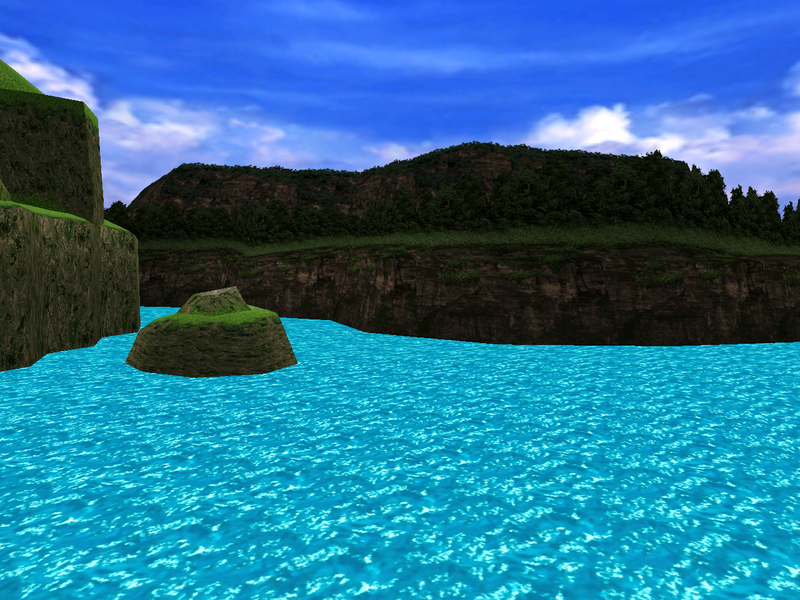 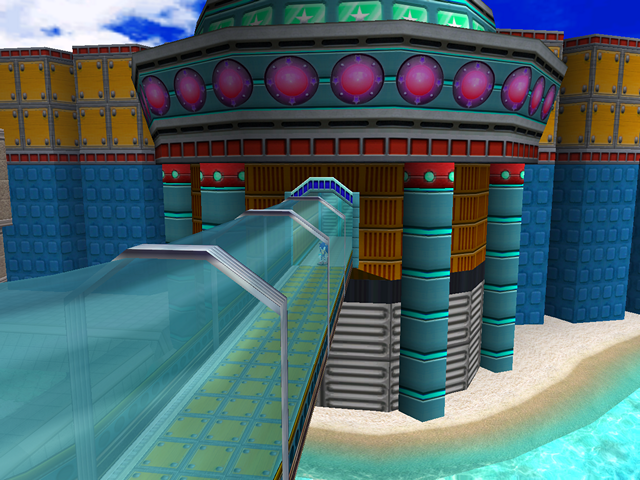 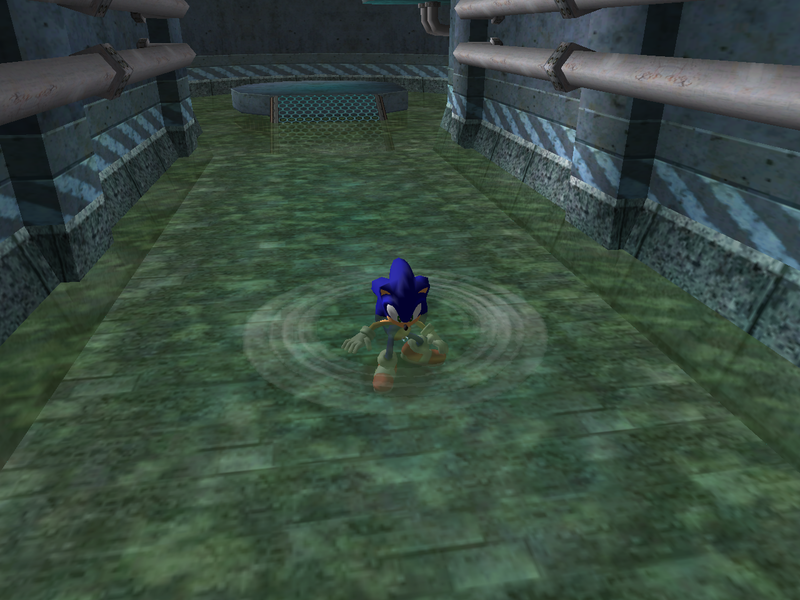 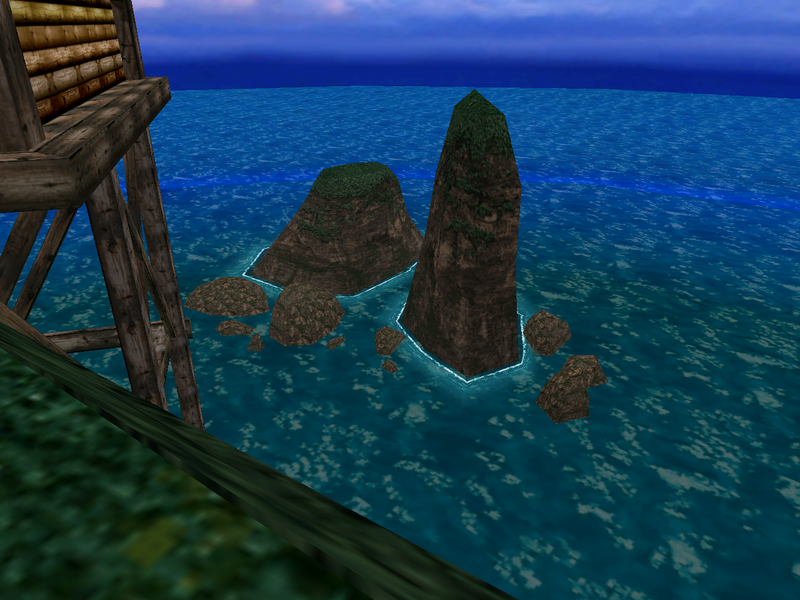 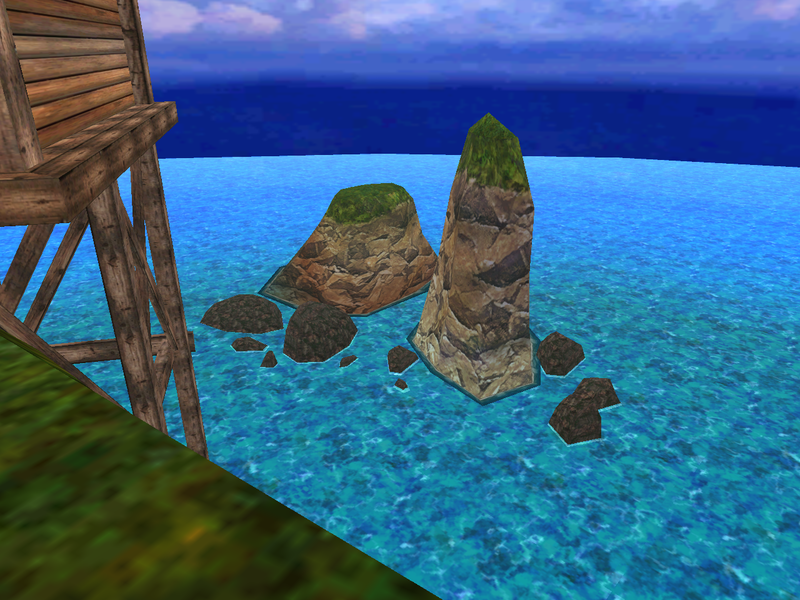 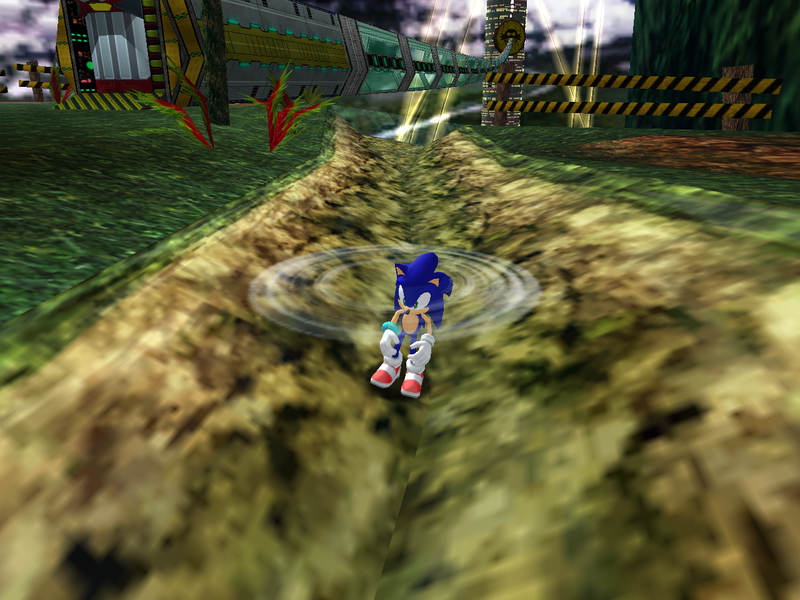 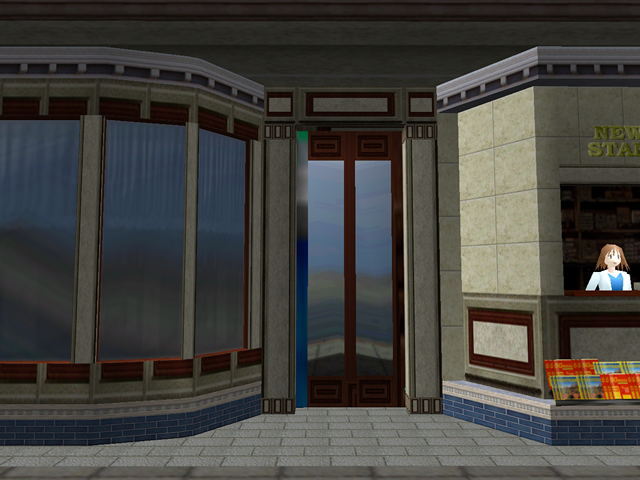 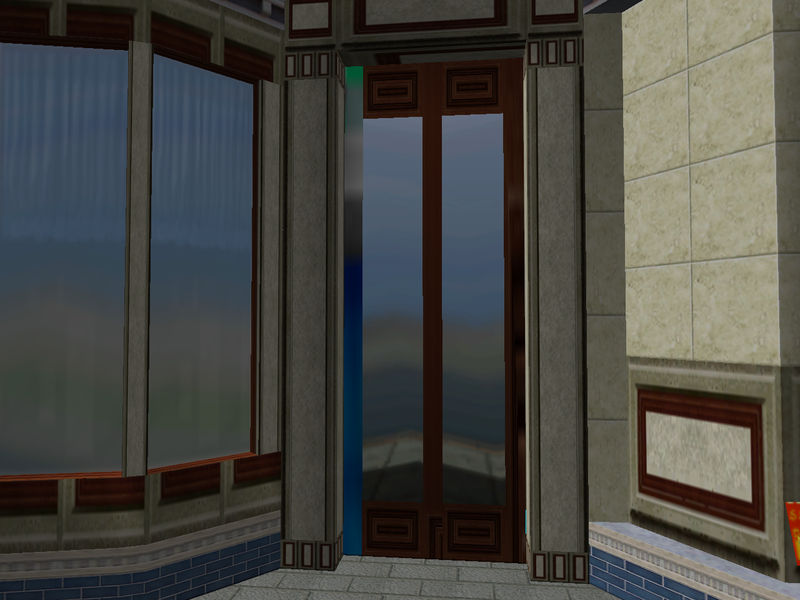 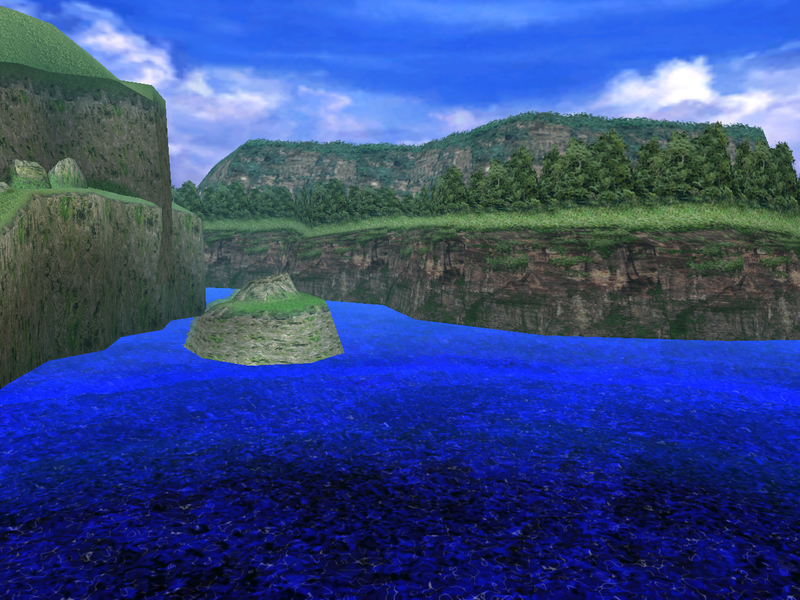 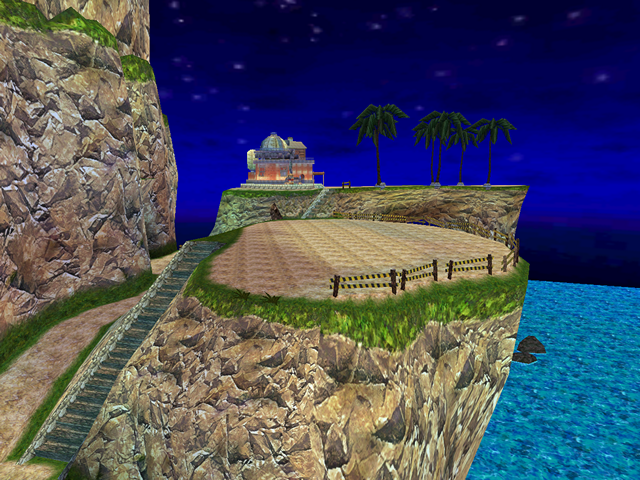 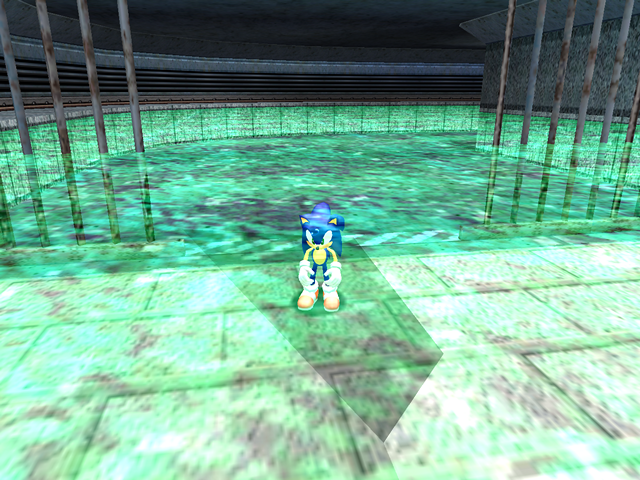 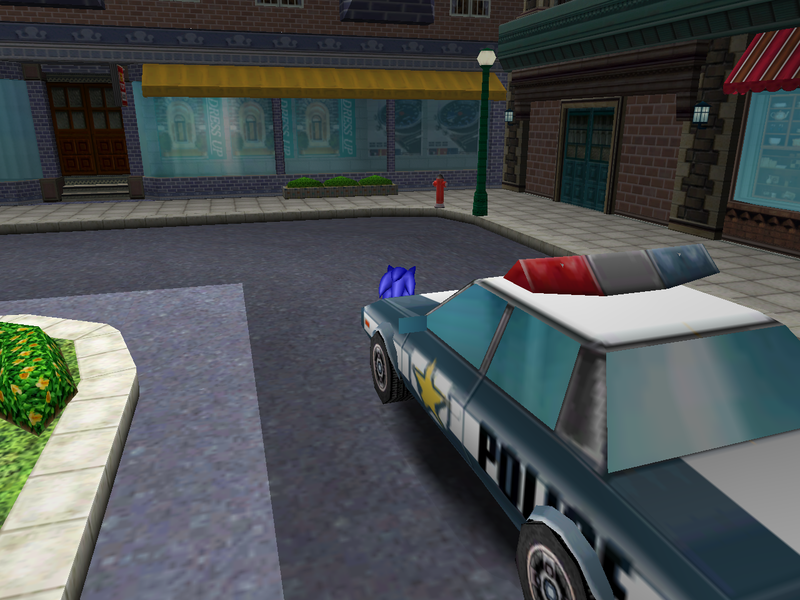 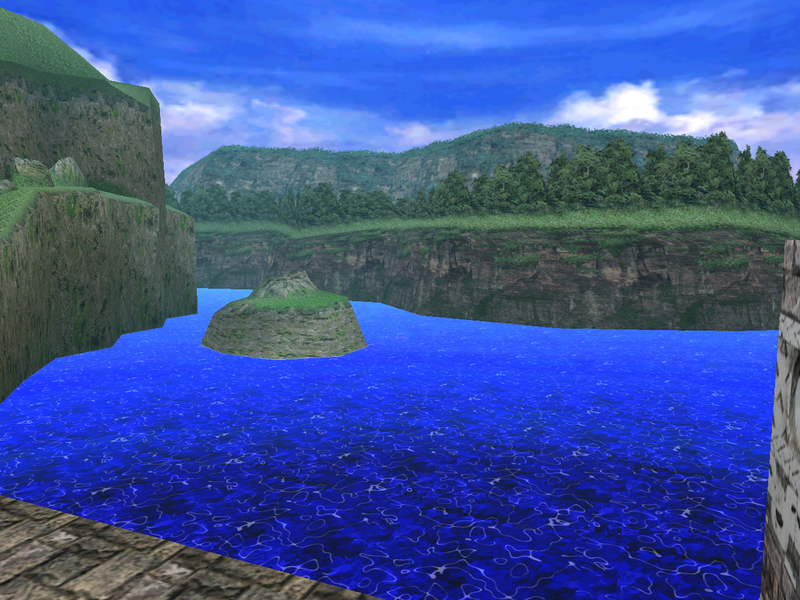 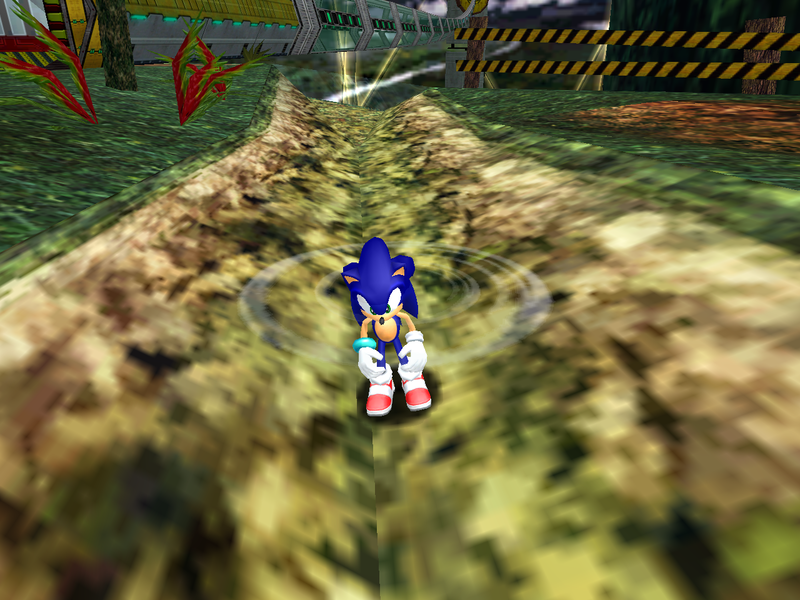 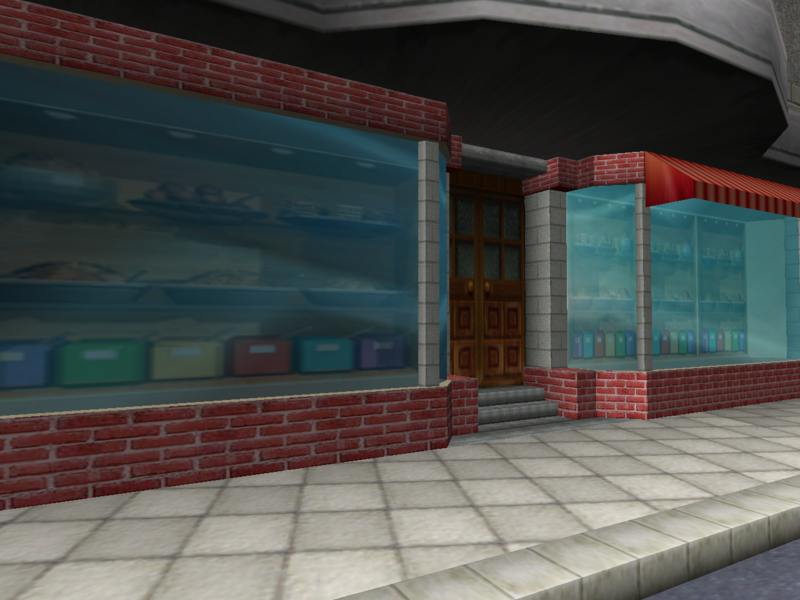 The unique green glass and reflection textures are not used in this area anymore, and some variations have been removed entirely, so texture variety in this area is reduced in SADX. The Sky Deck entrance has glowing lines (the monorail) running under green glass. 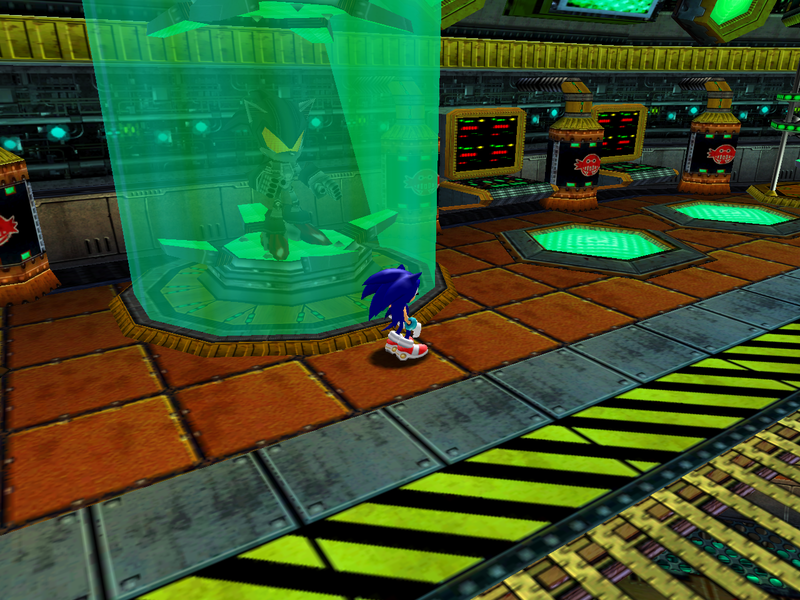 In the PC version, unnecessary processing of material colors gives the glass an incorrect color. 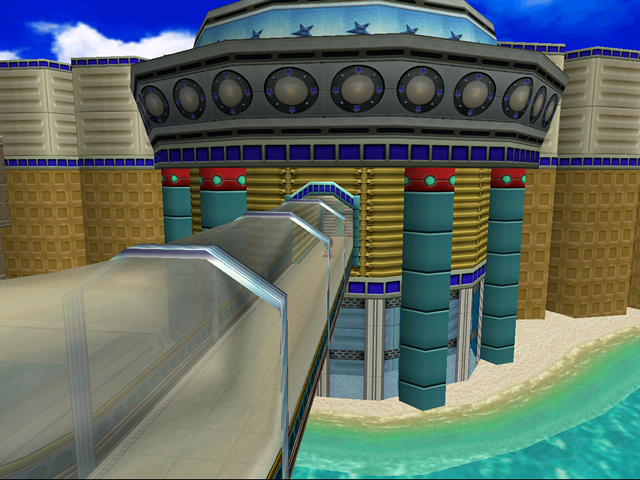 In addition, the lines disappear at some camera angles on Gamecube and PC, which doesn’t happen in the original game. 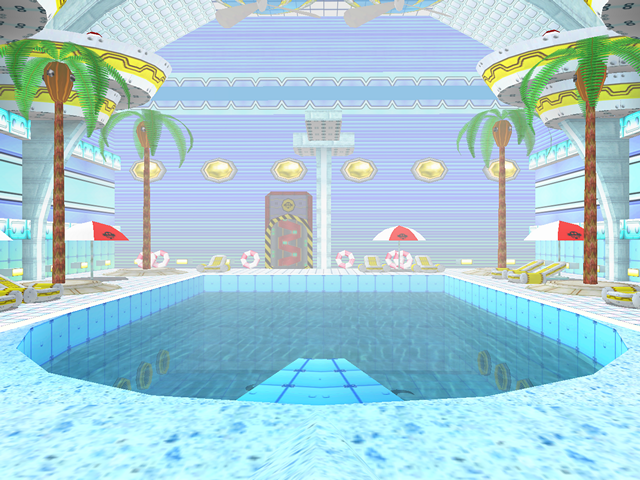 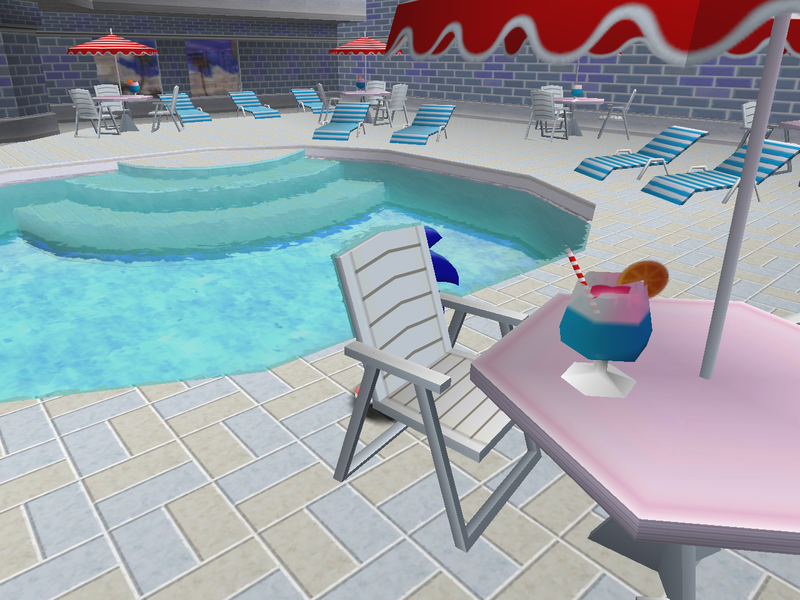 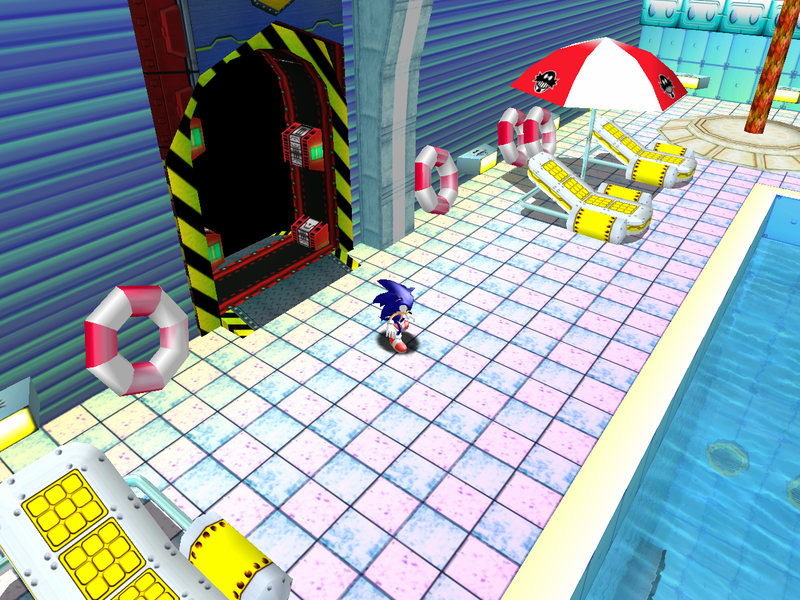 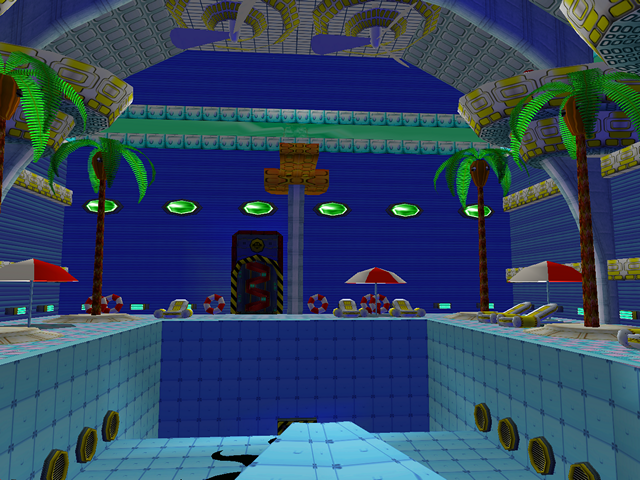 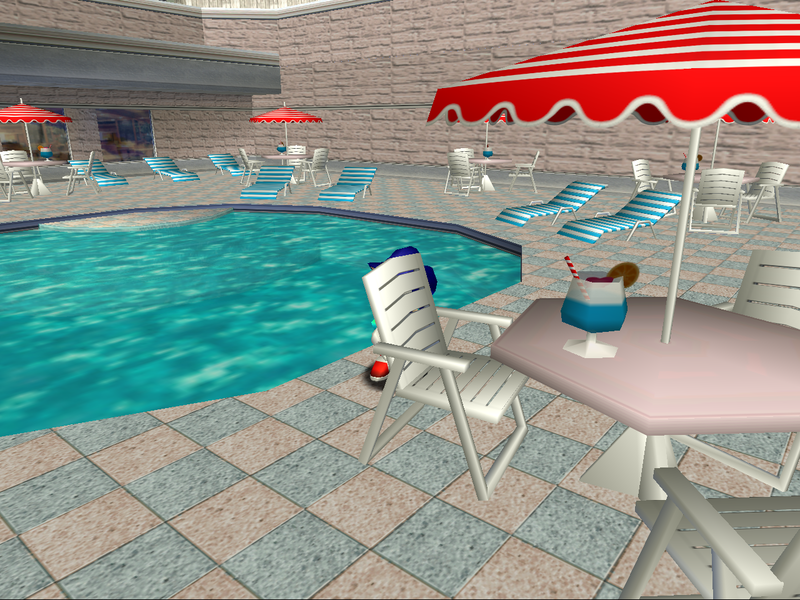 Some minor enhancements in the pool area include added Eggman logos on the umbrellas, yellow vertex colors and improved collision, but the lighting and textures were made so bright it almost looks like a hospital. 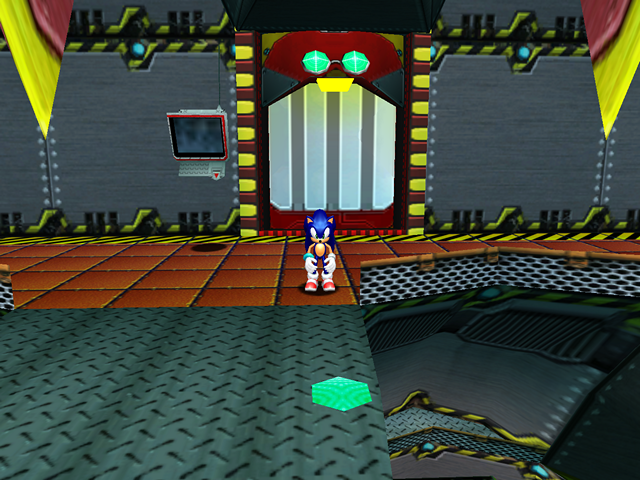 In the original game, reflective green barriers show up on some doors during Gamma’s story to indicate that you can’t go inside. 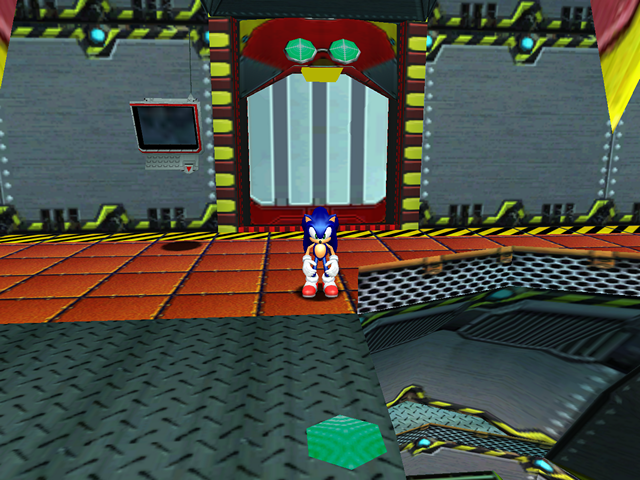 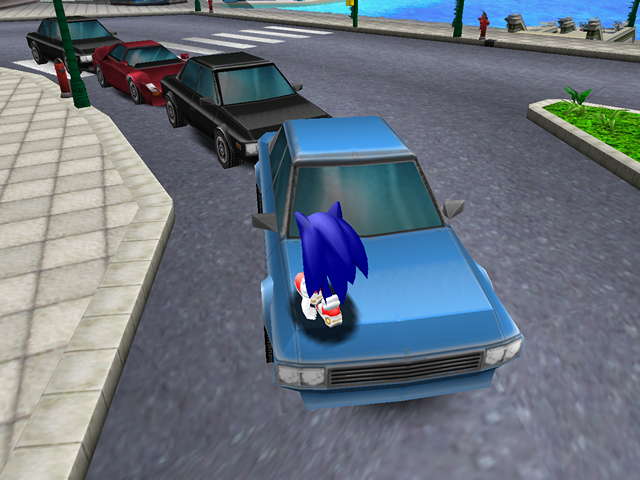 While the code for the barriers is still there in SADX, the function call to render the barrier’s model was disabled. 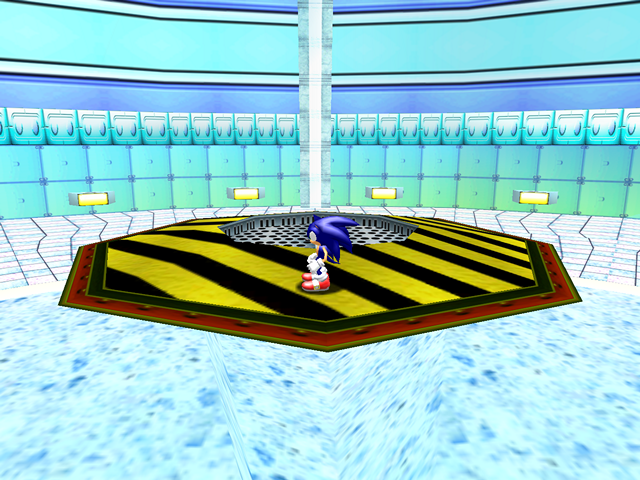 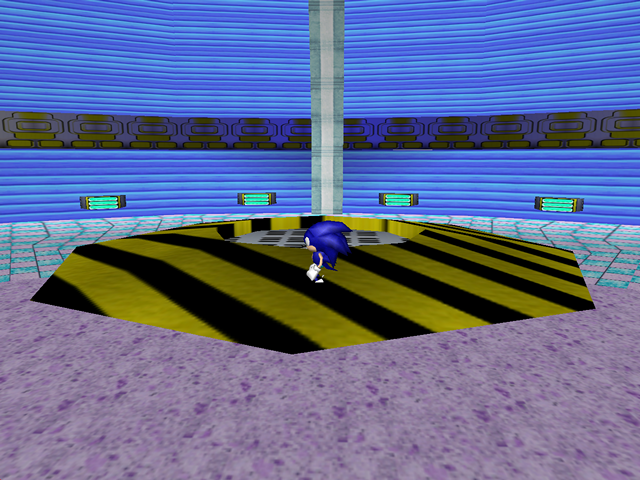 As a result, these barriers are never seen in SADX. 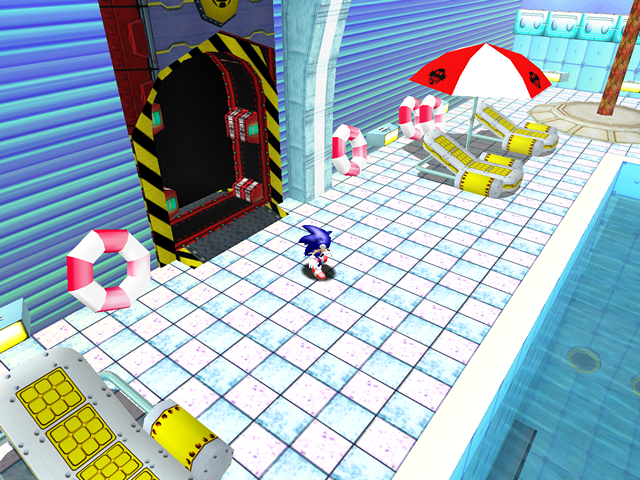 The Egg Carrier has only marginal changes in SADX (such as better texturing of some level pieces and objects) that could be counted as improvements, but everything else is a major letdown. Looking at the two versions side by side is disappointing because it demonstrates the incredible amount of wasted potential for improvements in the supposedly “enhanced” port. 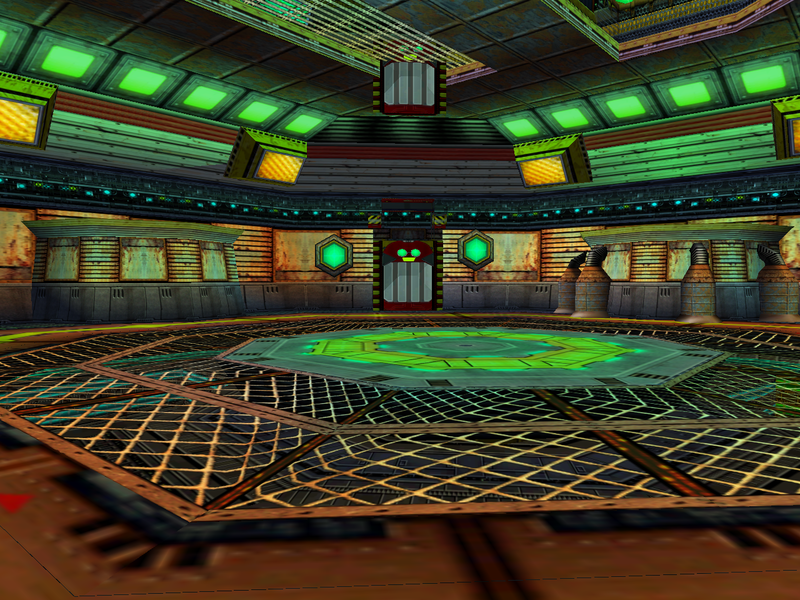 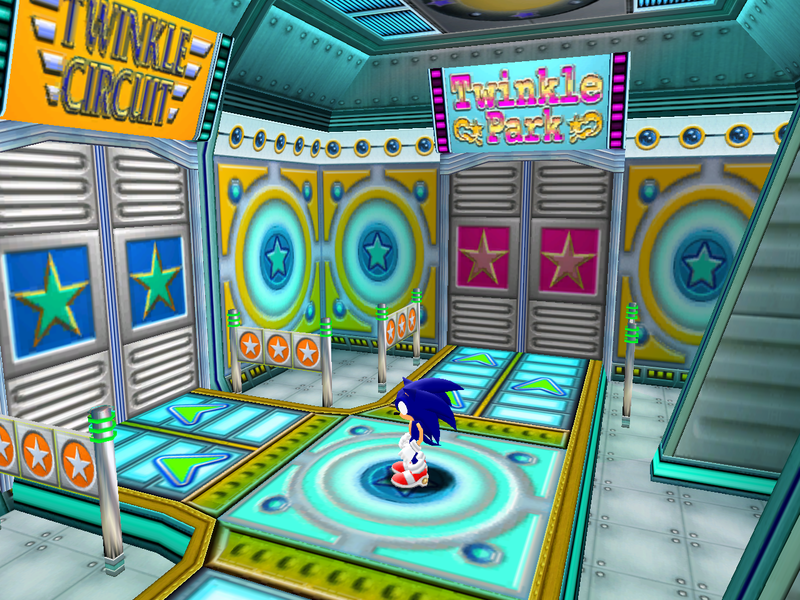 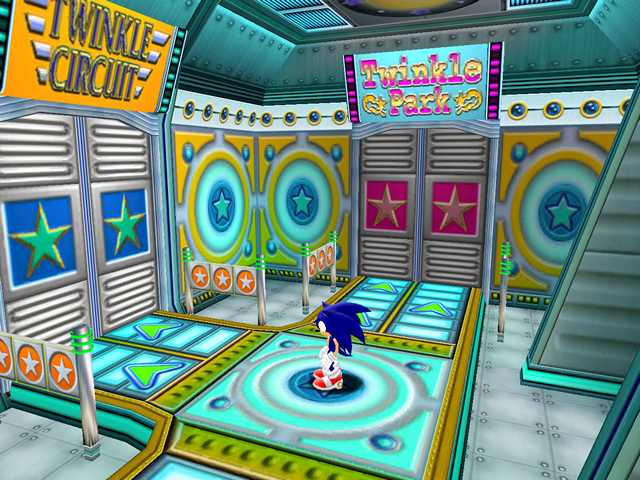 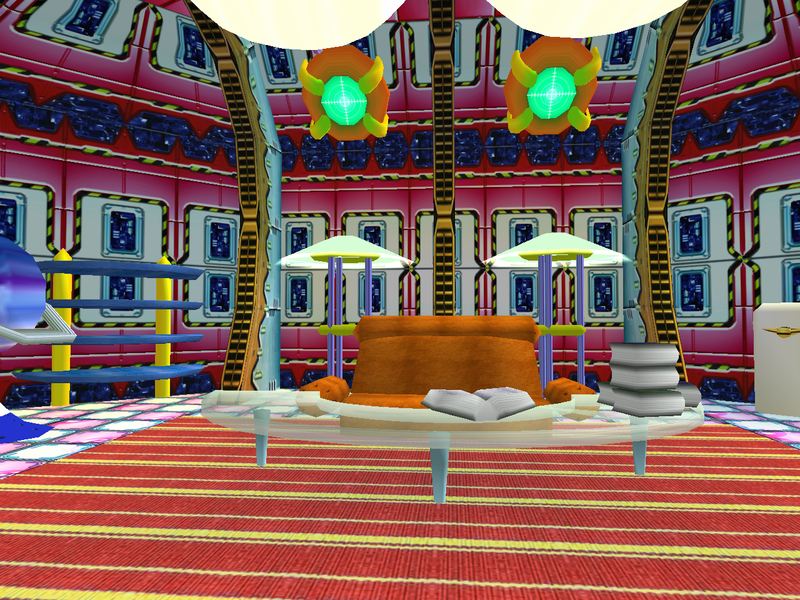 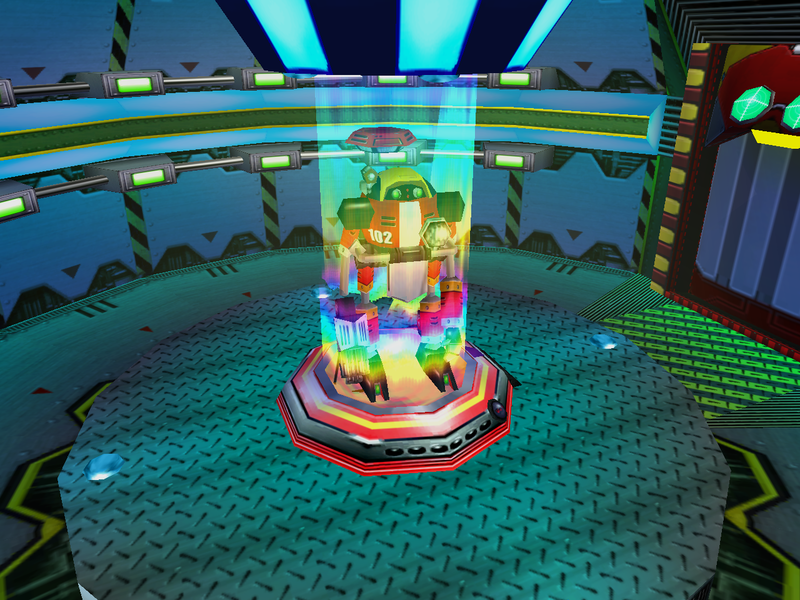 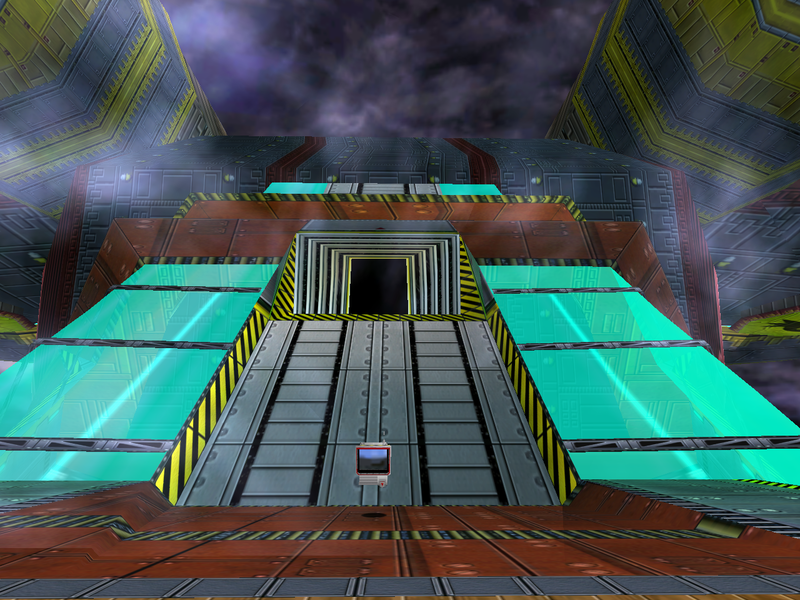 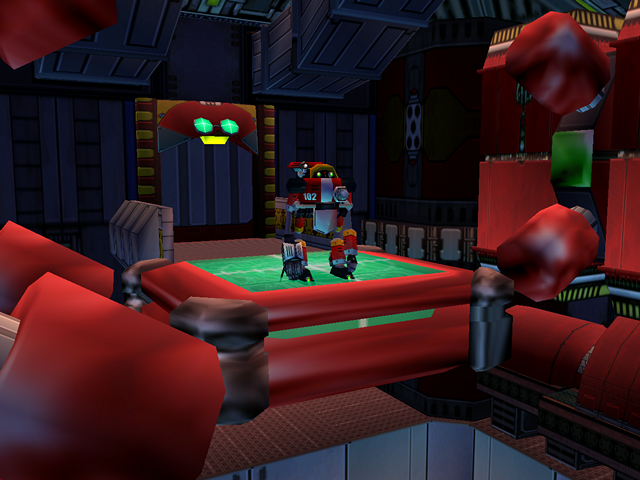 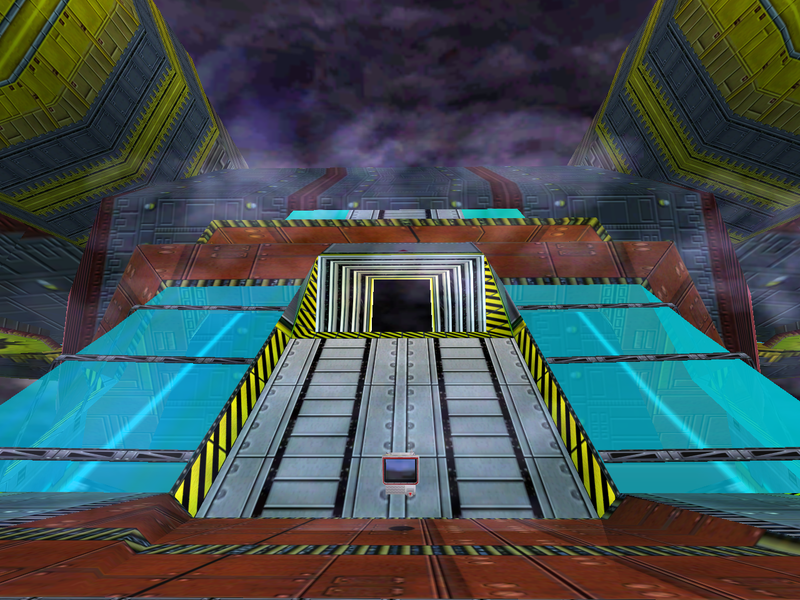 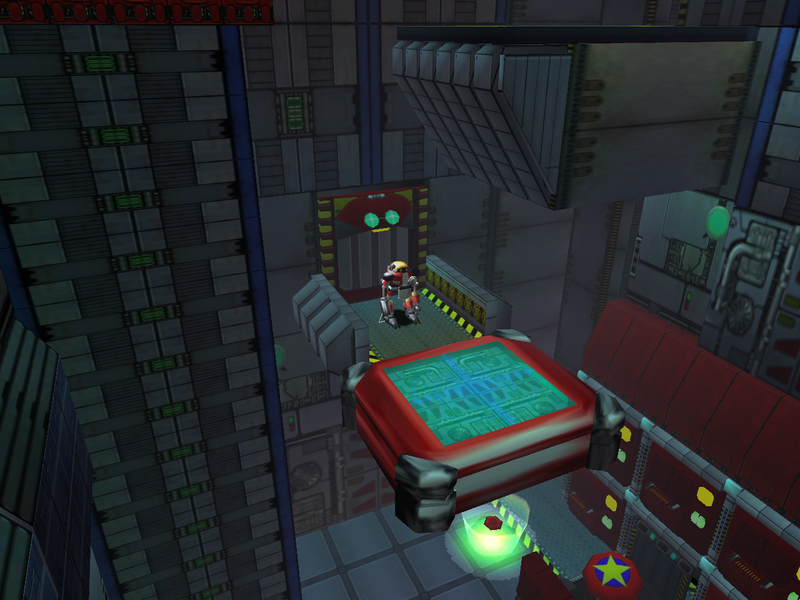 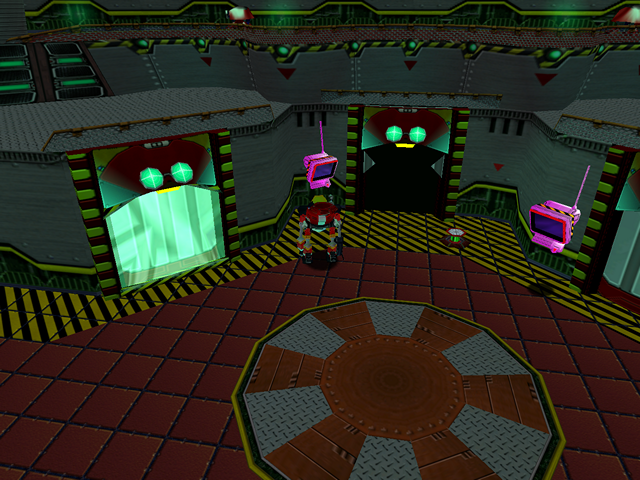 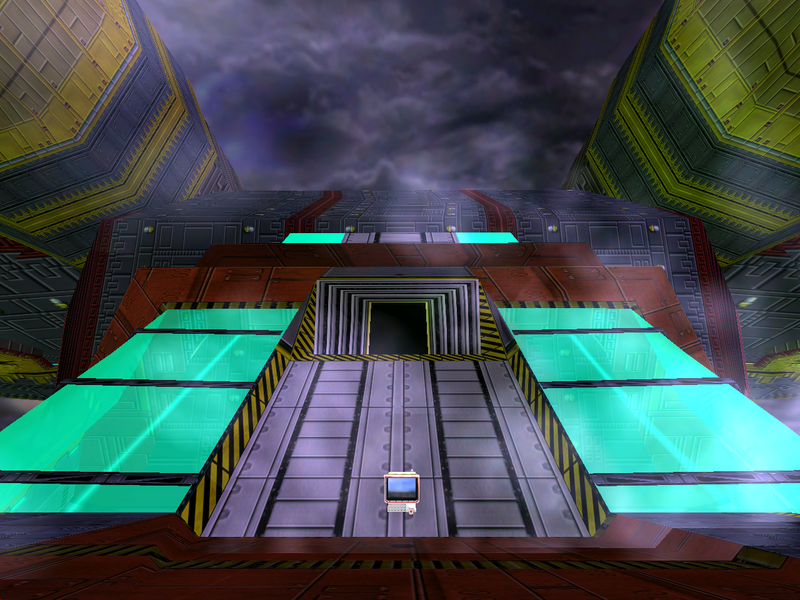 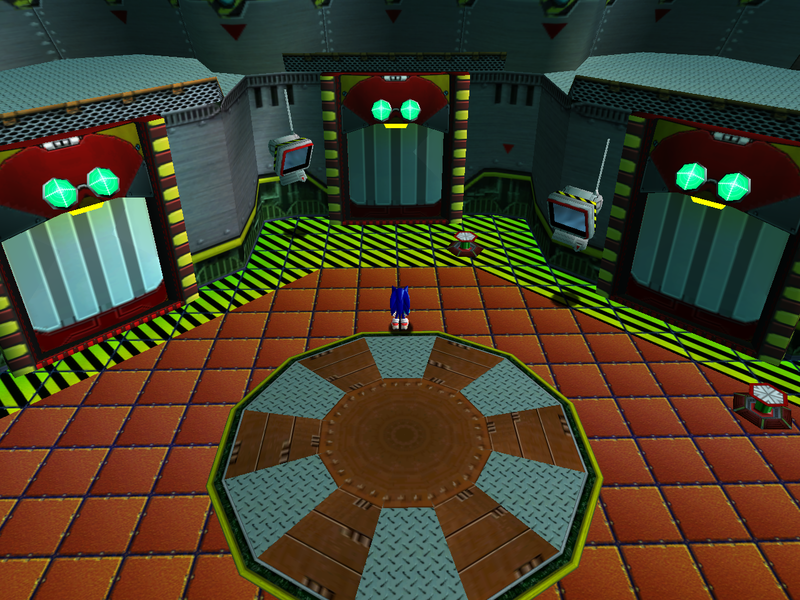 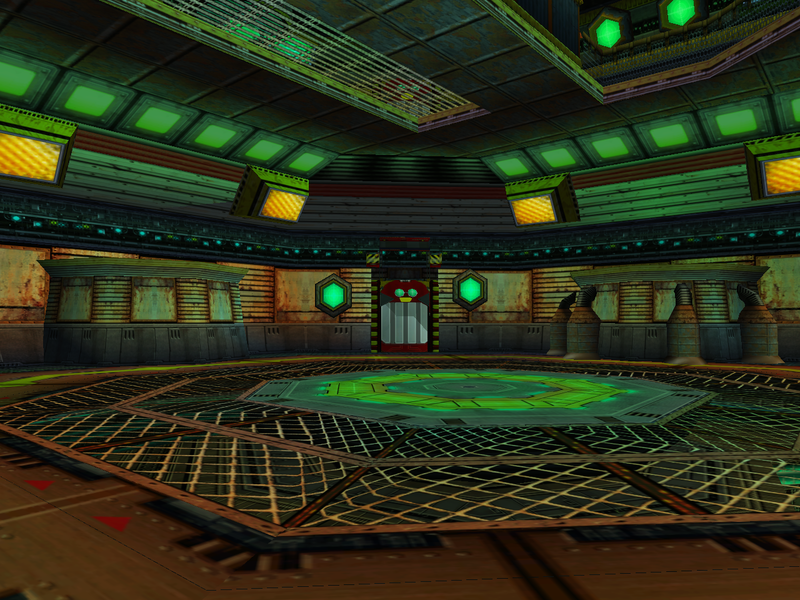 To play the original version of this level, you can use the Dreamcast Conversion mod together with the Lantern Engine mod that reimplements Dreamcast lighting. 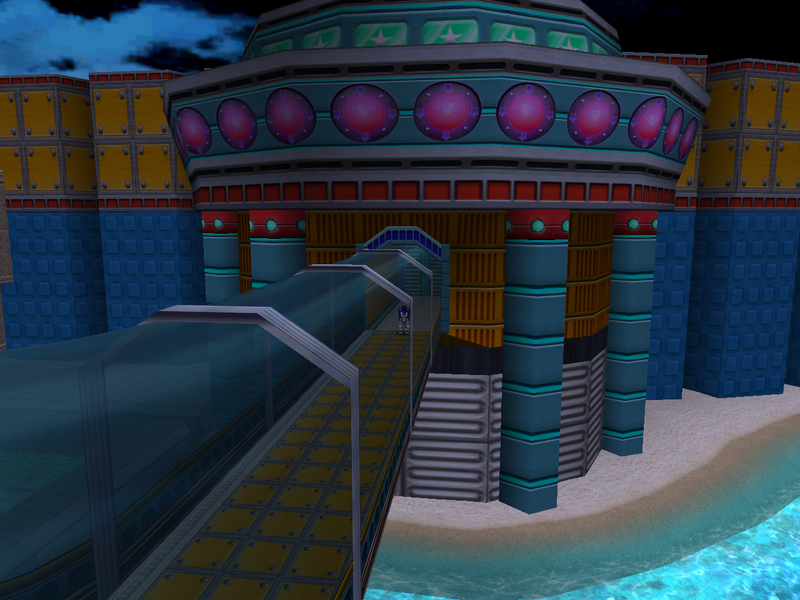 More about mods here. Mystic Ruins Past is a relatively small location, but even a small level like this suffers from downgrades ranging from minor problems to complete removal of things that define the level’s theme. 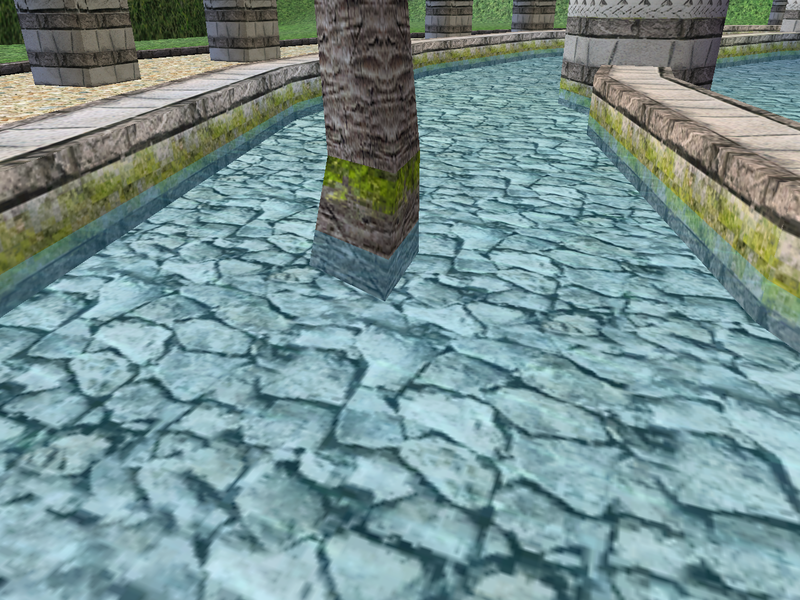 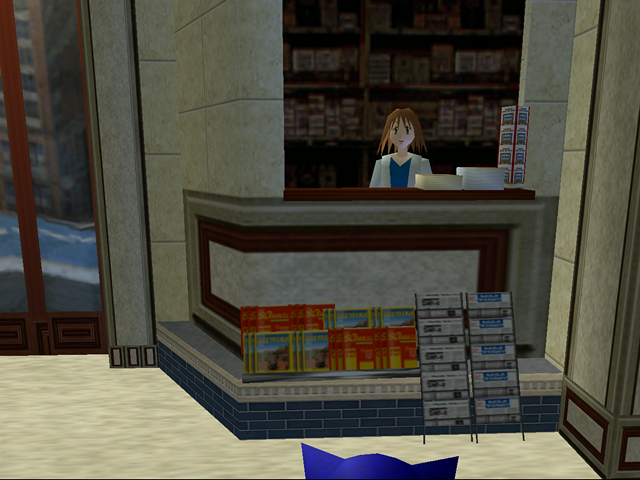 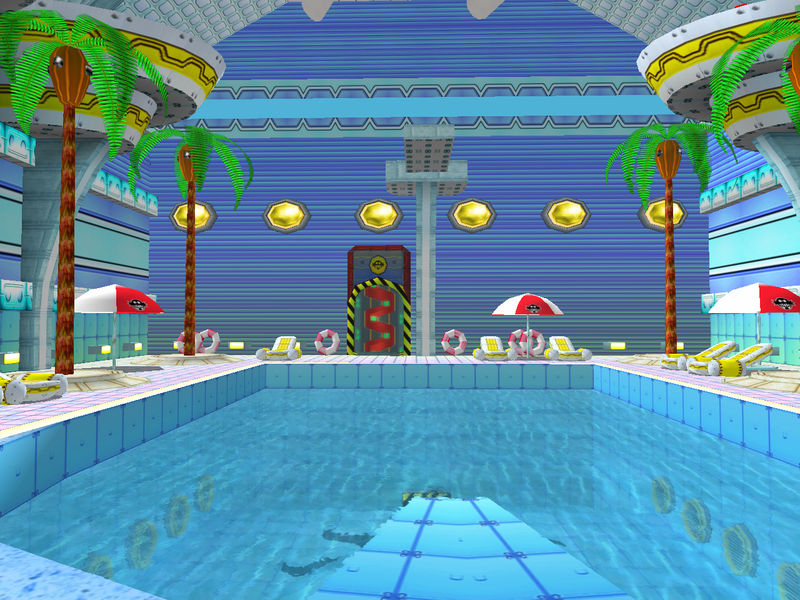 In the Dreamcast version the water around the altar reflects some objects like palm trees and columns. 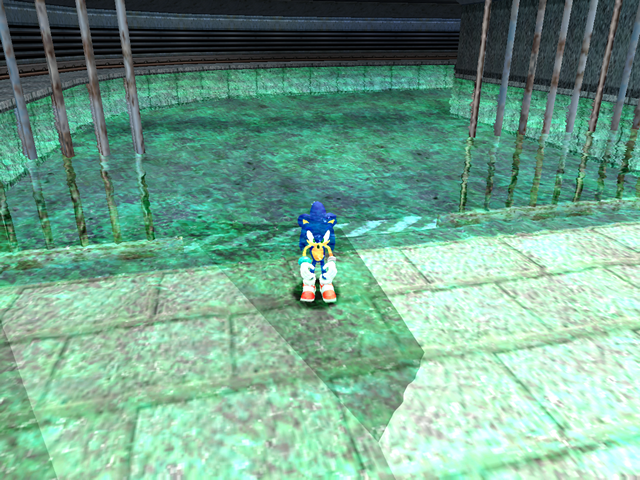 This effect is created by making the floor transparent and placing “reflected” models underneath it. 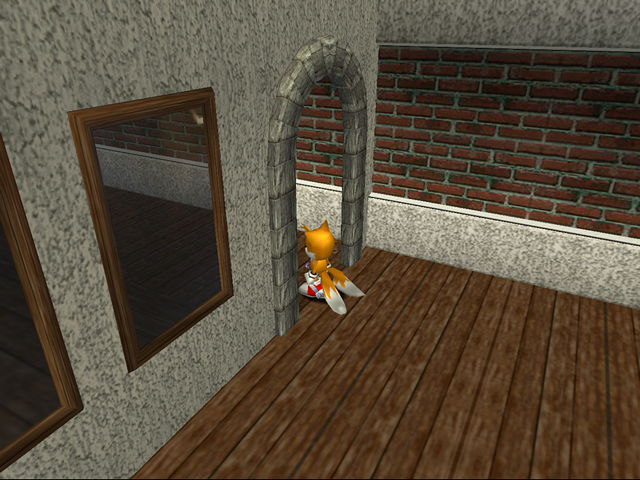 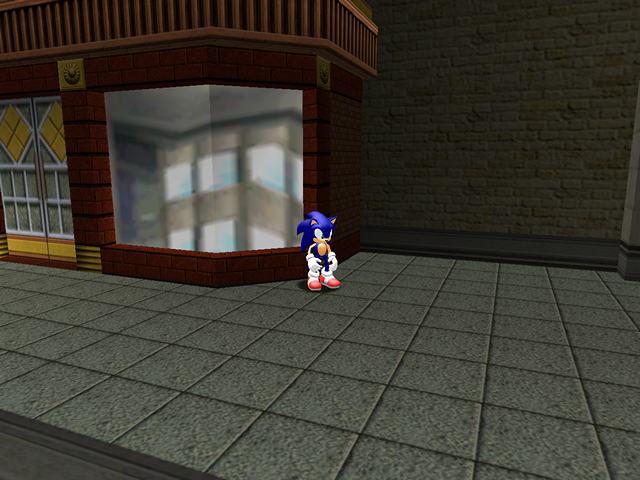 These reflections are still present in the SADX level, but they fail to render properly due to the game’s transparency problems. 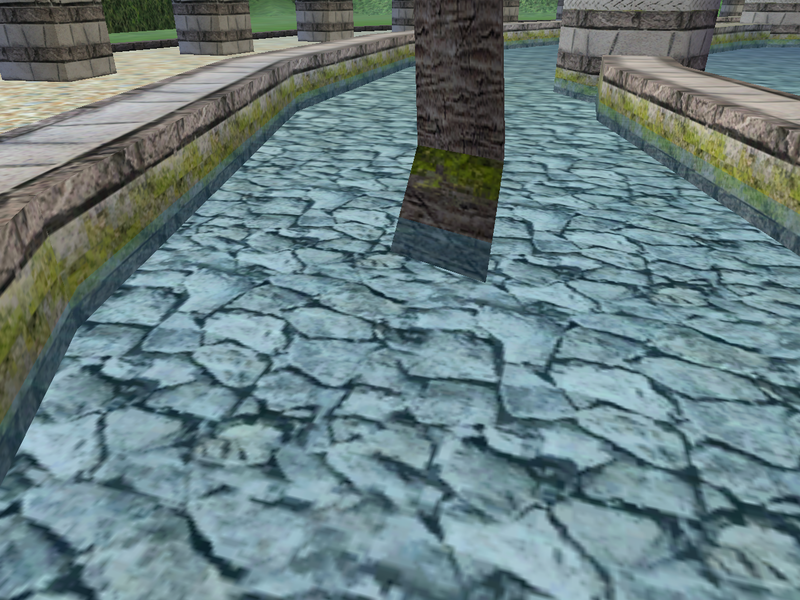 In addition, the water texture was made so transparent you can barely tell there is water. 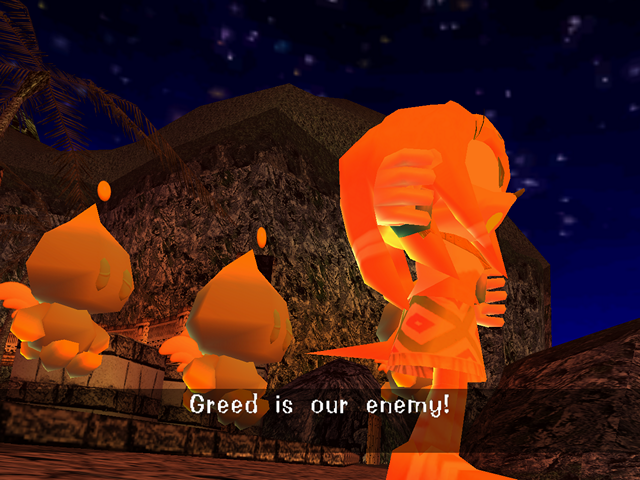 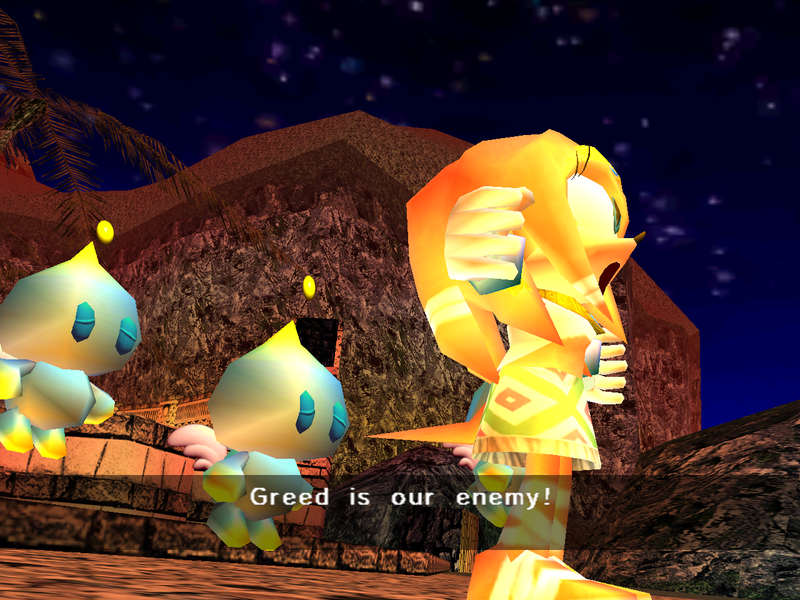 The reflections were especially effective at creating the atmosphere in cutscenes featuring the Emerald Altar on fire, which are less impressive in SADX. Perhaps the most disappointing SADX downgrade in this level is the fire effect. 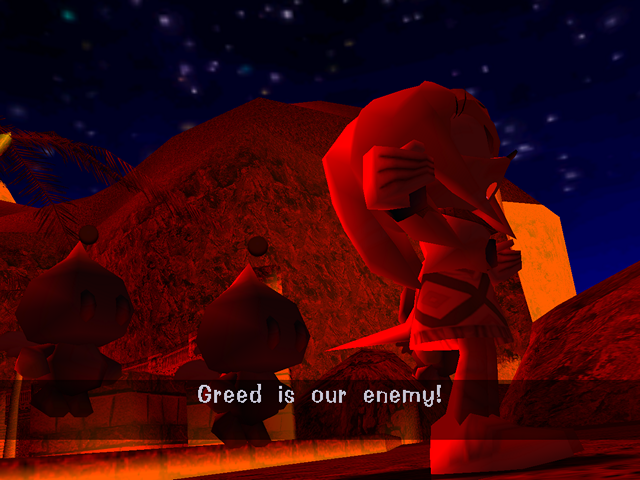 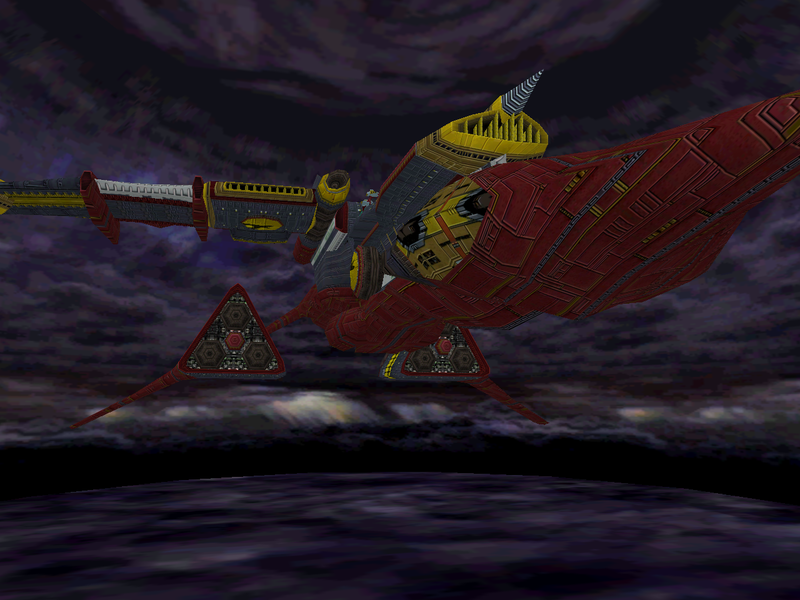 In the Dreamcast version the lighting transitioned between darker and brighter shades of red by alternating between two palettes – more on that in the Lighting section. This effect is removed in SADX. 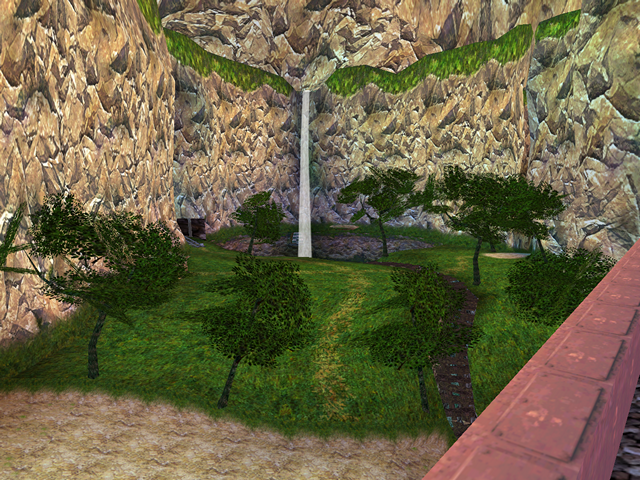 The transitions also affected some objects, such as trees, which now have simpler lighting. 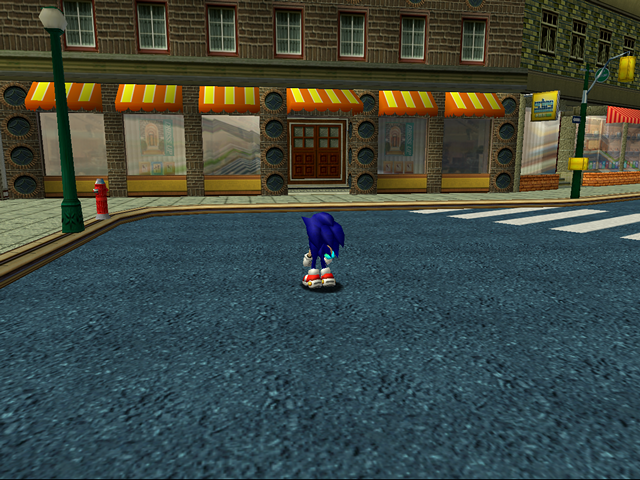 The PC version adds thicker fog that doesn’t help the scene. 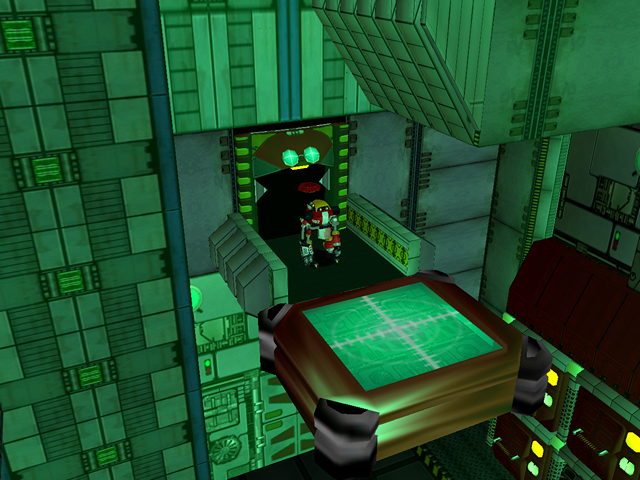 Character lighting in this level was also downgraded quite badly. 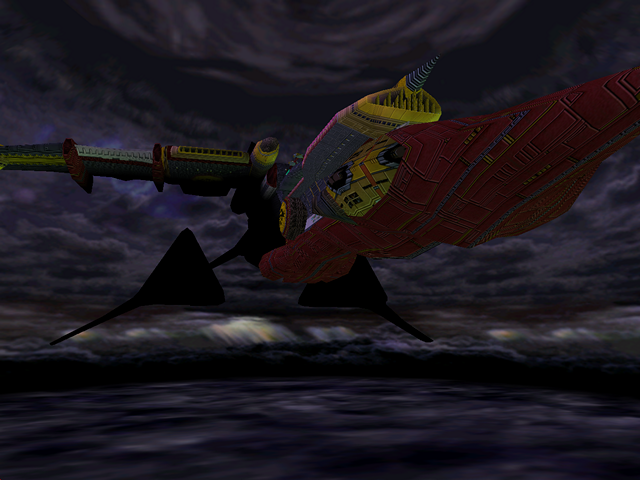 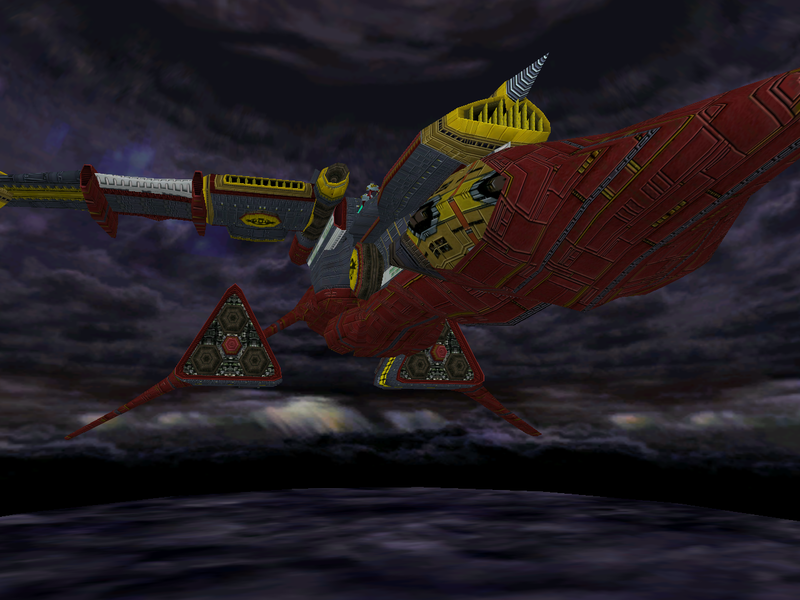 The Gamecube version in particular lacks detail besides basic coloration most of the time. 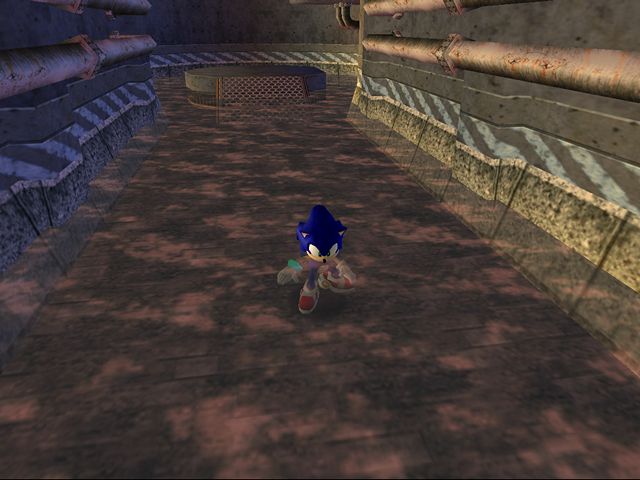 You can still see some slight coloration depending on the camera angle, which suggests that a different light direction might’ve helped. 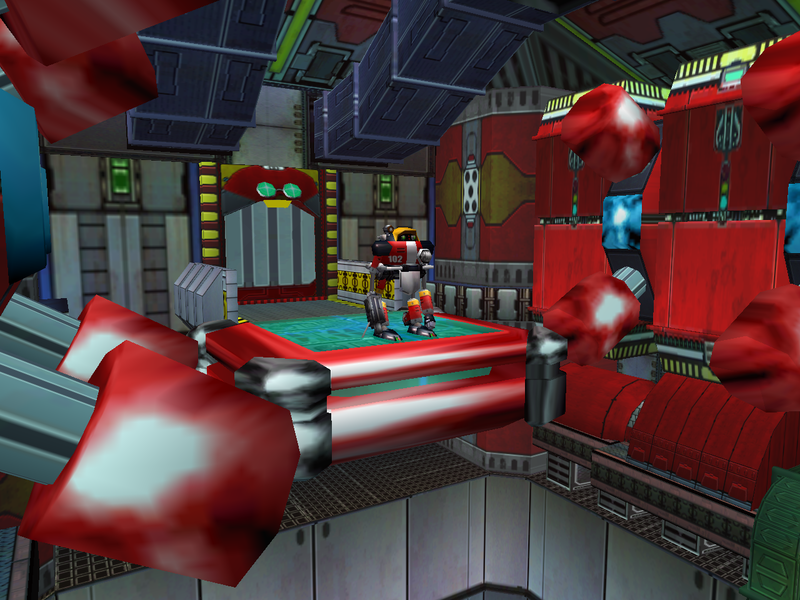 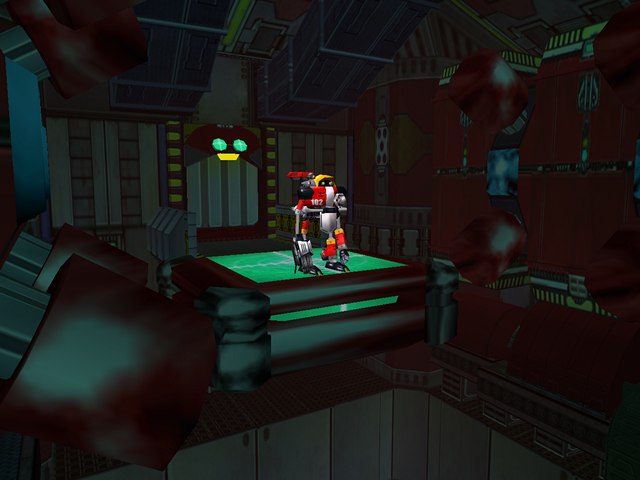 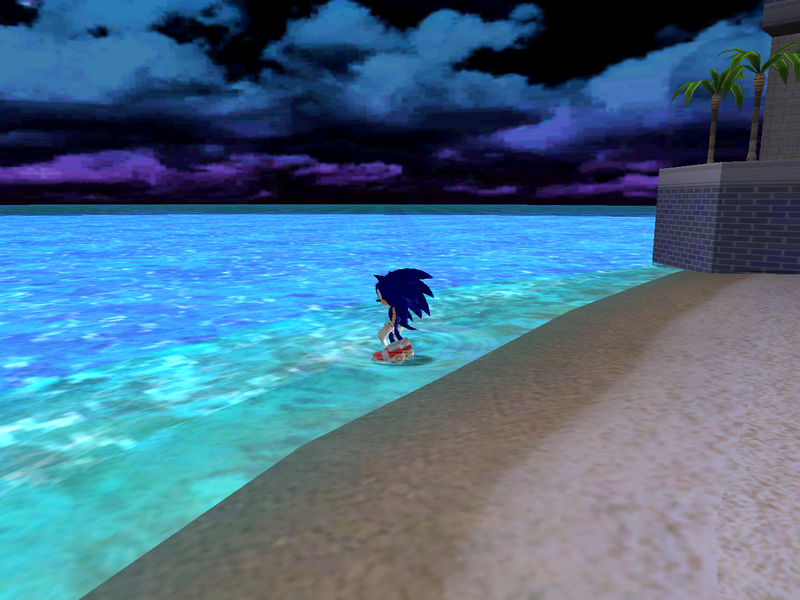 In conclusion, the Past has suffered from less downgrades than other areas in SADX, but loss of reflections and the unique two-palette fire effect make it a lot less impressive than the original level. 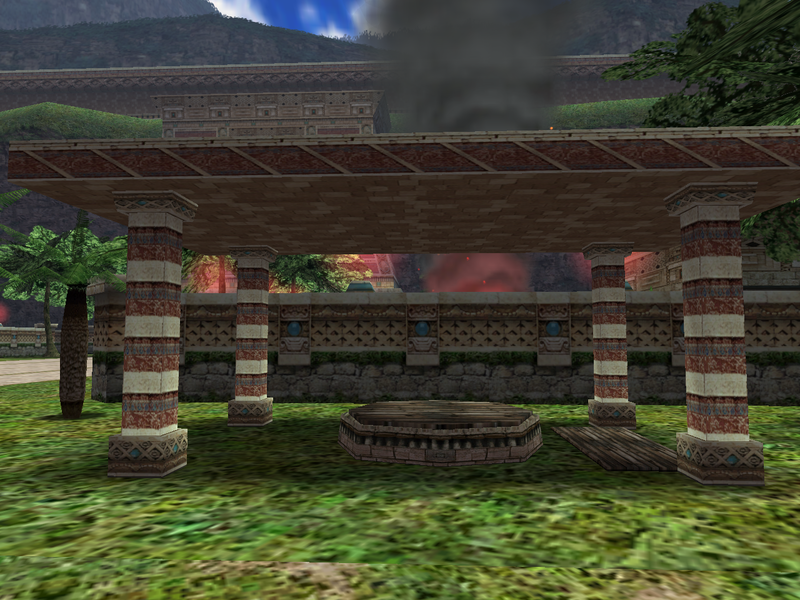 While it doesn’t look too terrible overall, the Emerald Altar area cannot be called an improvement over the Dreamcast version, which is clearly superior. 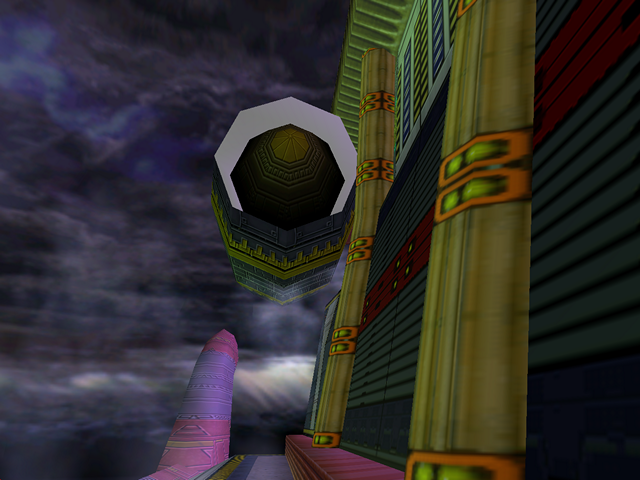 To revert to the original version of the level on PC, use the Dreamcast Conversion mod (which restores reflections), and the Lantern Engine mod that restores the fire blending effect. 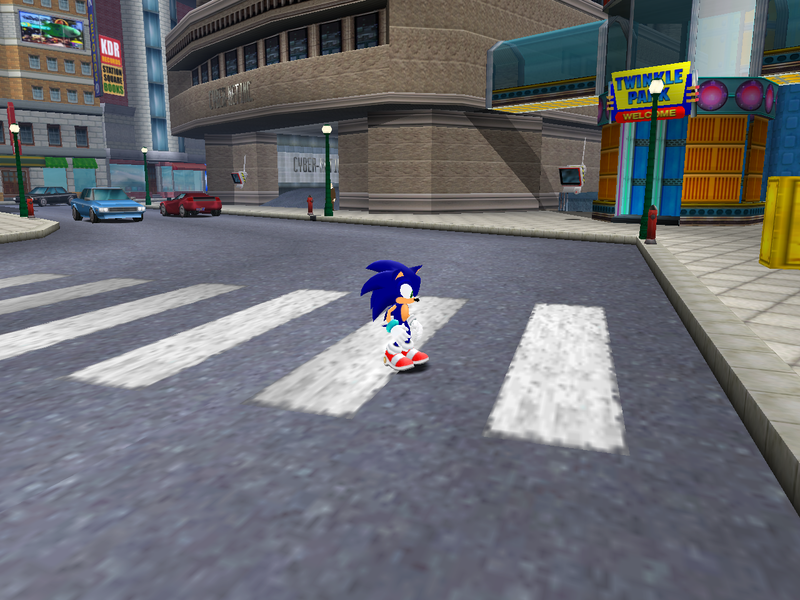 Read more about mods for the PC version here. 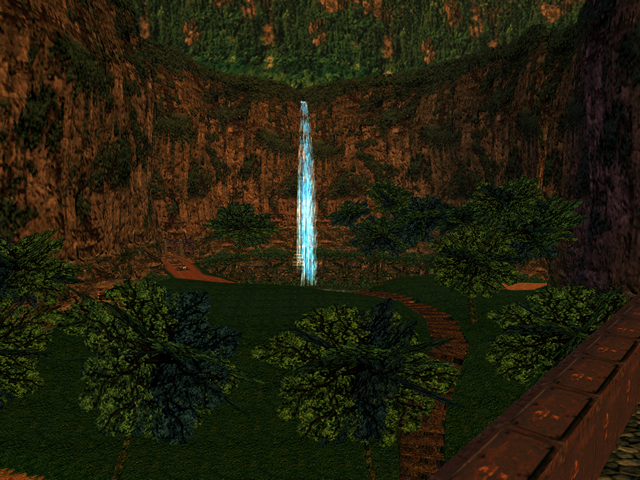 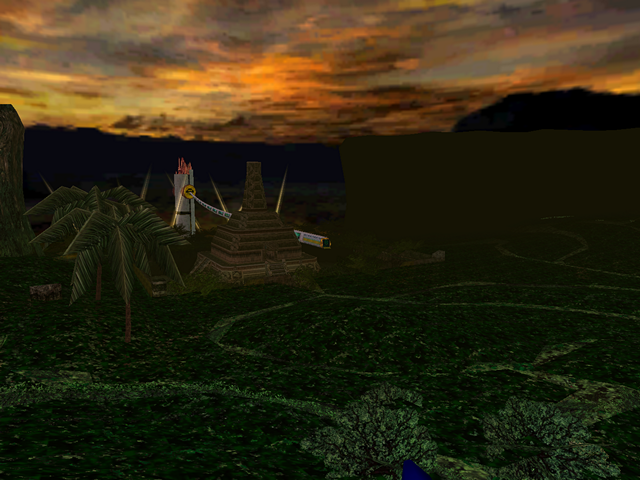 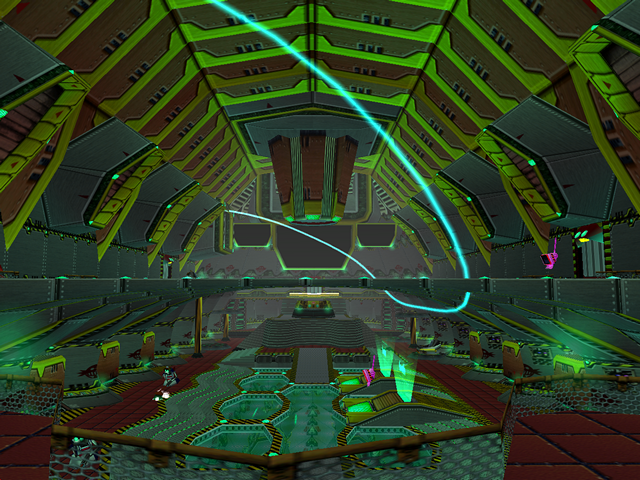 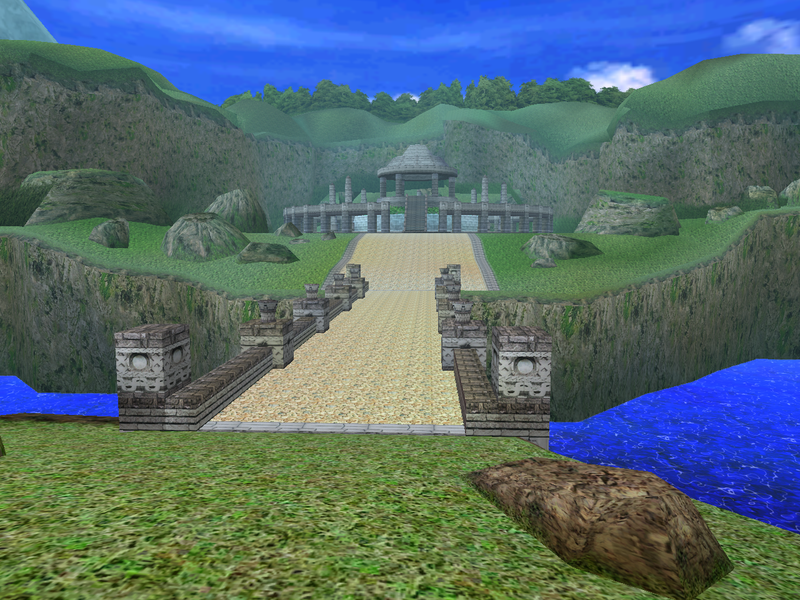 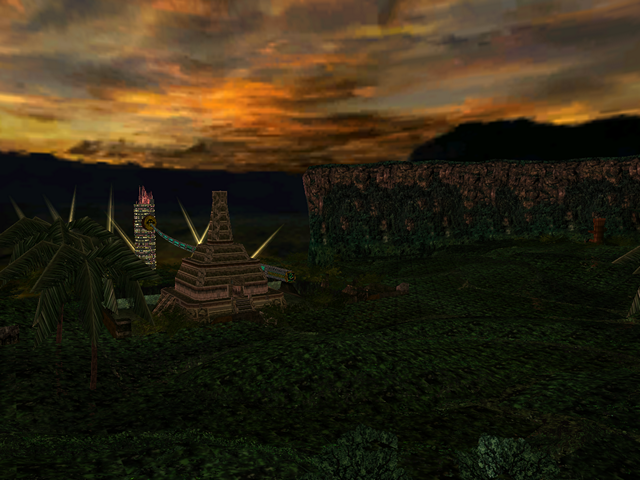 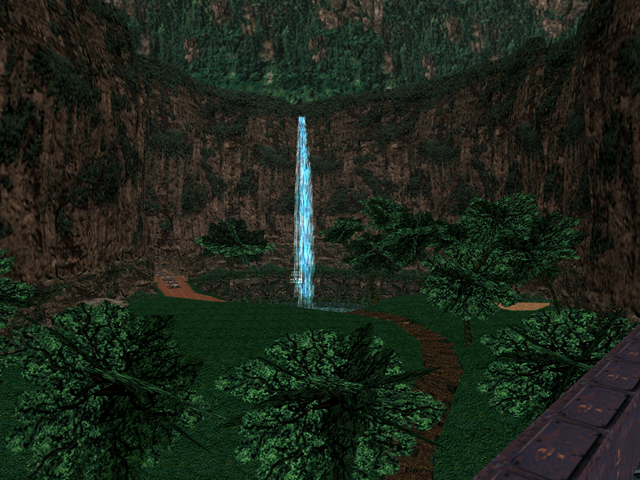 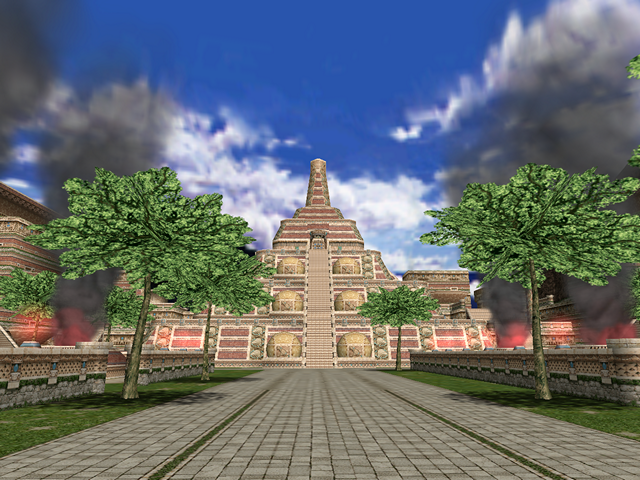 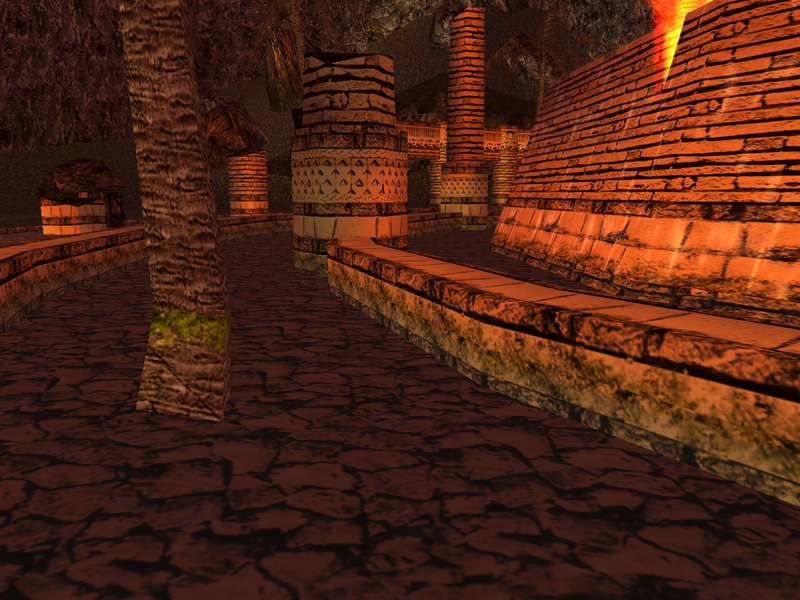 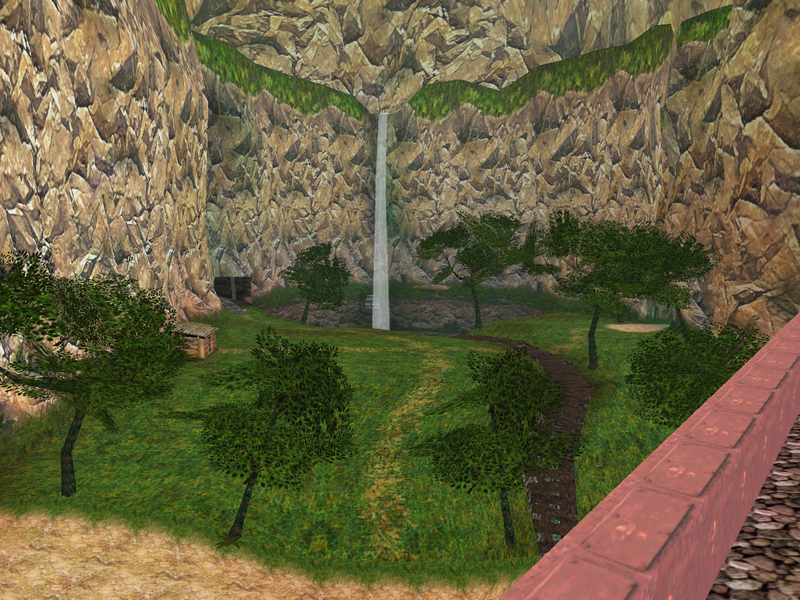 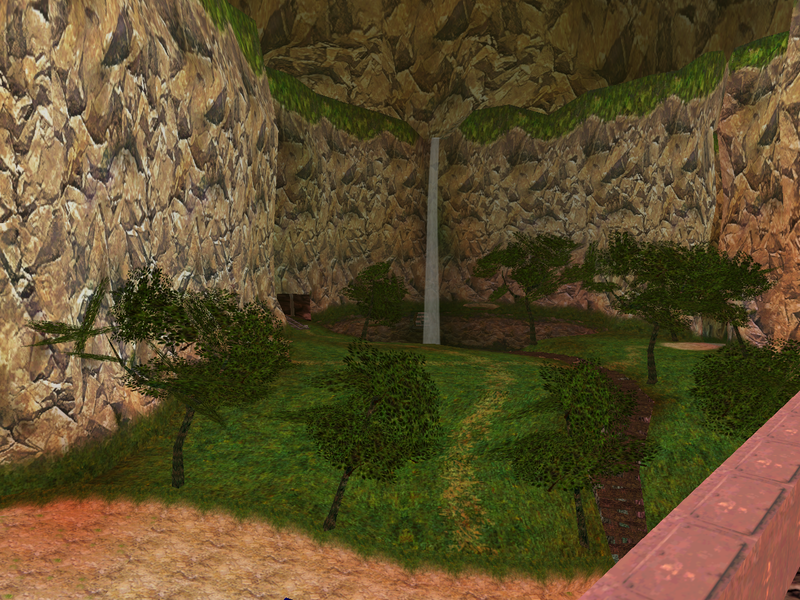 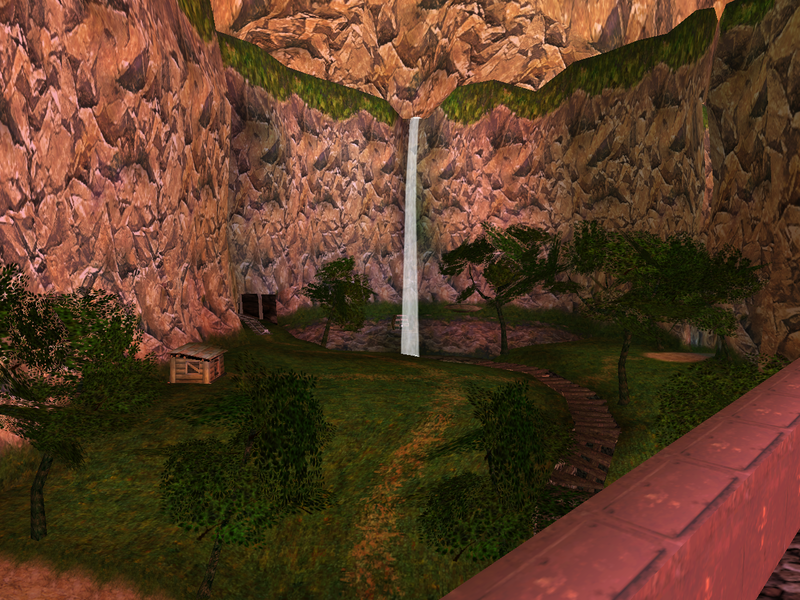 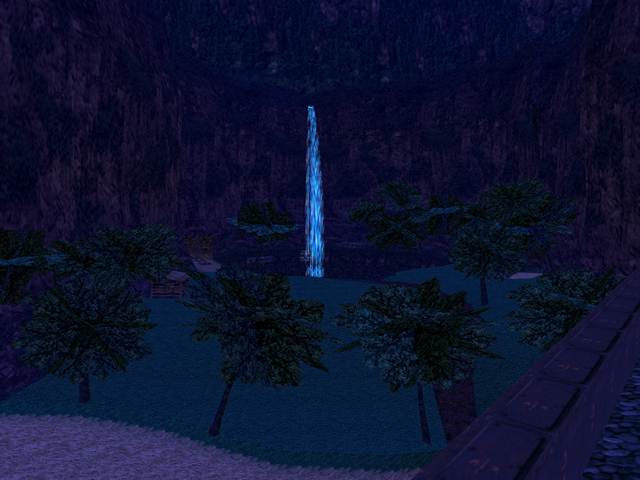 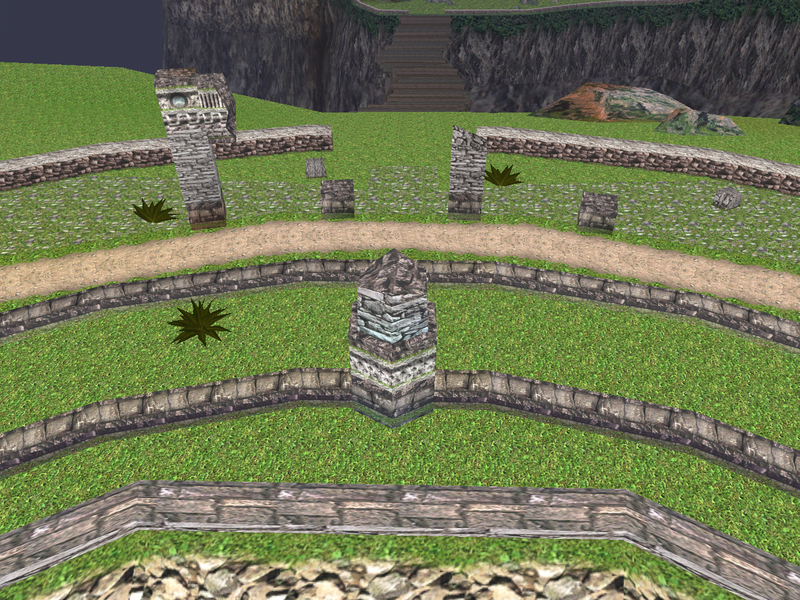 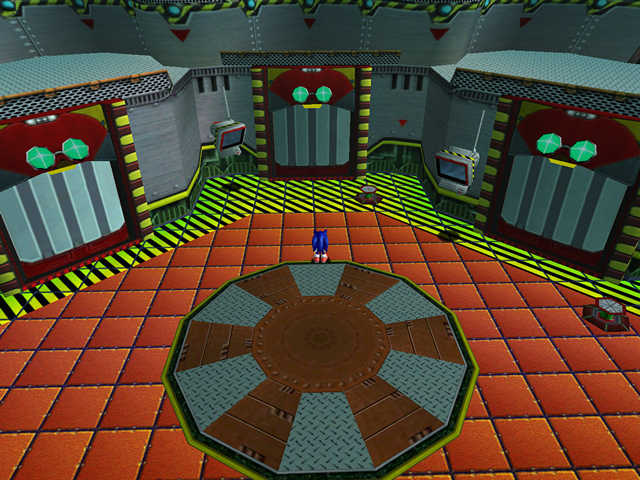 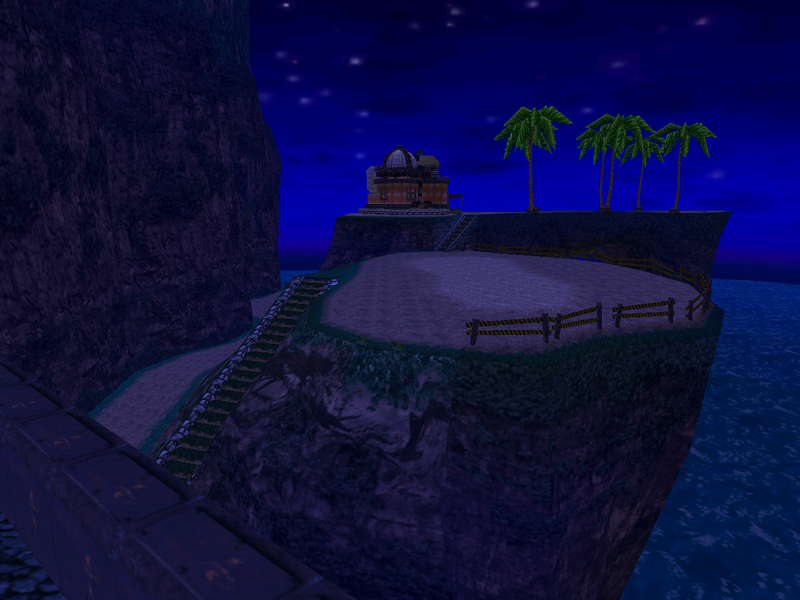 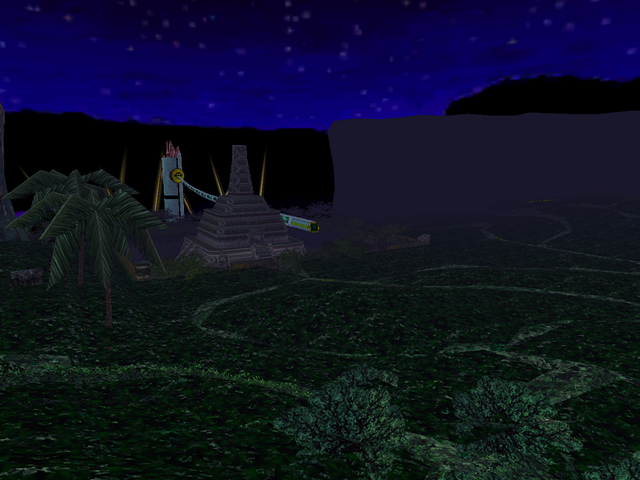 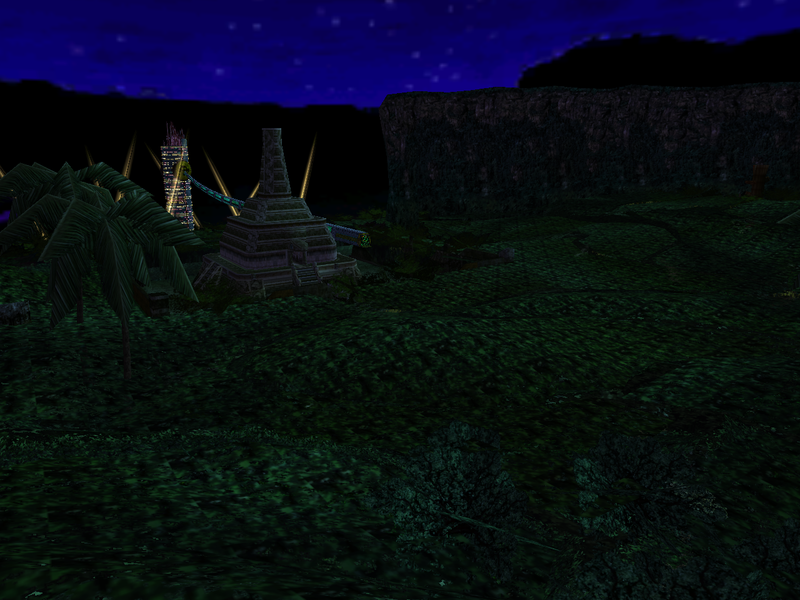 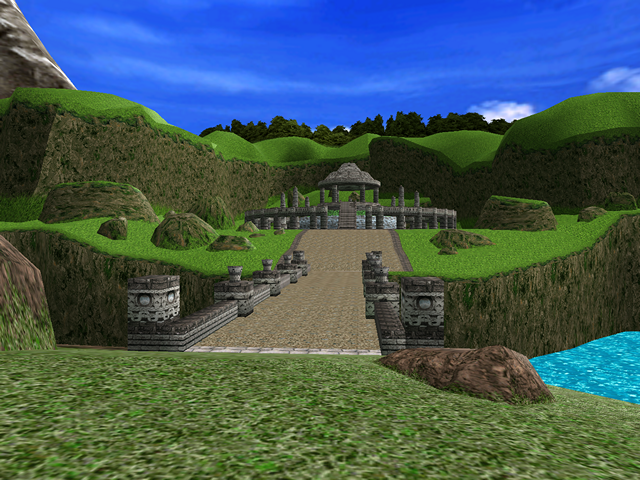 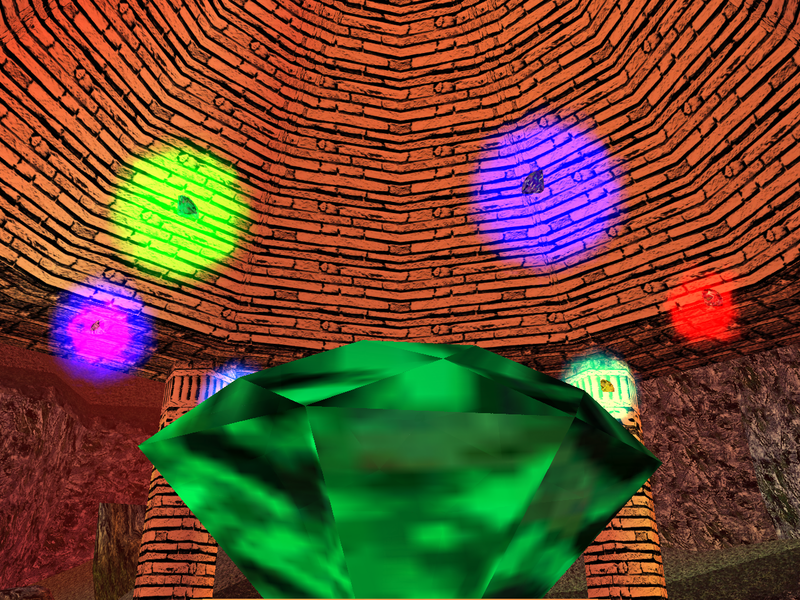 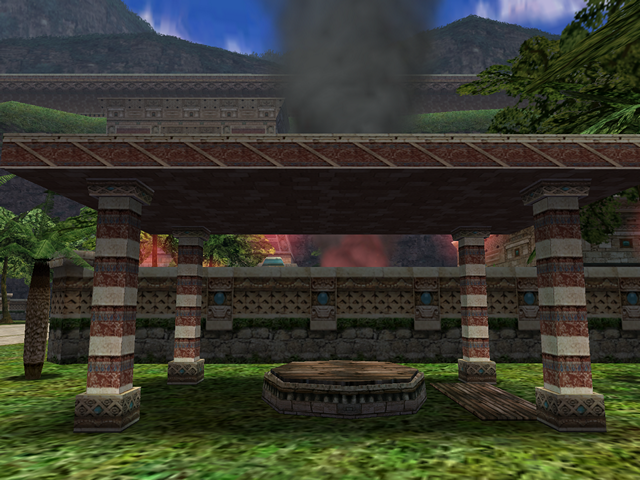 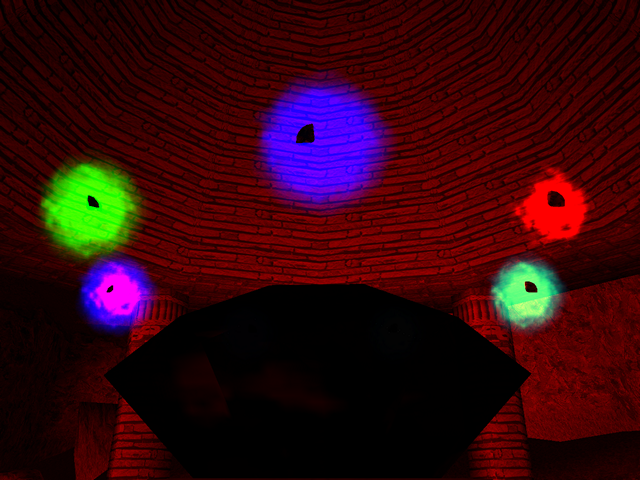 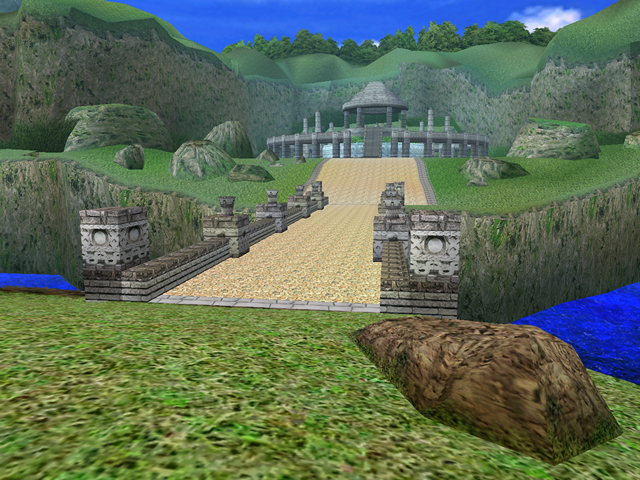 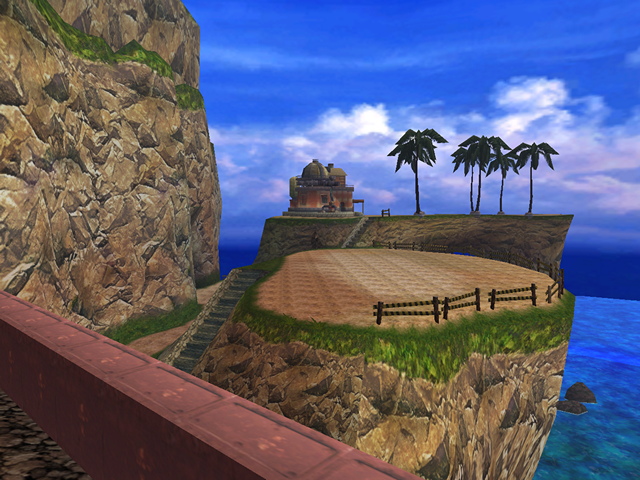 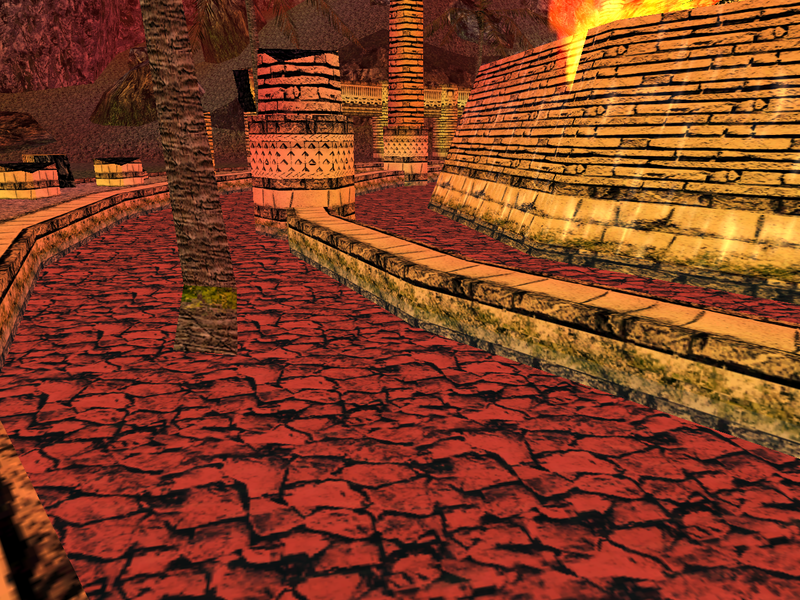 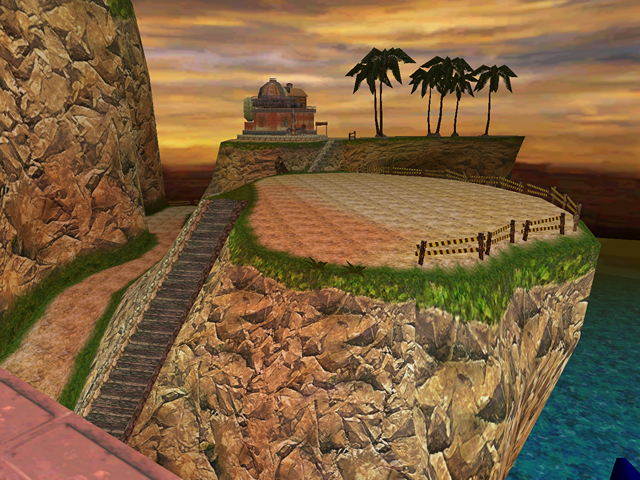 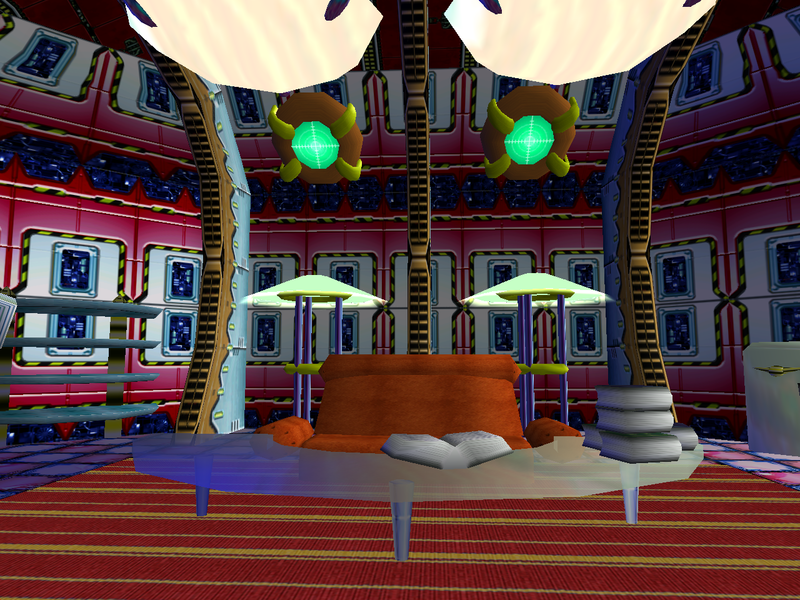 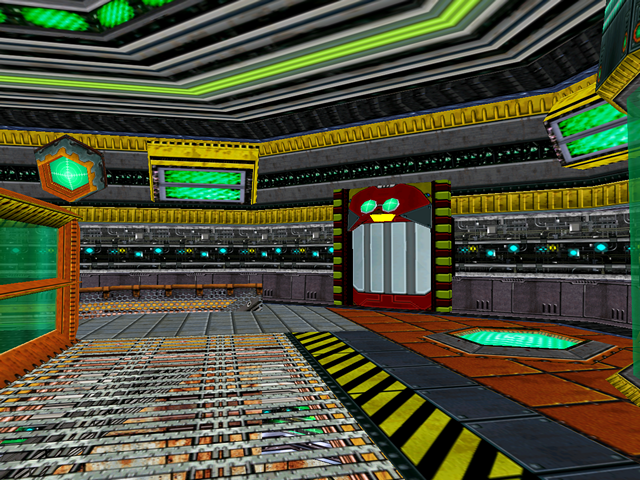 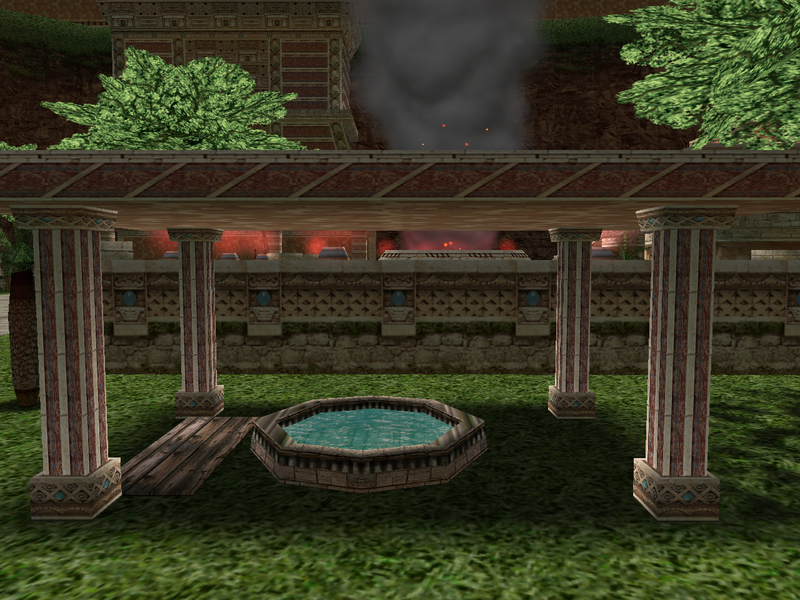 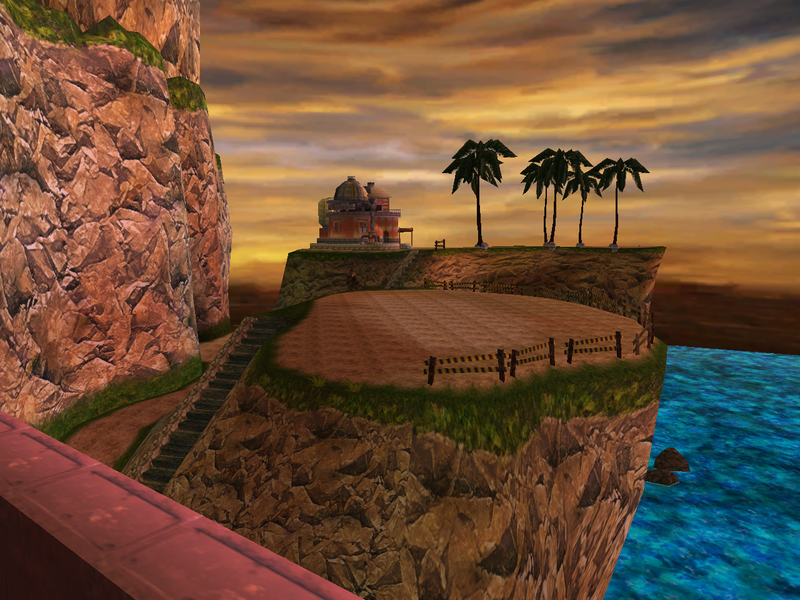 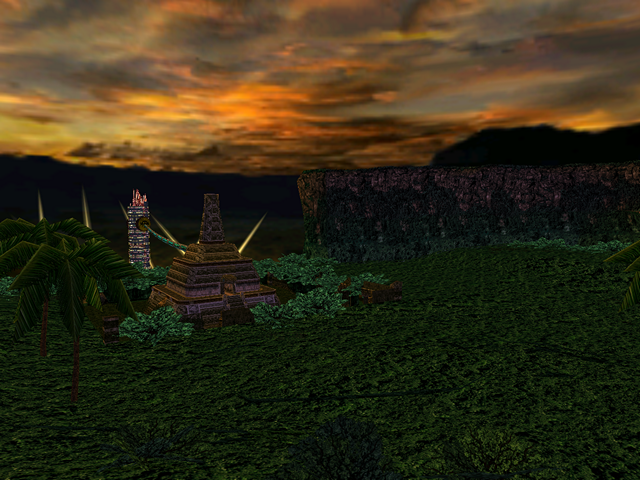 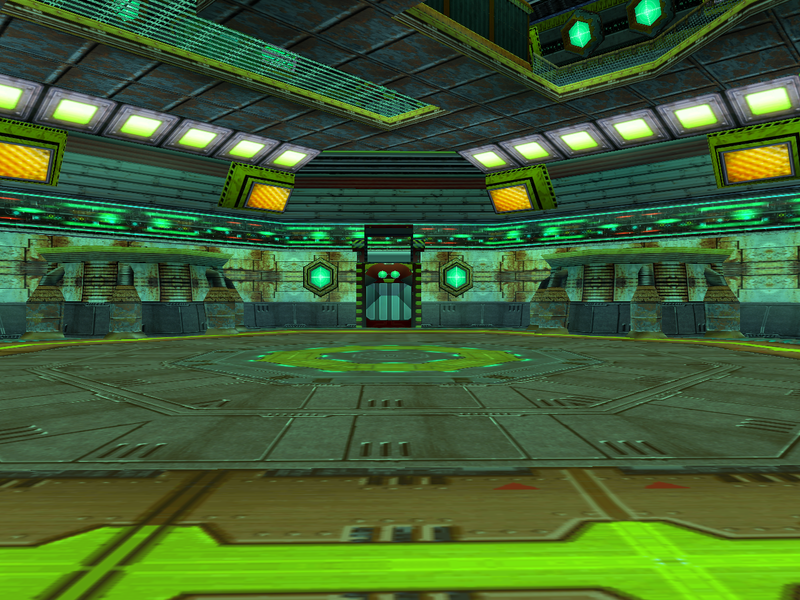 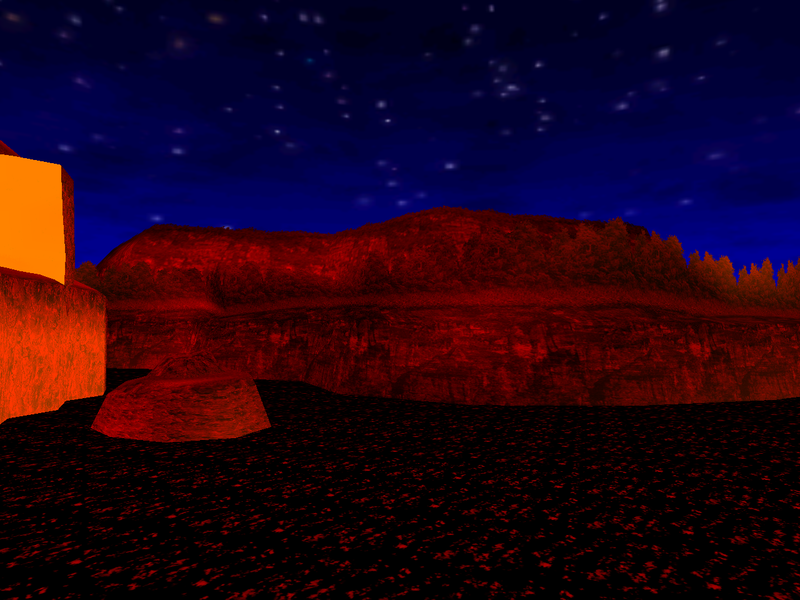 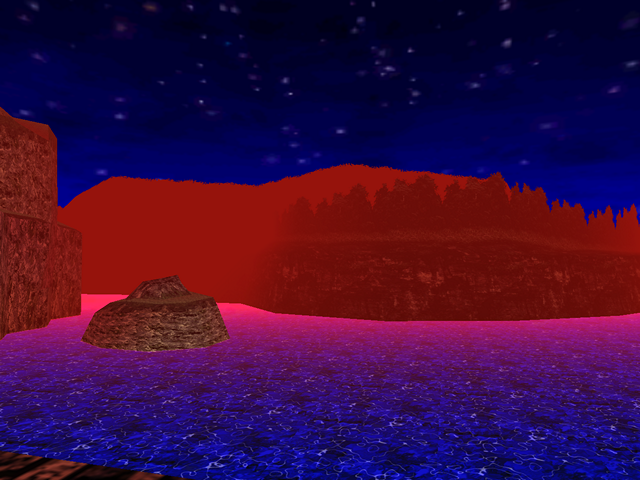 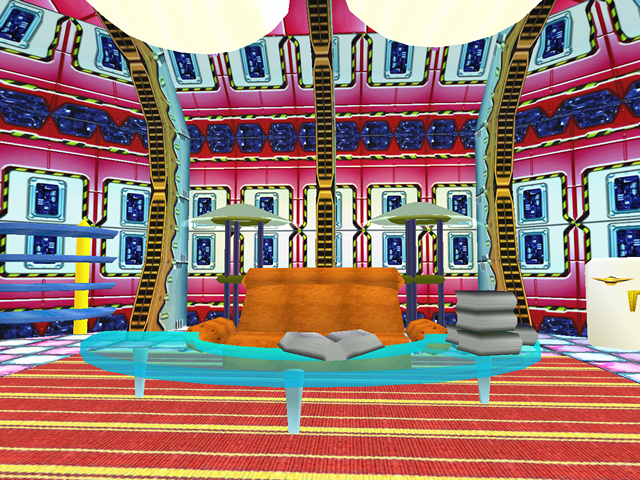 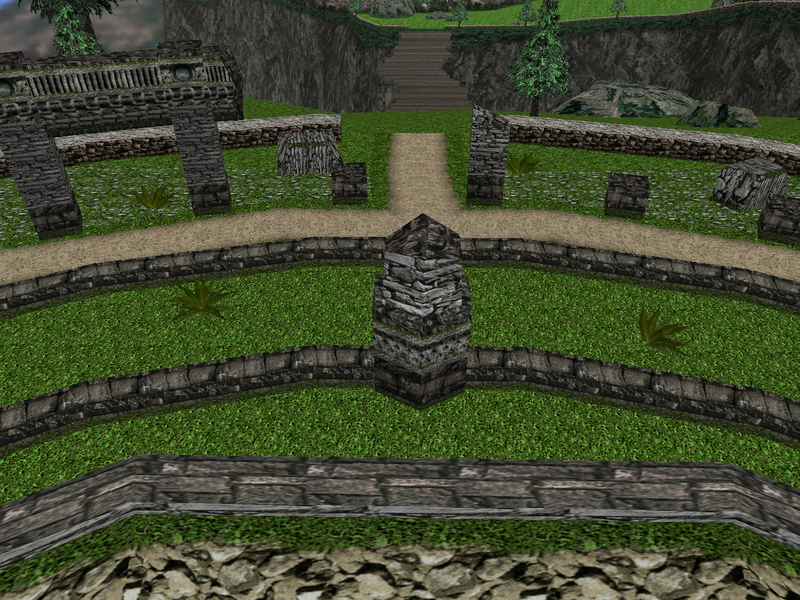 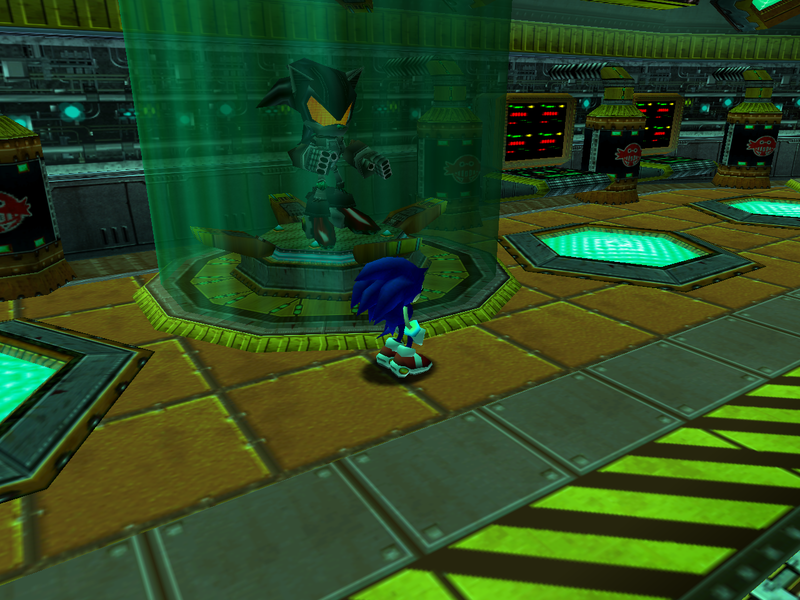 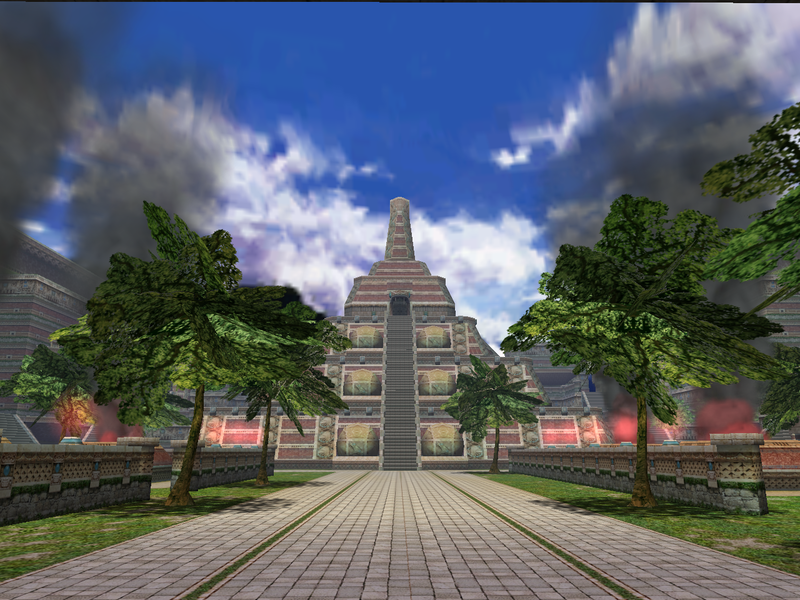 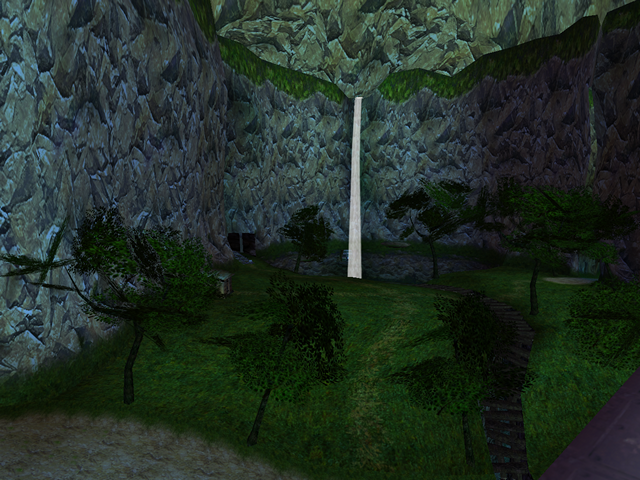 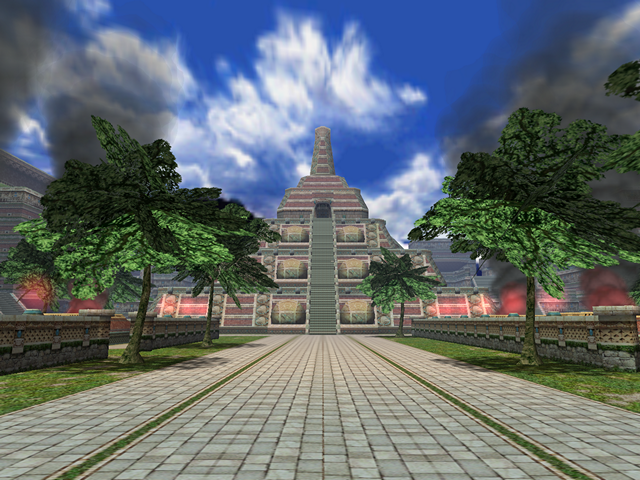 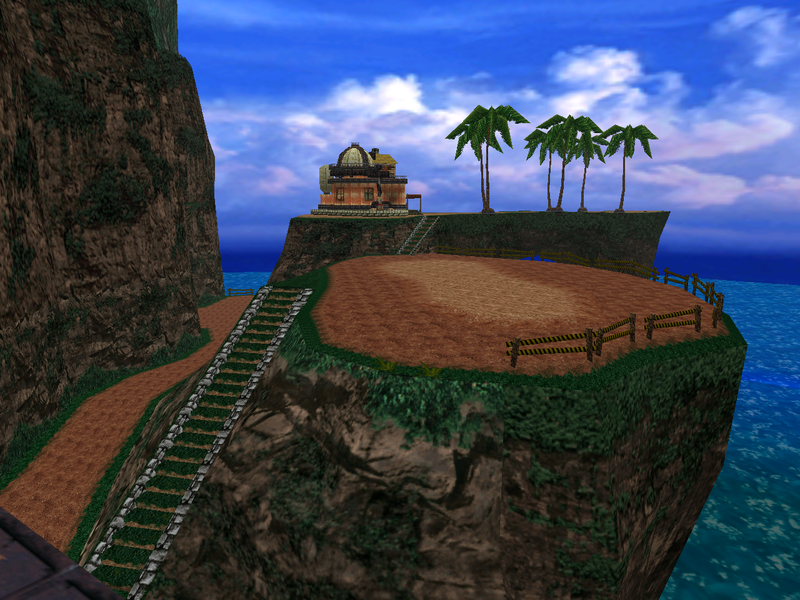 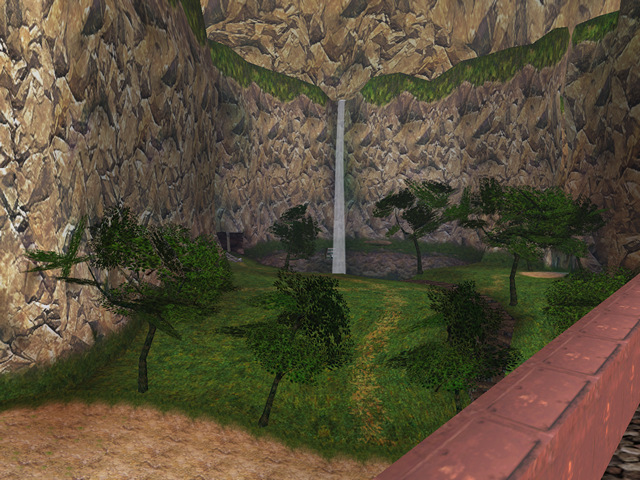 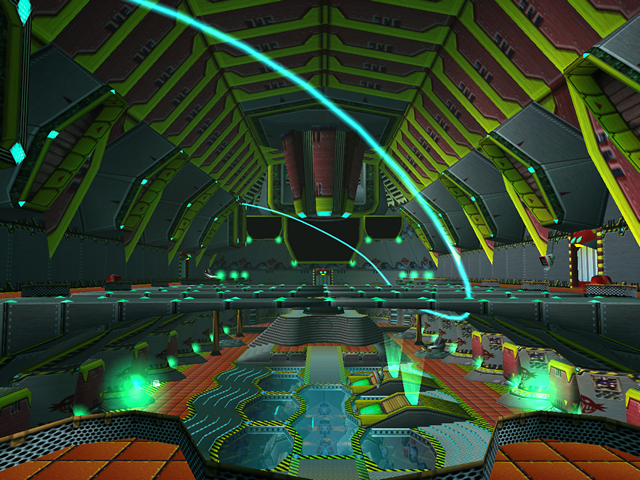 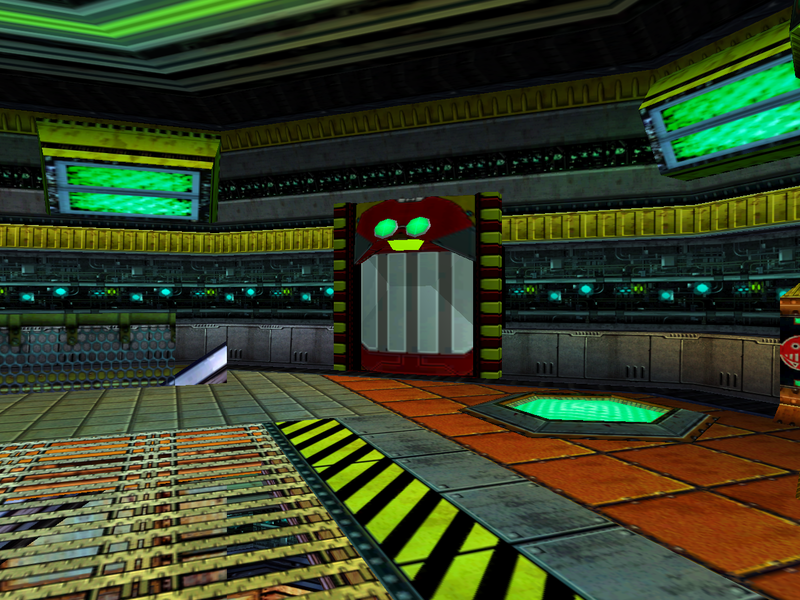 The Mystic Ruins were redesigned in SADX with new textures, particularly in the main area. While the new textures are not bad for the most part, the level has had several changes that can be considered downgrades. 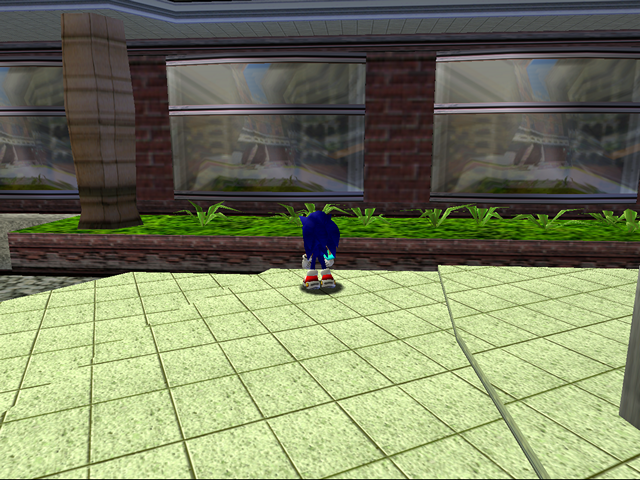 Much like elsewhere in SADX, those downgrades primarily have to do with lighting and transparency. 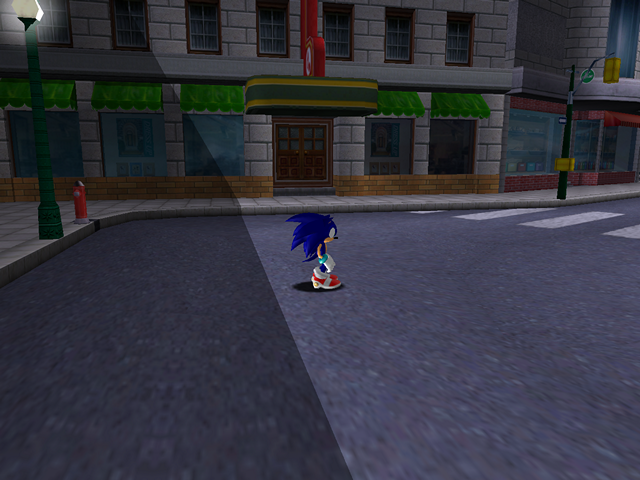 The differences in lighting are noticeable as soon as you arrive in the stage. 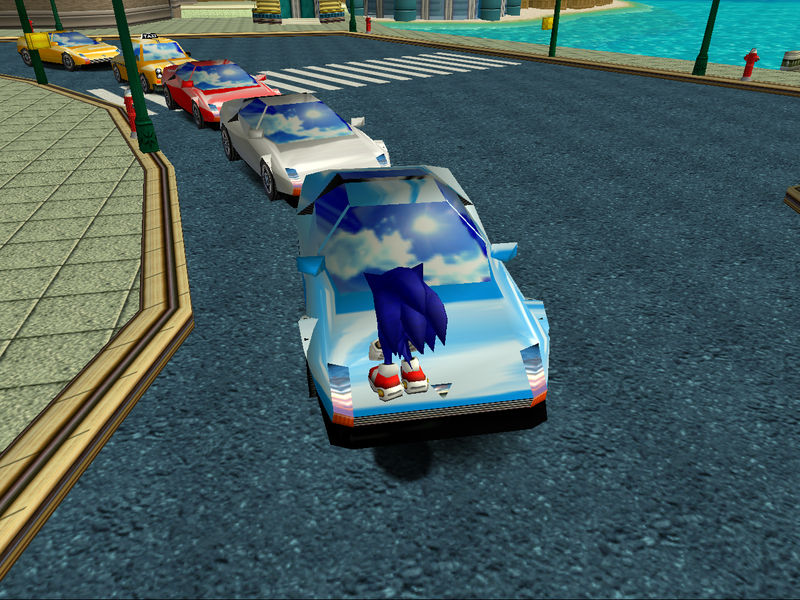 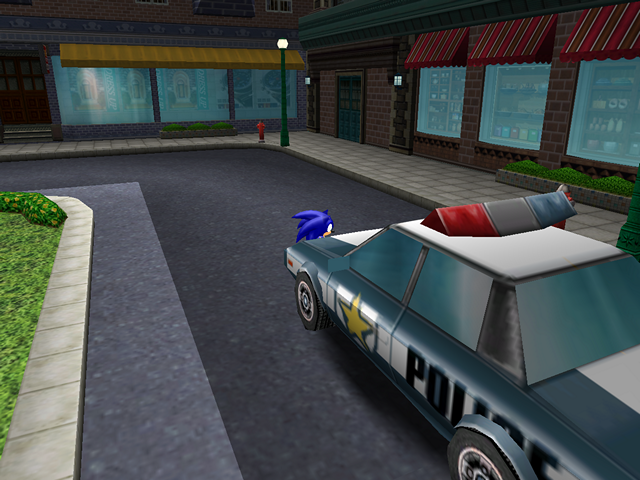 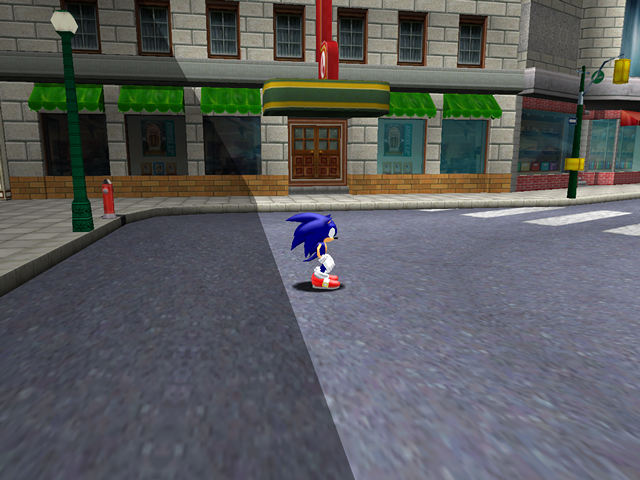 Note how the lighting on Sonic is simpler in SADX, and how the PC version looks almost the same during night and day. Here’s an overview of the main area, which received the most changes in the ports. 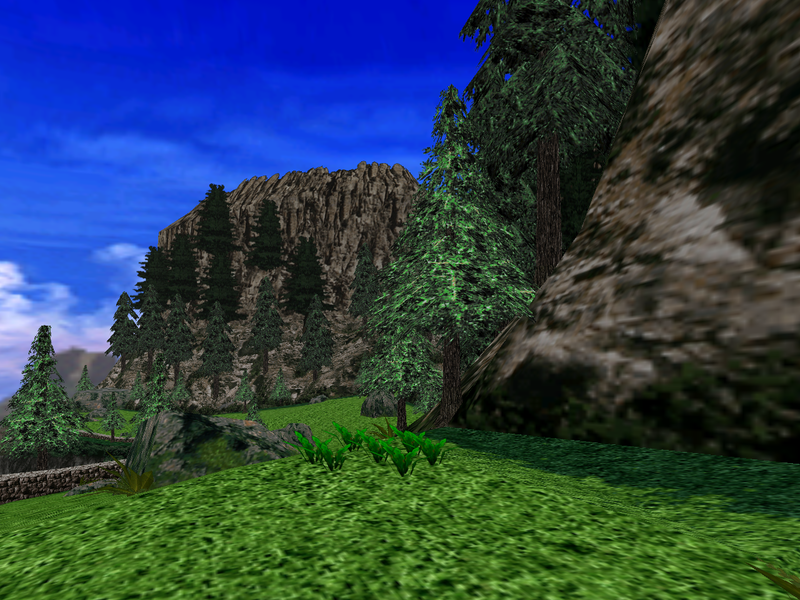 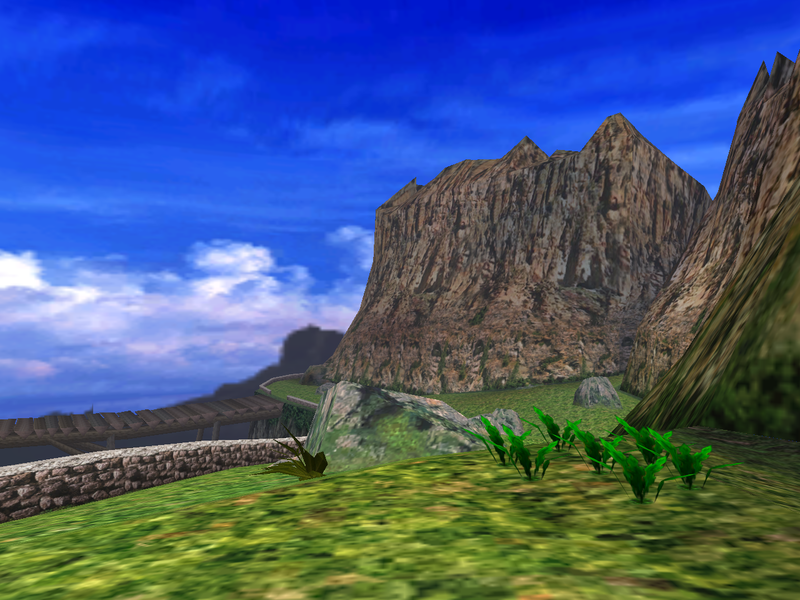 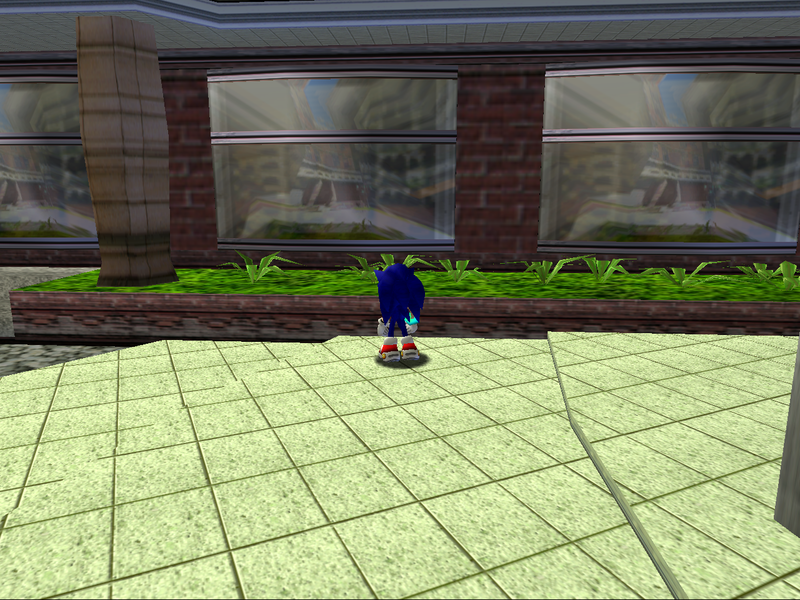 Some people may prefer the more “detailed” land textures in SADX. 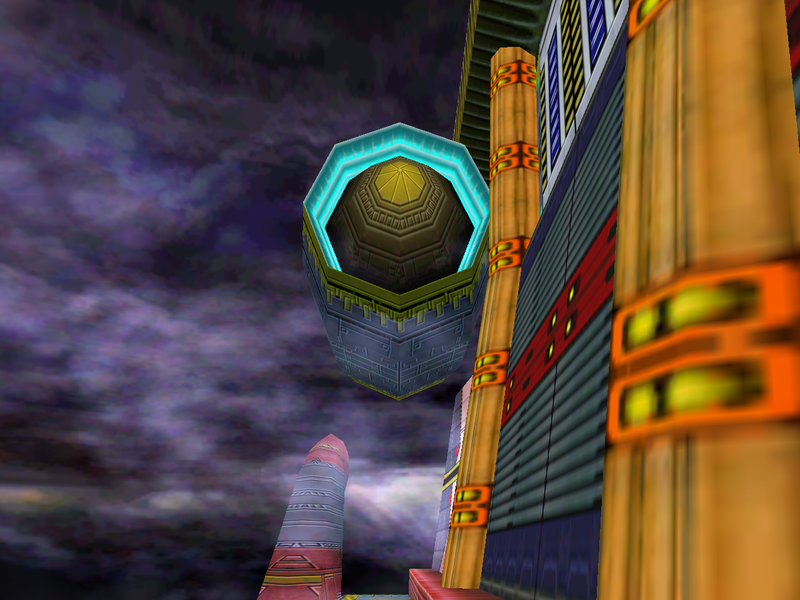 The lighting in the Gamecube version is a lot better than in the PC version, although it still looks a bit too bright at night. 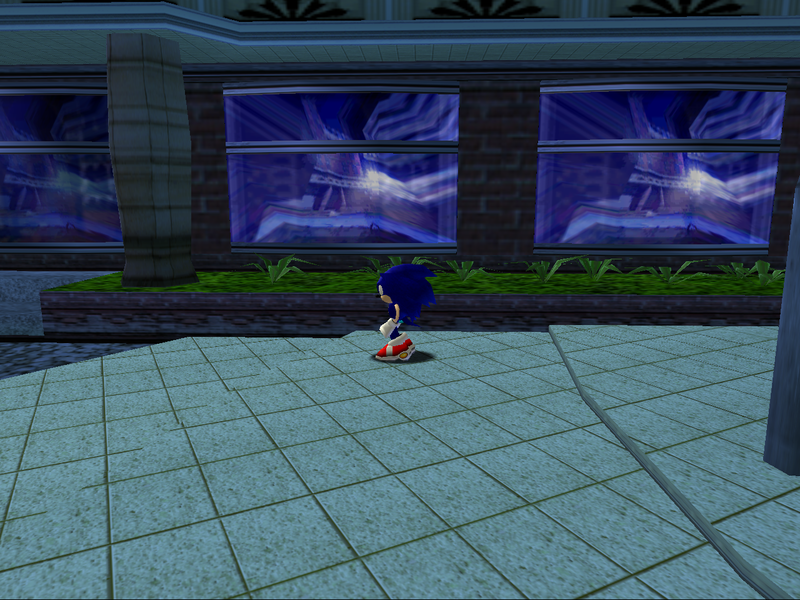 In the PC version you can’t easily tell which time of day it is because all screens look almost the same. The Egg Hornet area was also redesigned. 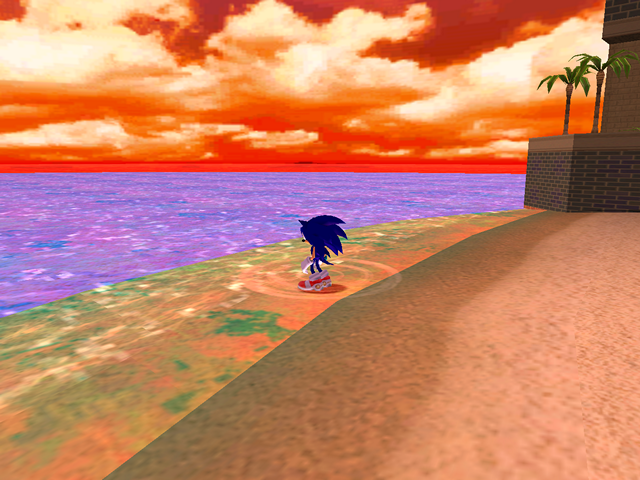 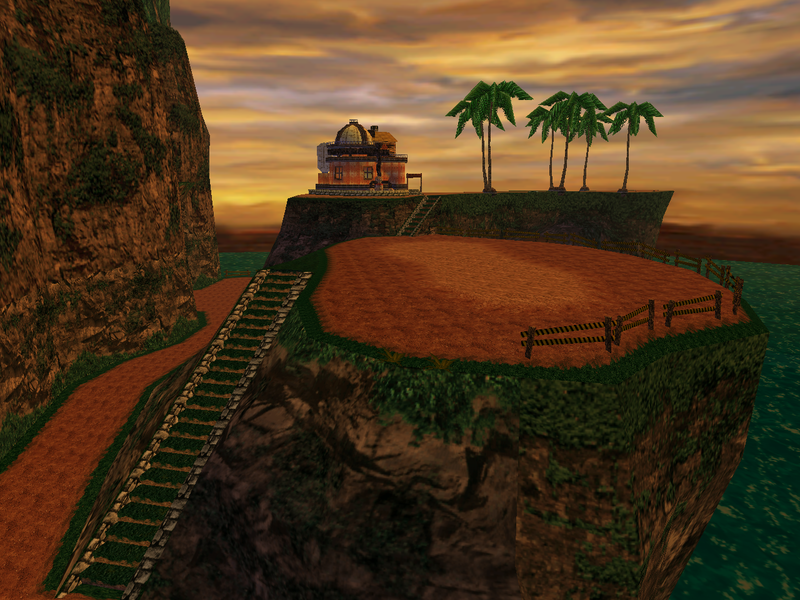 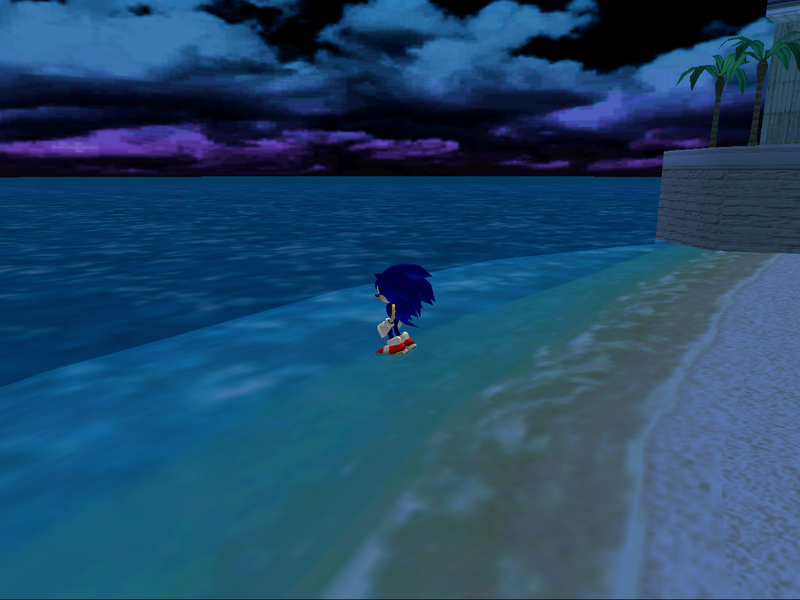 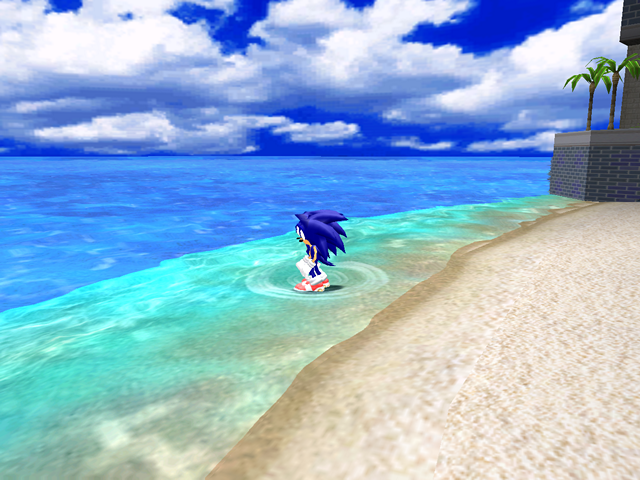 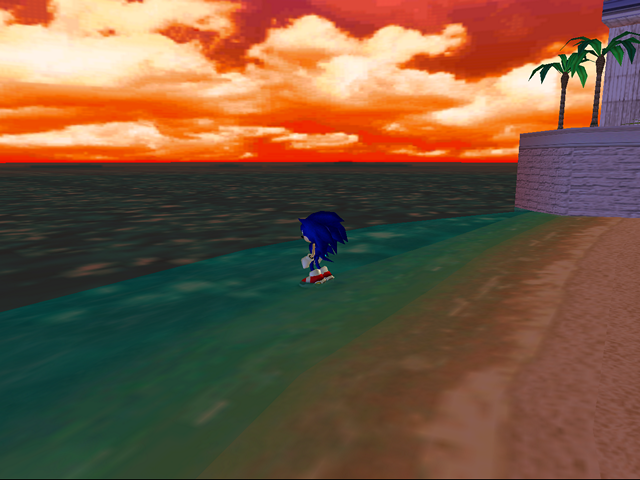 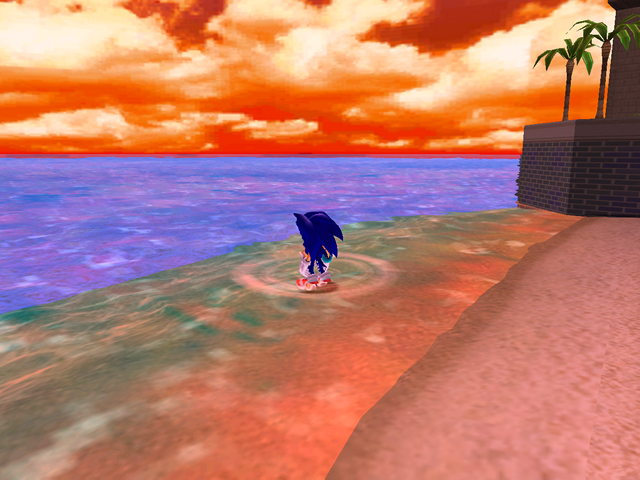 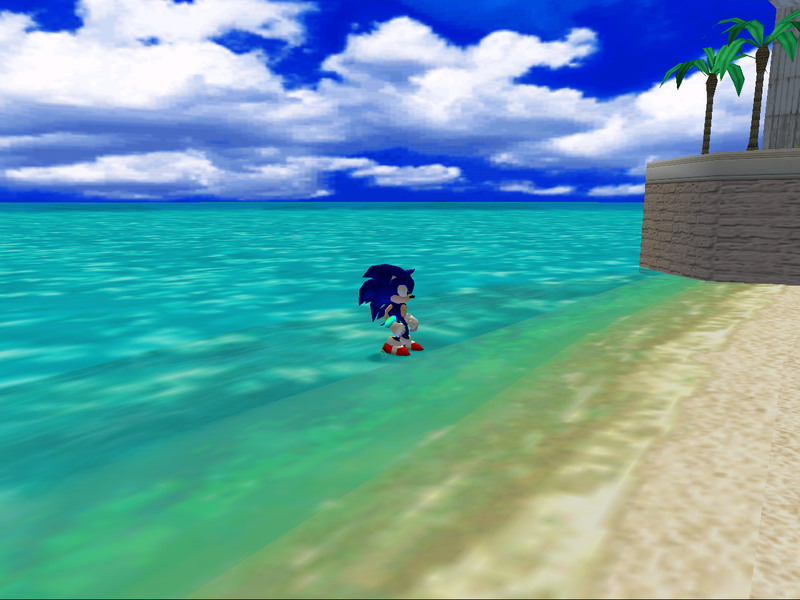 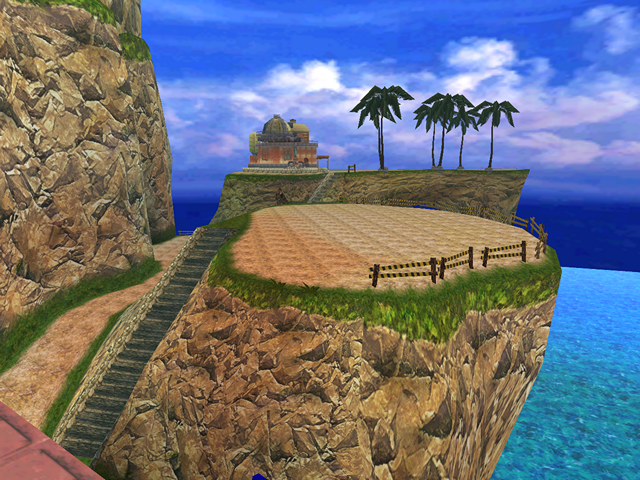 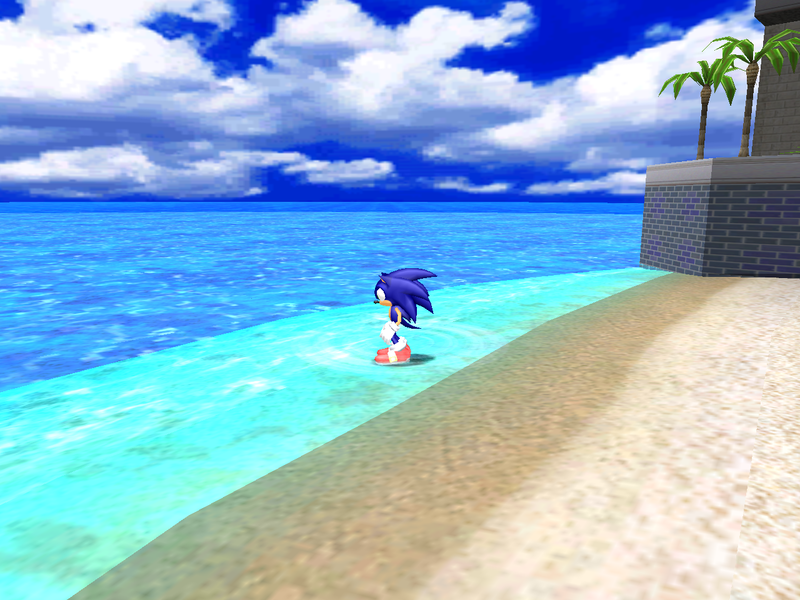 The palm trees in the Dreamcast version ignore lighting for some reason, which is fixed in SADX. 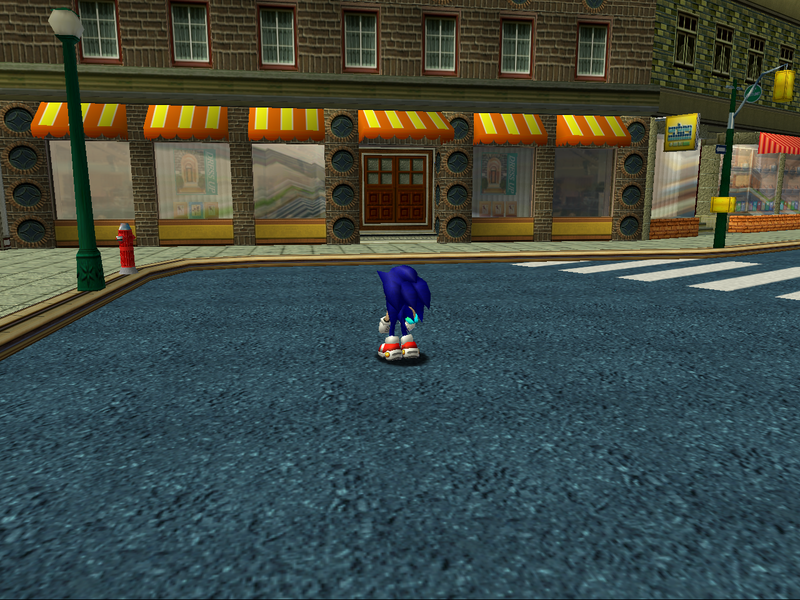 The Gamecube version looks fine, but the PC version has broken lighting. The land in the PC version looks lit up in the evening and at night, and you can only tell the time of day by the sky texture. 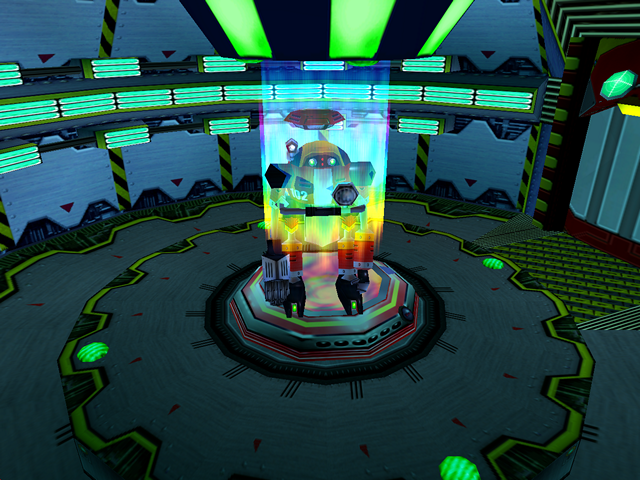 This plant was changed in the ports, and its transparent parts were replaced with copies of non-transparent parts. 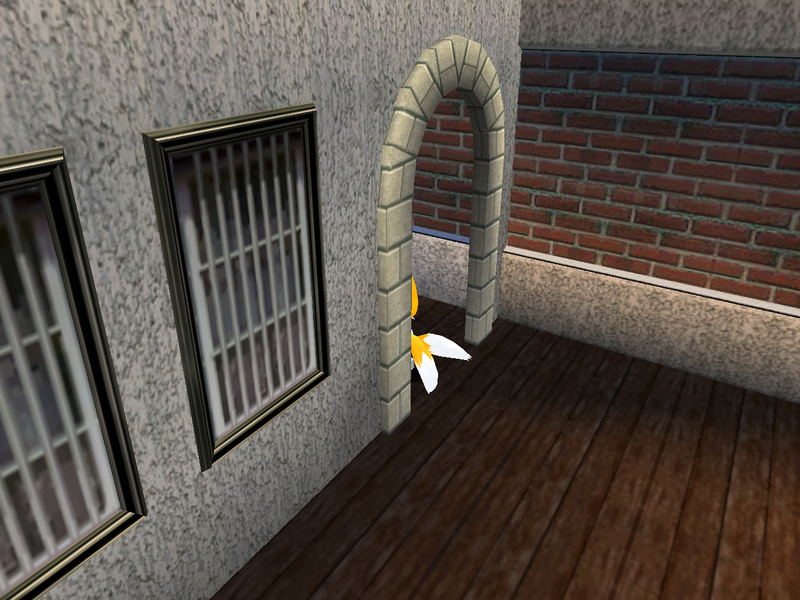 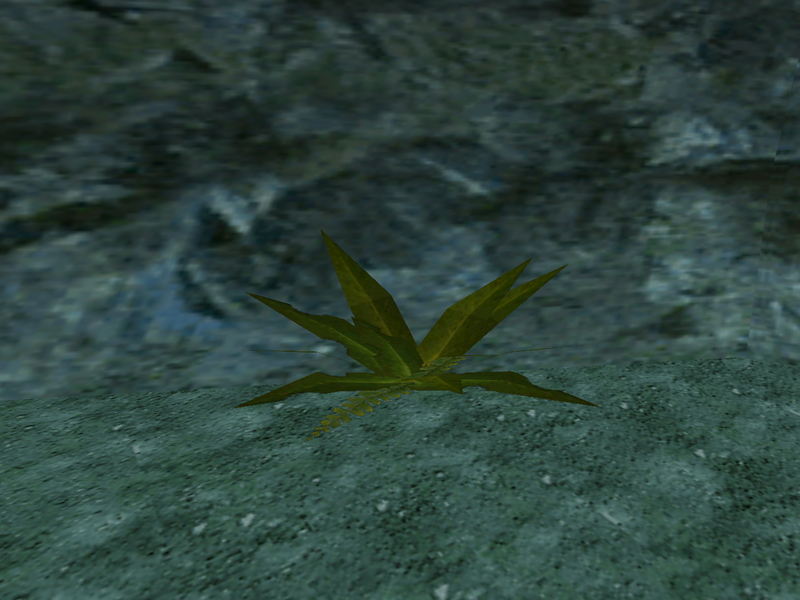 Since the original model for this plant works fine in SADX as-is, it was unnecessary to replace it. 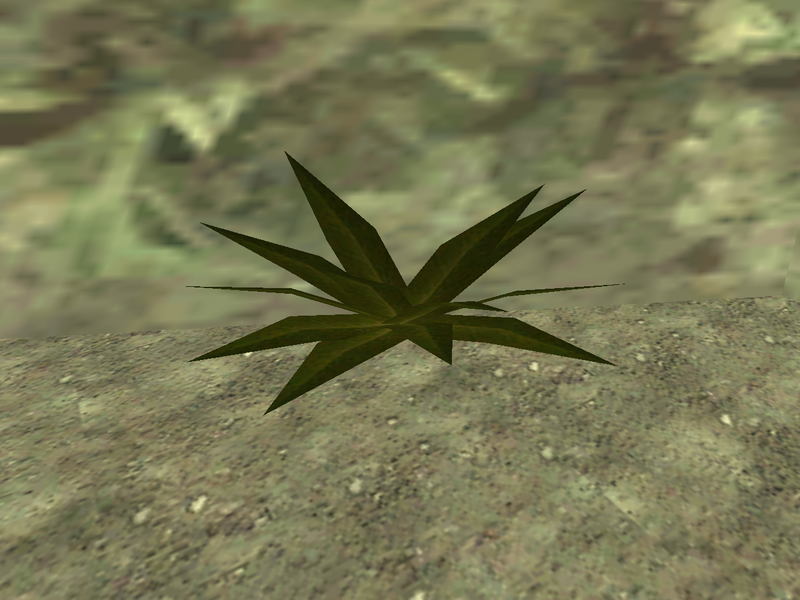 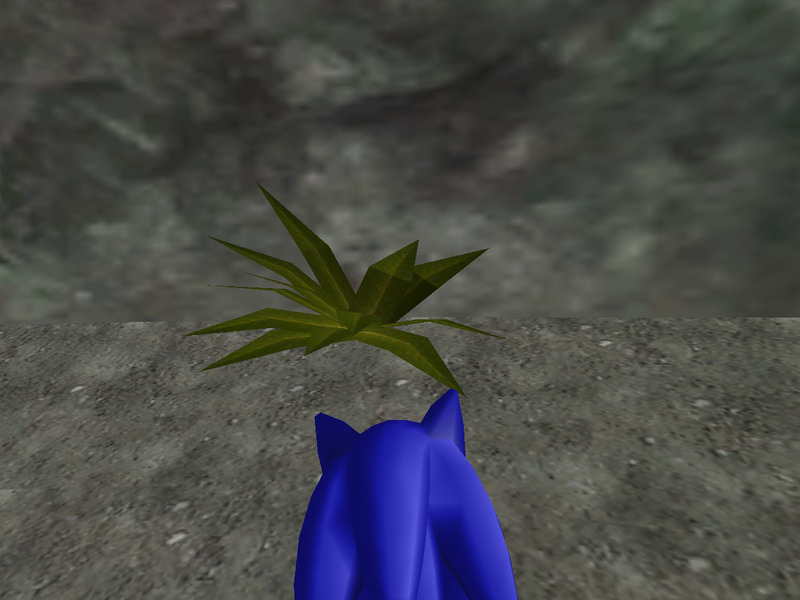 In addition, the rustling grass sound made by this plant no longer loops in SADX. 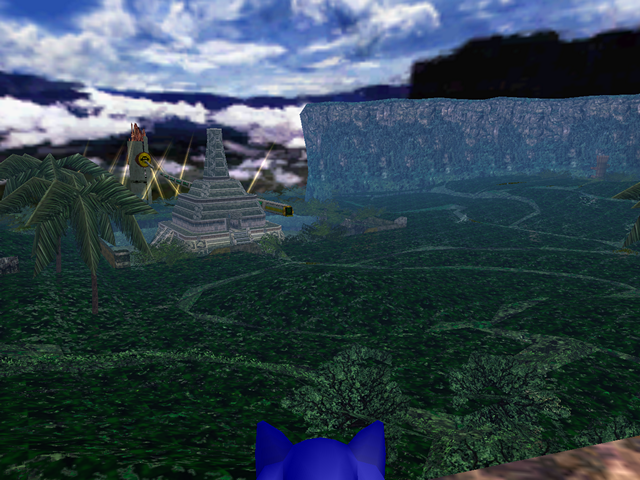 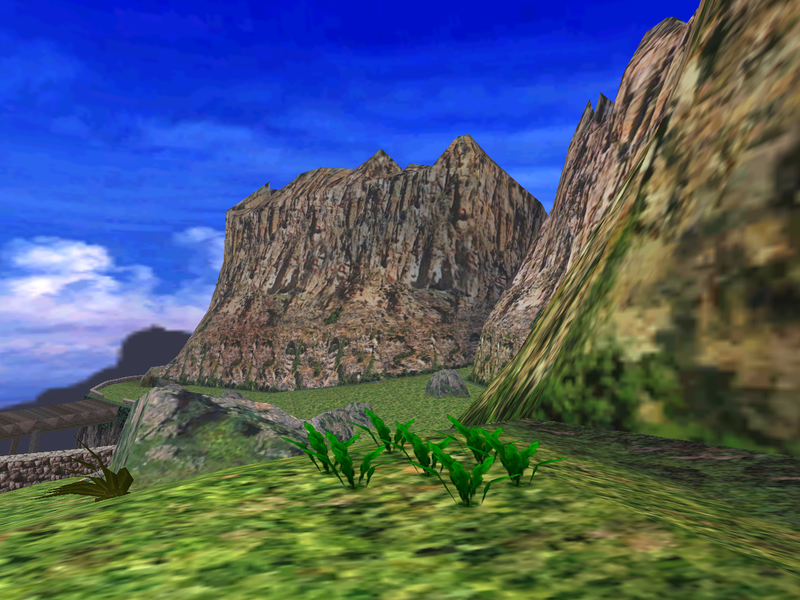 The jungle area is also different in SADX. Some of the differences can be considered downgrades. 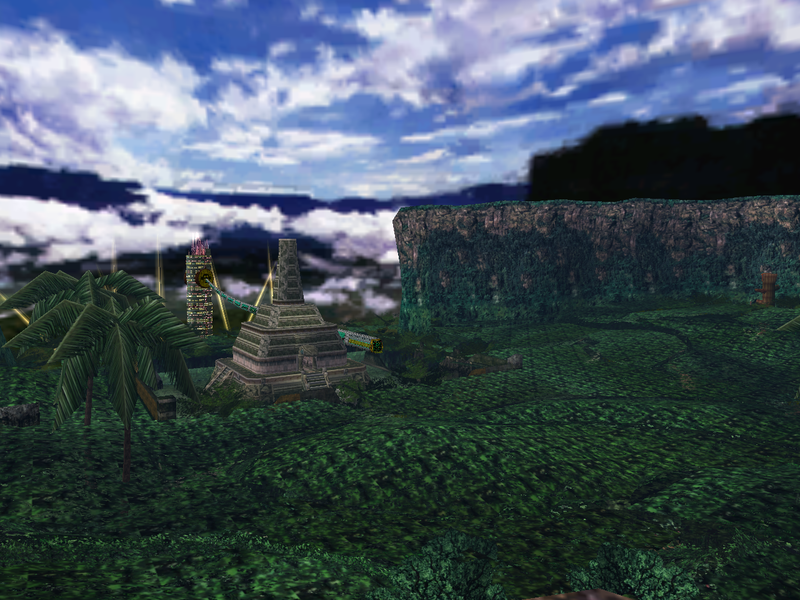 The original game uses fog to enhance the atmosphere: for example, when you descend into the jungle, the fog thickens and you can’t see too far, but if you climb up or go to the temple area, the fog gradually disappears. 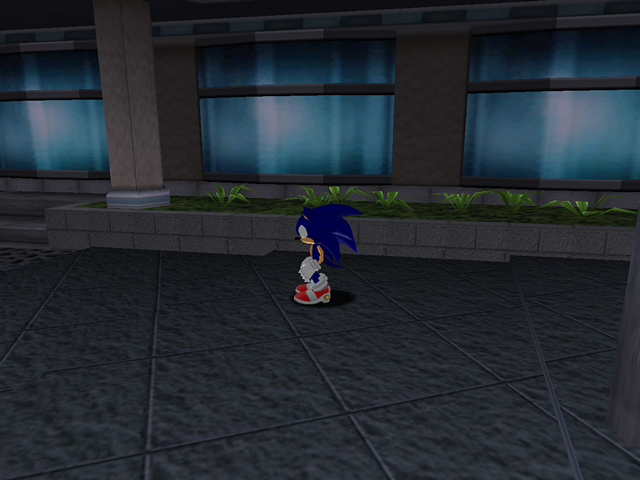 This effect is removed in SADX. 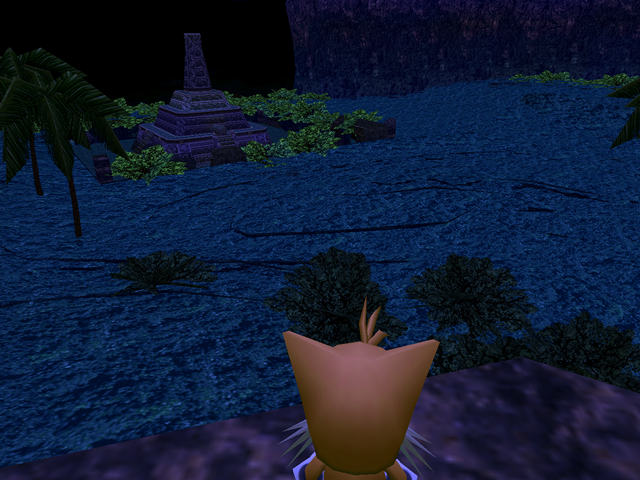 The fog is especially problematic in the PC version, where it washes out distant colors when looking at the jungle from above. 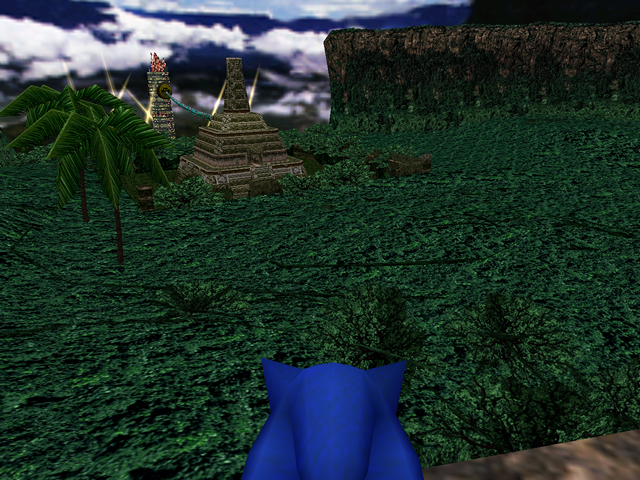 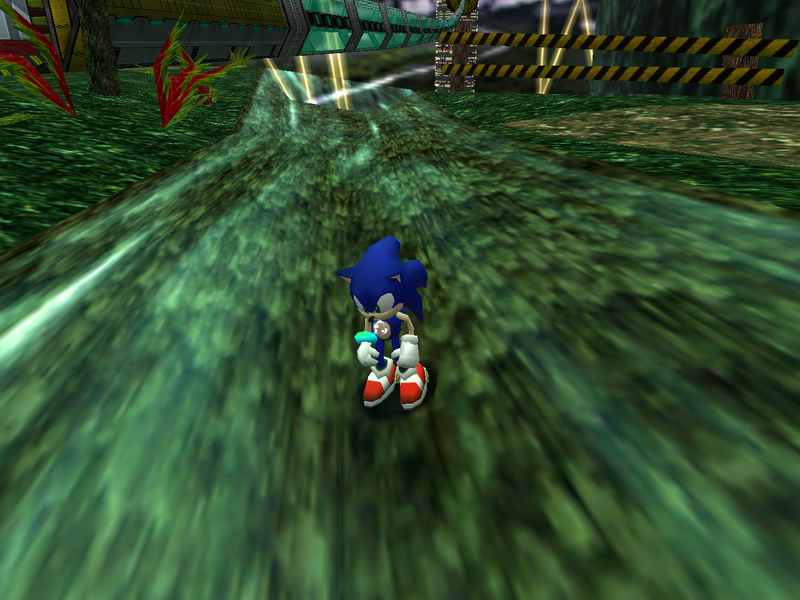 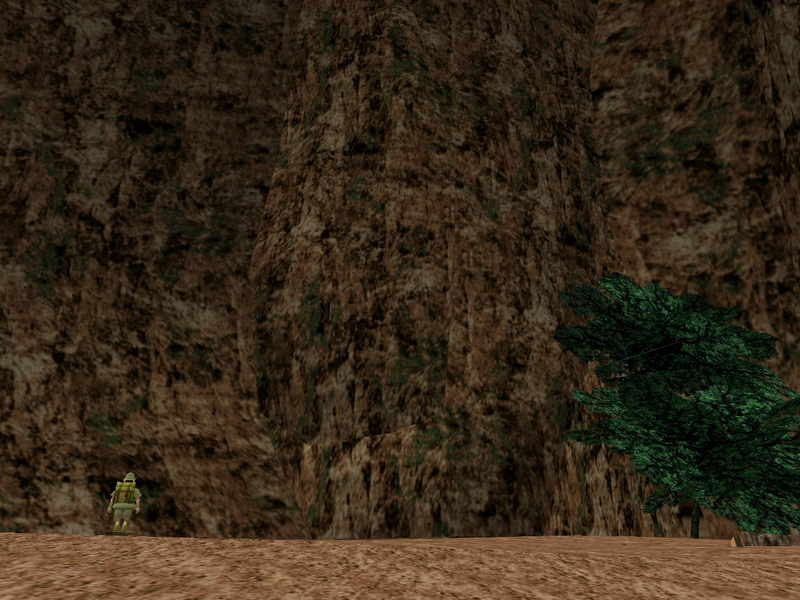 The top part of the jungle uses a lower resolution texture in SADX, but the models are less flat. The PC version completely ruins the jungle with broken lighting, fog and unnecessary material colors. 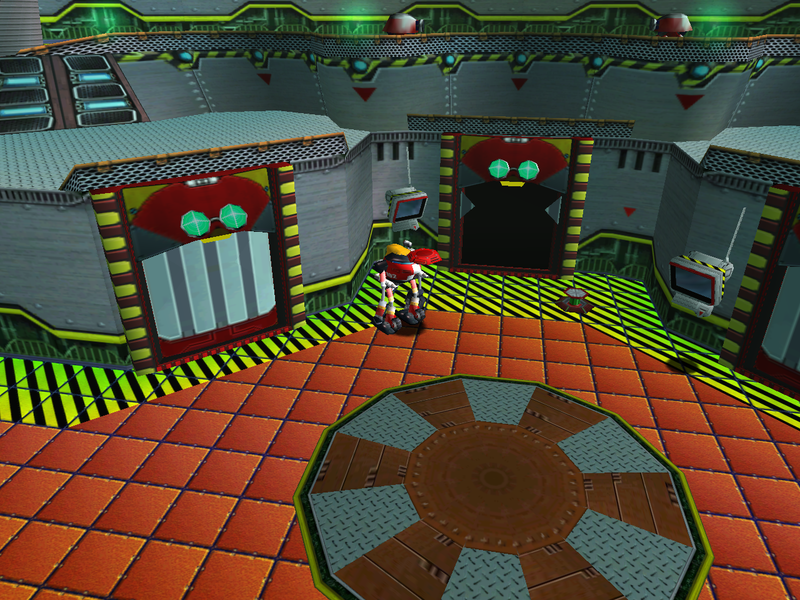 In addition, the SADX jungle entrance was not adjusted in the ports so it now clashes with the SADX redesign of the main area. 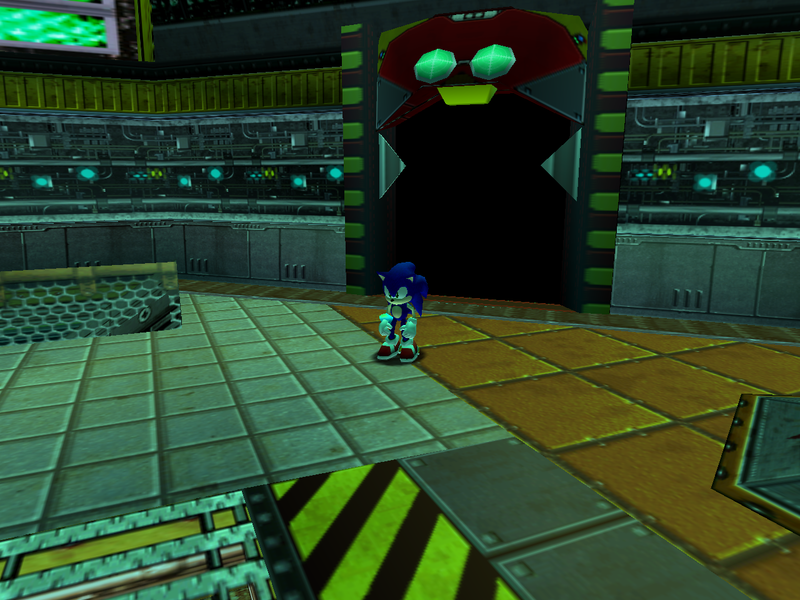 The Final Egg base model has transparency problems in all ports, which are more prominent in the PC version. The light beams don’t render properly and go behind the glow effect. 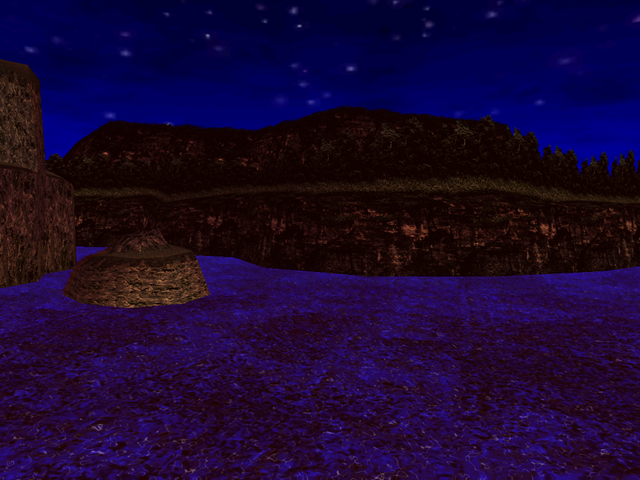 They also get dark outlines because of layering issues with the skybox. 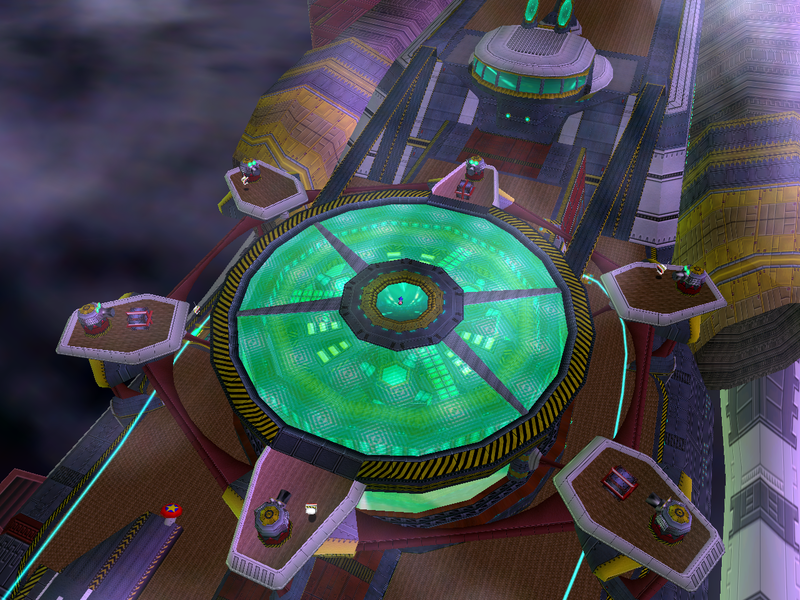 As can be seen from above, this is not a matter of design – the textures simply look that way without lighting. 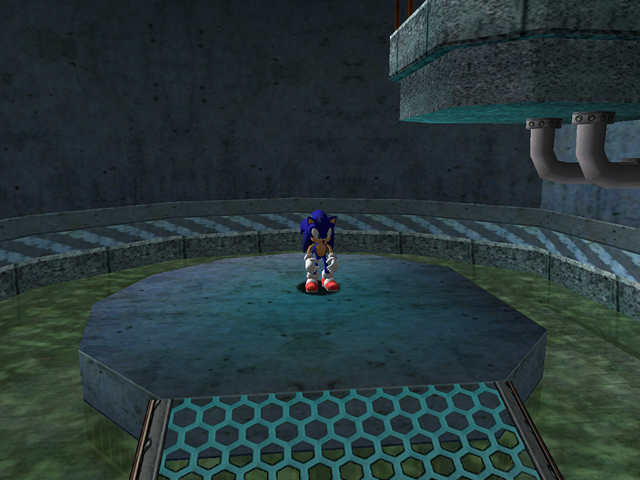 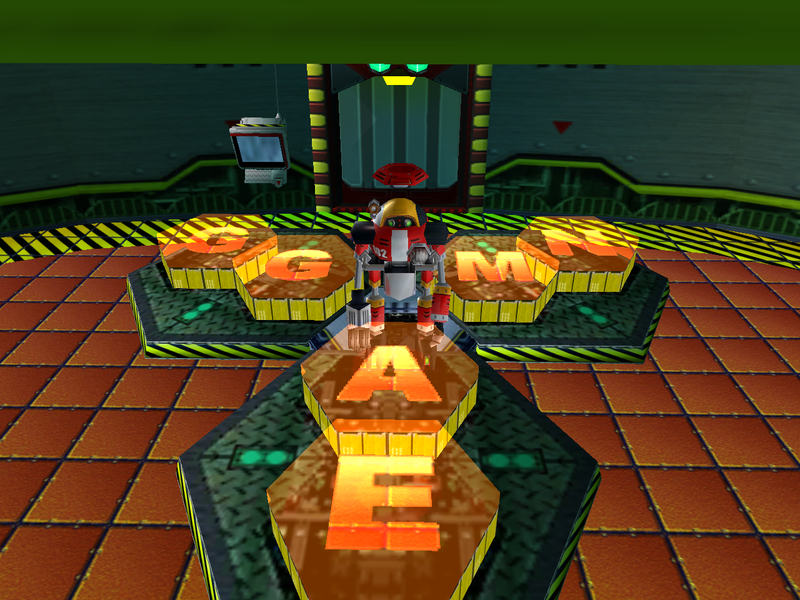 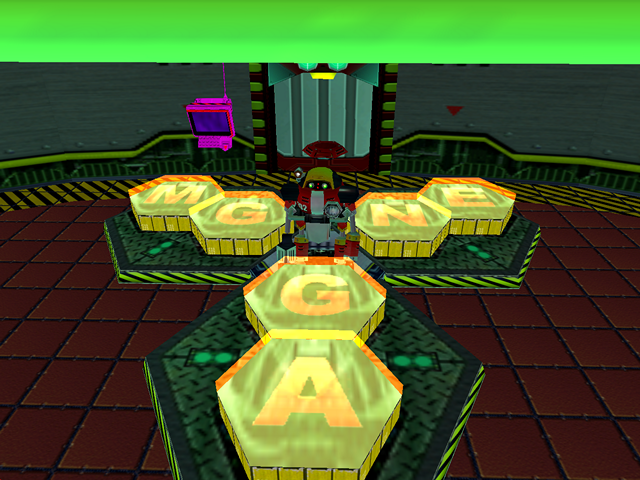 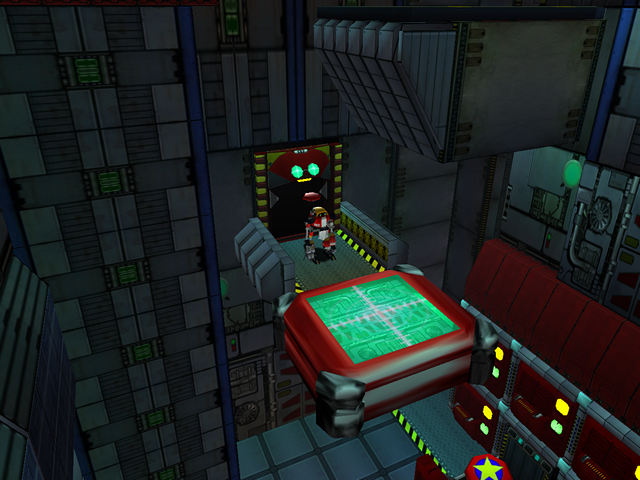 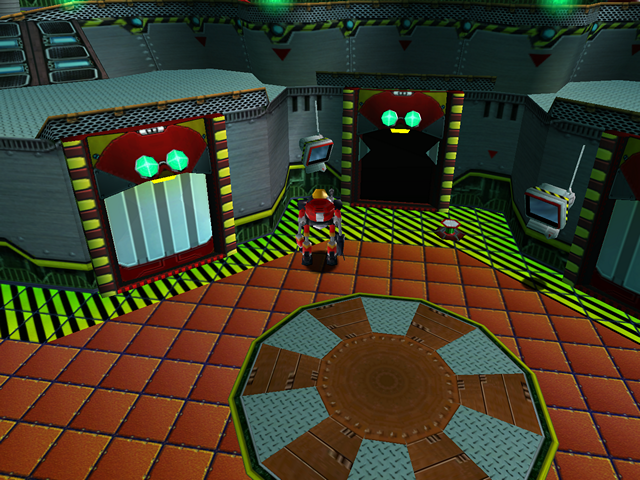 Although the SADX version of the level has lighting, it doesn’t affect the level as profoundly as the original version. 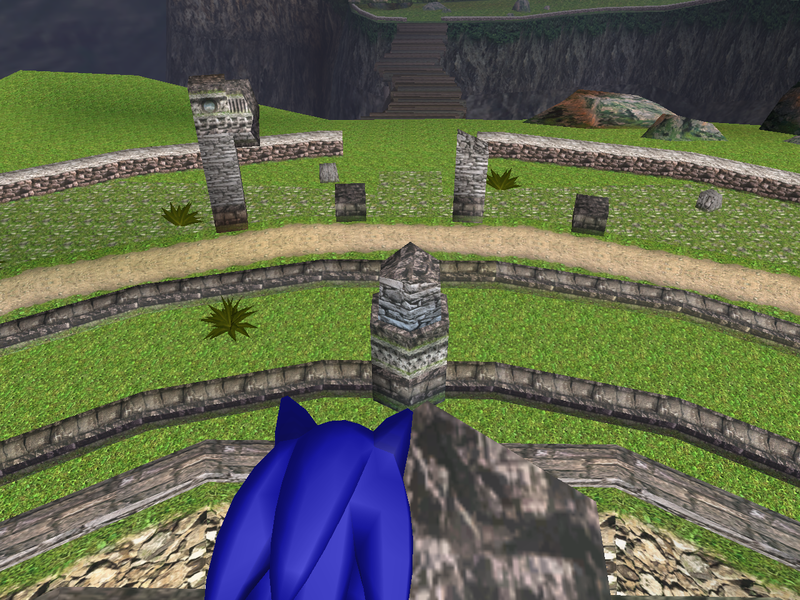 The SADX version of Mystic Ruins has less downgrades than Station Square, and the Gamecube version looks fine in some areas, but lack of proper lighting, removal of decorations and strange design decisions regarding color vibrancy make this Adventure Field feel unfinished. It could have been an interesting redesign if it wasn’t for the massive amount of issues plaguing almost every single change introduced in SADX. 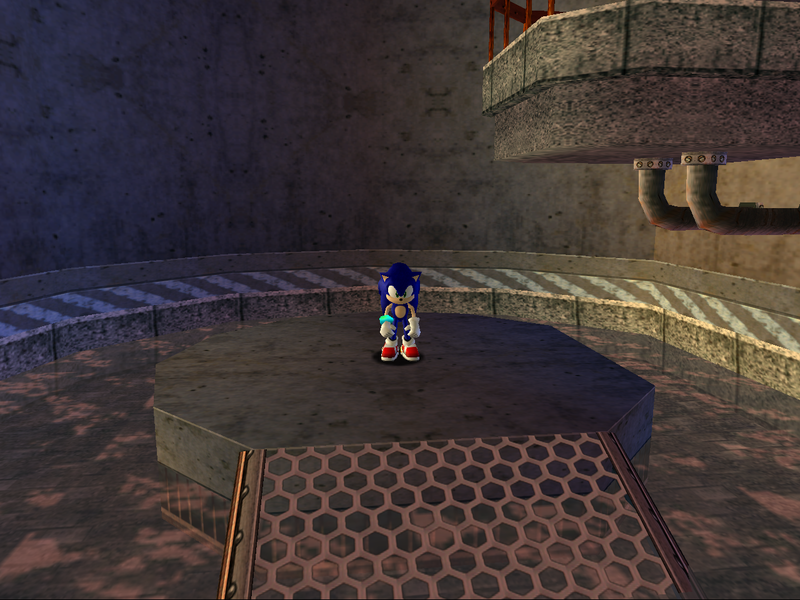 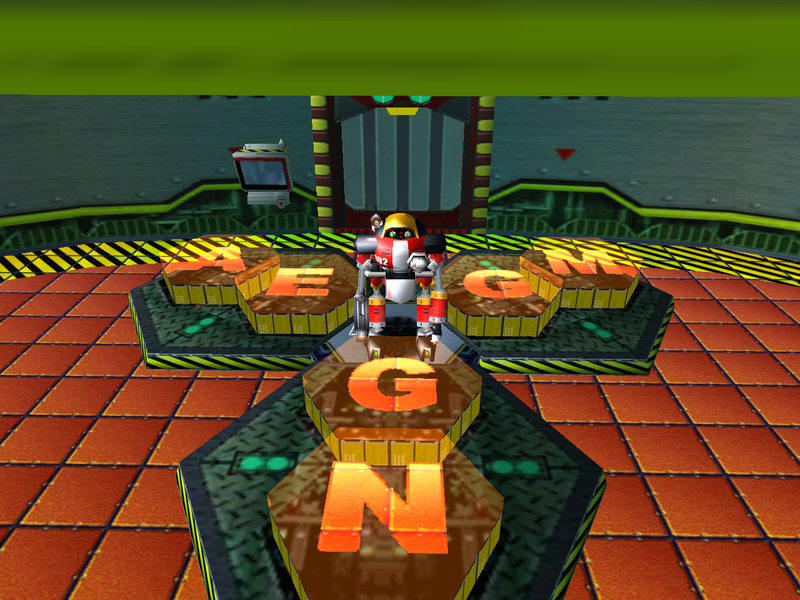 These issues are fixed in the Dreamcast Conversion mod, which reverts this level to its original design. 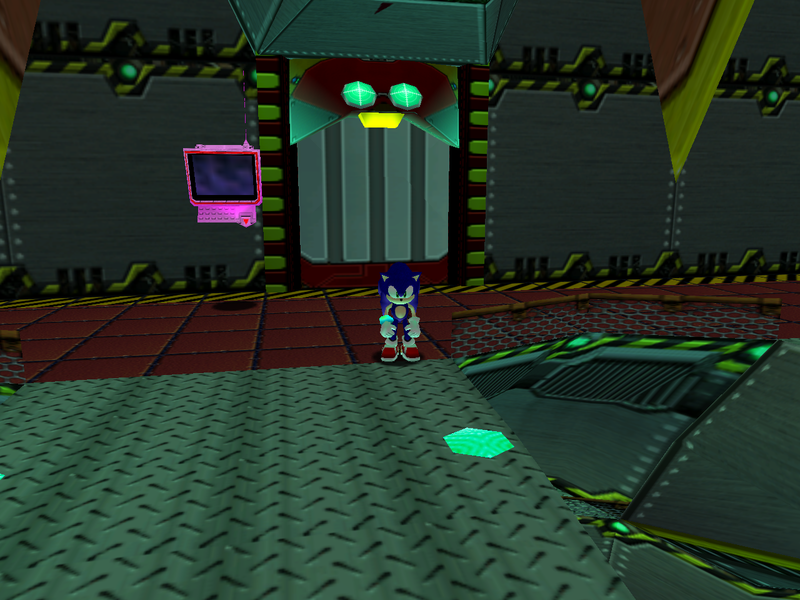 For those who prefer the SADX look of the Mystic Ruins, the Lantern Engine mod can improve the ambience by adding back Dreamcast lighting without reverting the level to the original version. 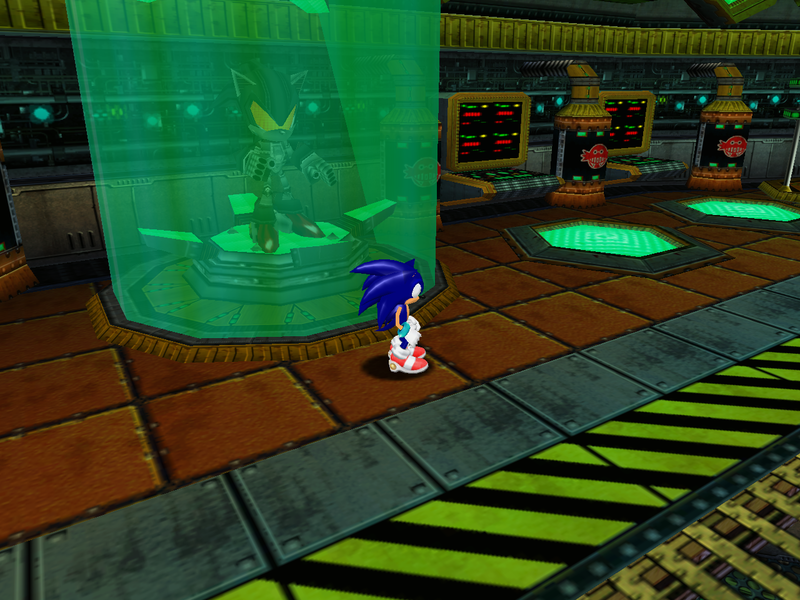 Check out this section for more information on how to install mods on the PC version. 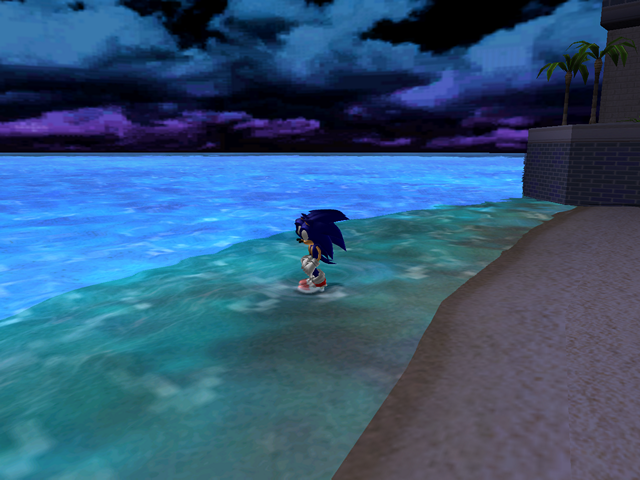 Adventure Fields had the most drastic changes in SADX. Station Square in particular had a major redesign with many new textures. 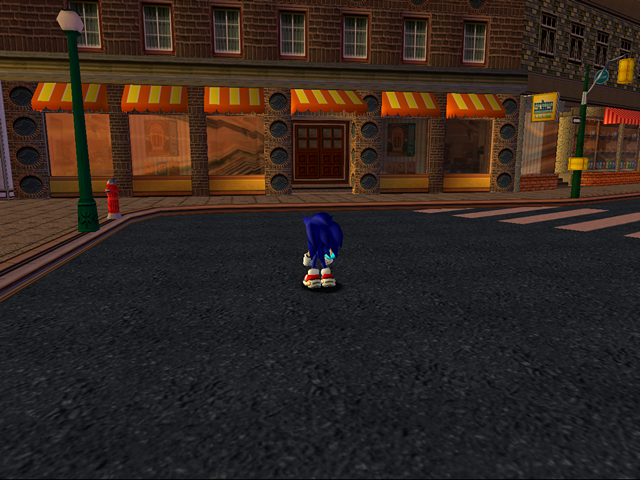 The redesign itself, however, is somewhat questionable. Although it adds some fake shadows using vertex colors and semi-transparent models, it also loses a lot of detail, and some of the visuals are broken. Let’s compare the level side by side between Dreamcast, Gamecube and PC versions and see which one holds up better. 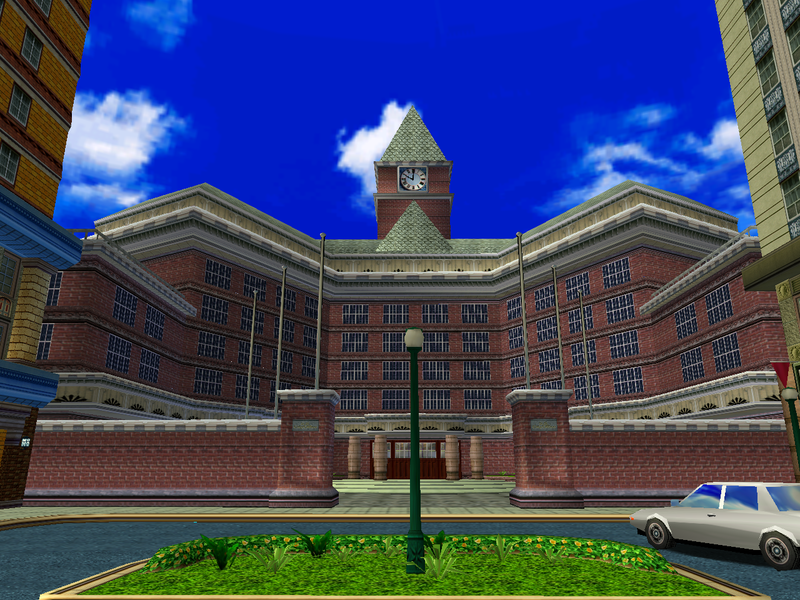 The area where you fight Chaos 0 was originally a red brick building with a clock tower. 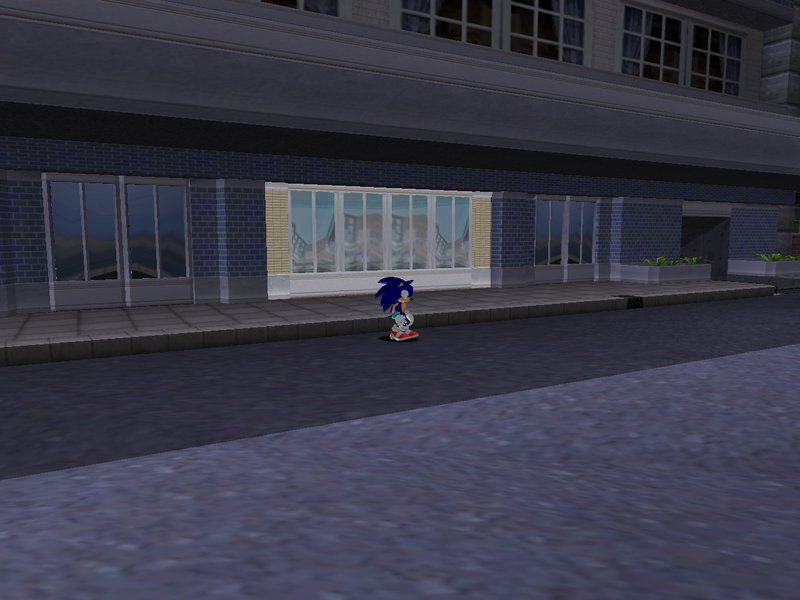 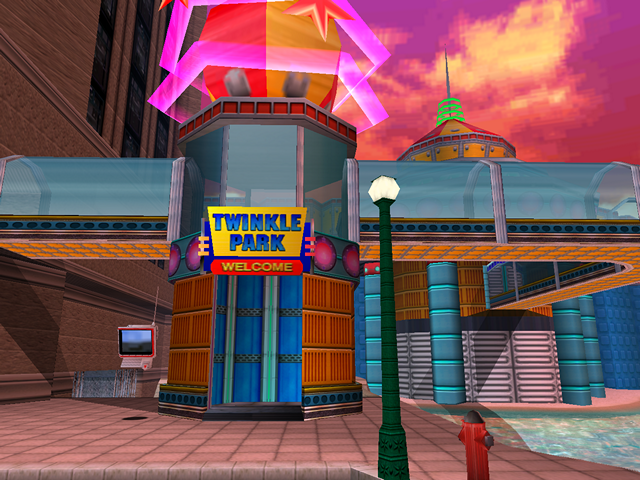 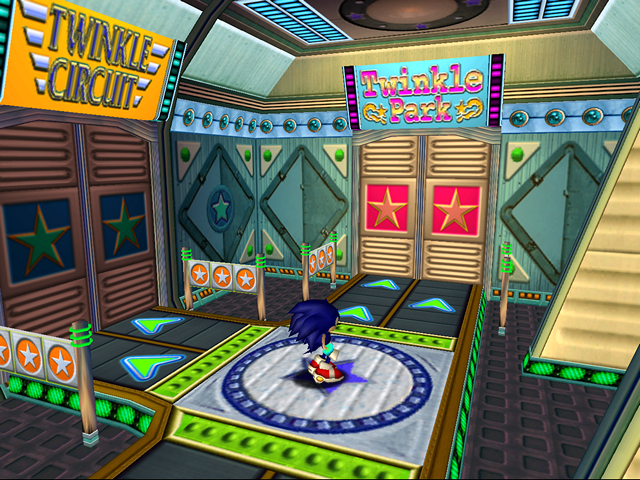 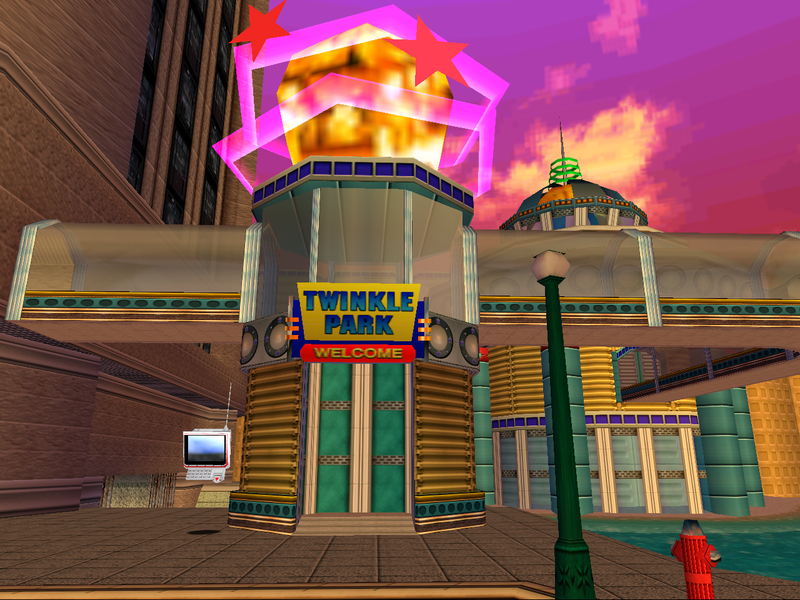 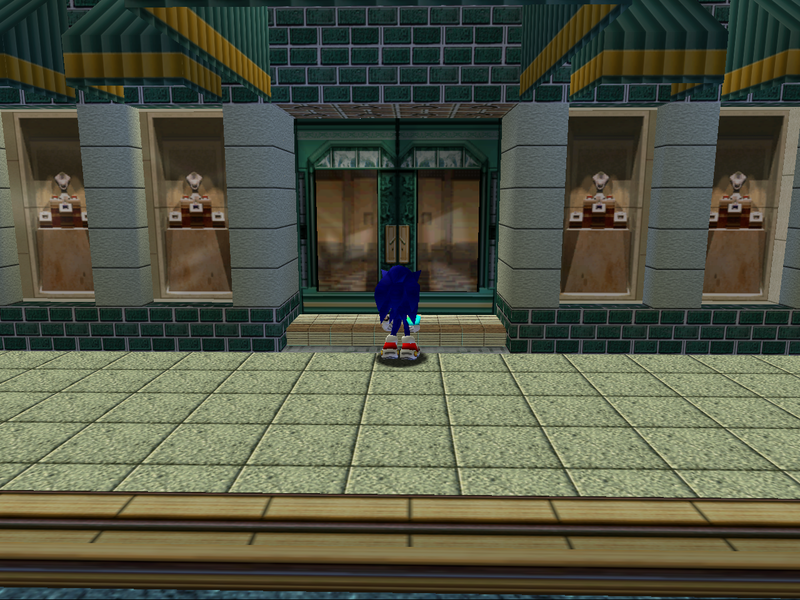 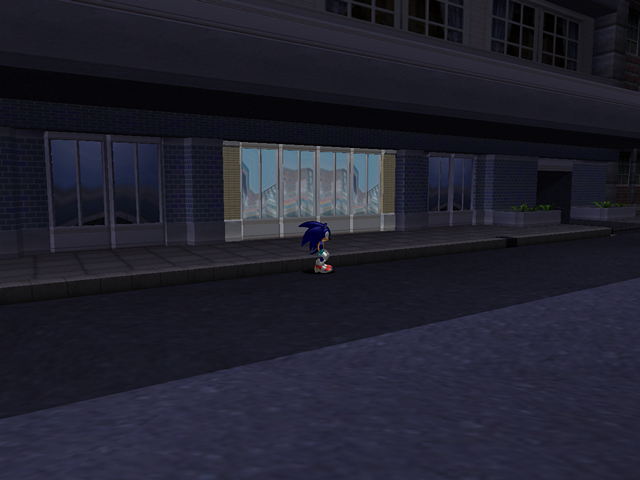 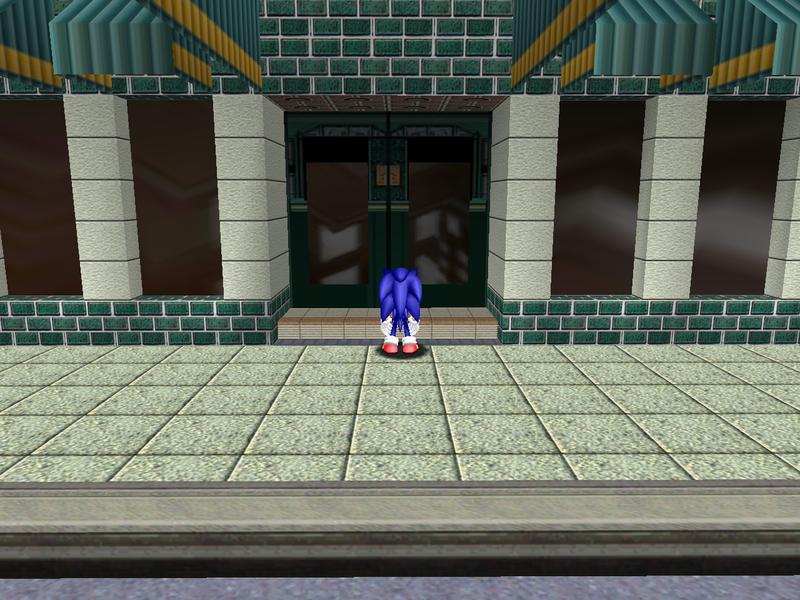 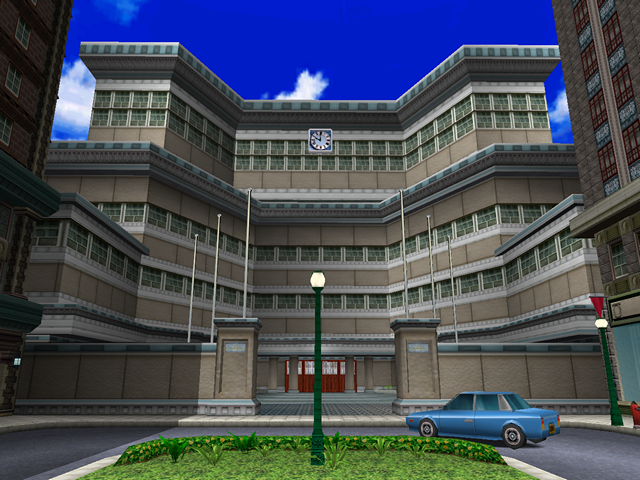 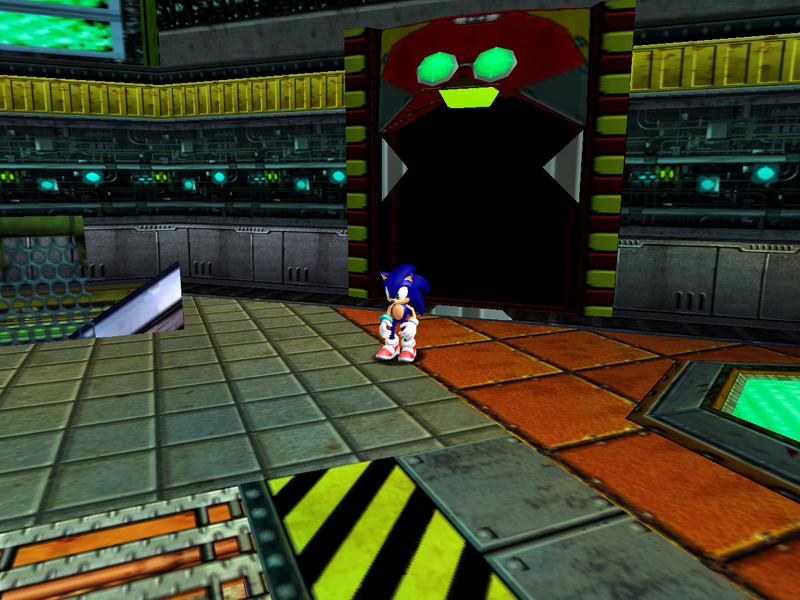 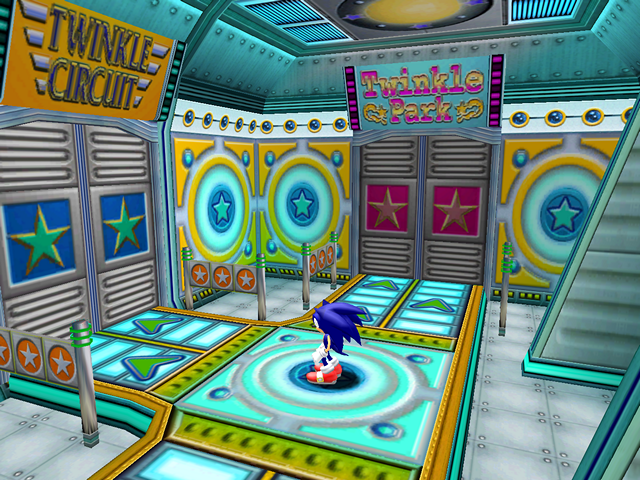 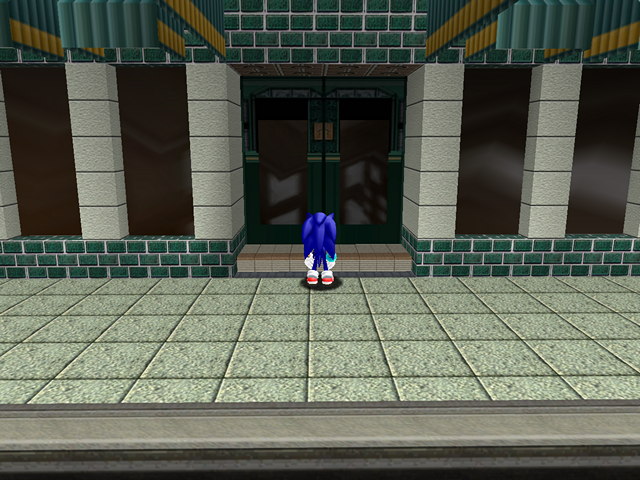 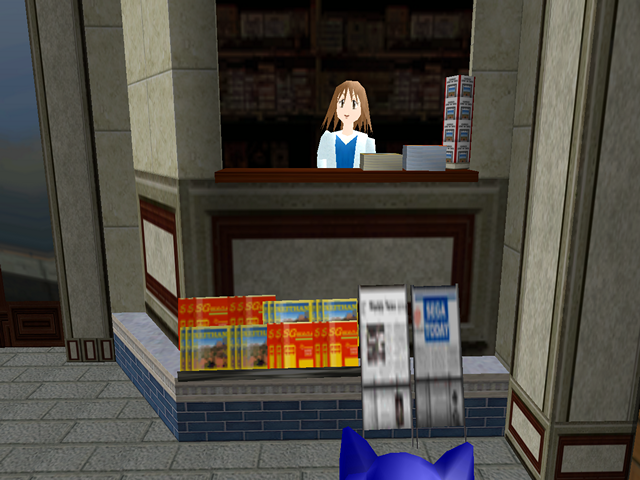 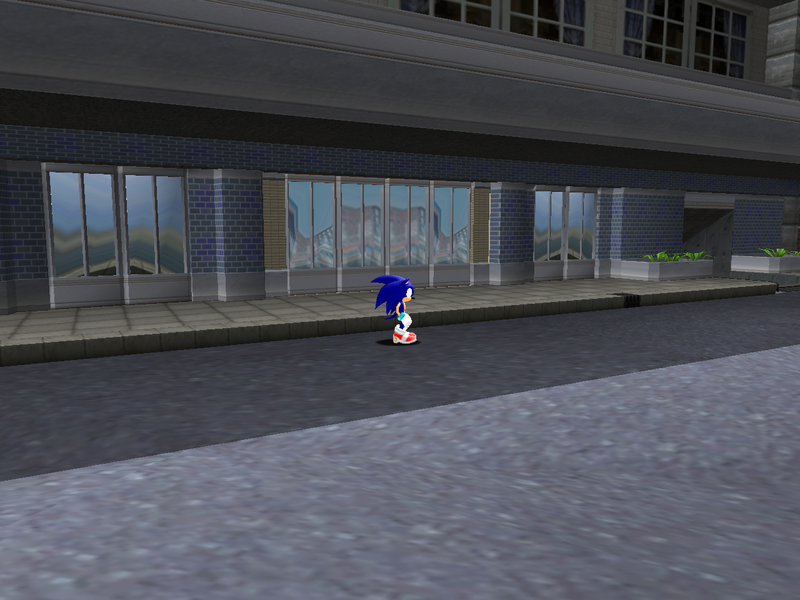 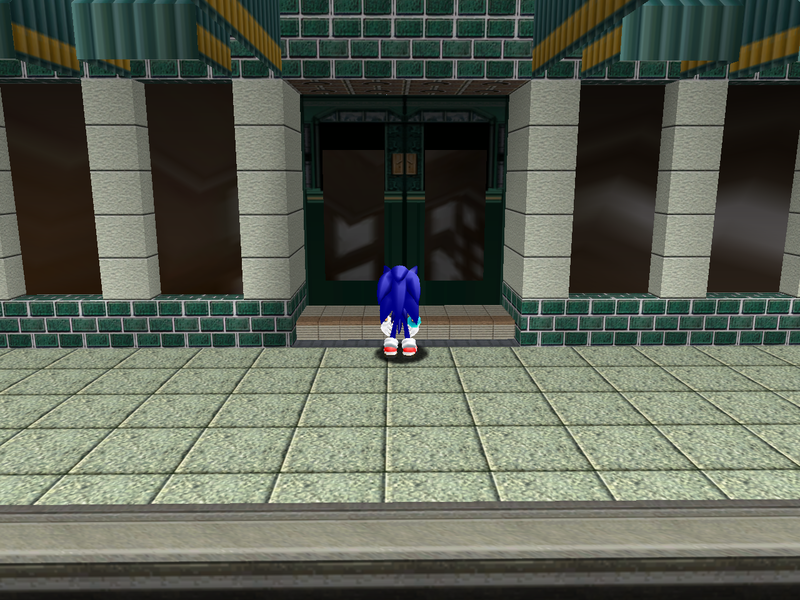 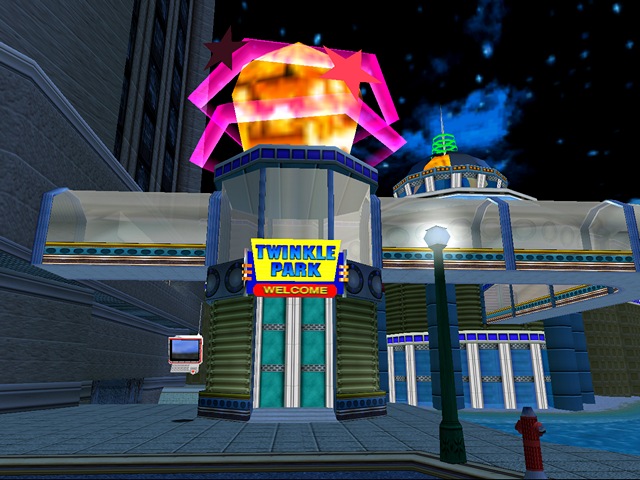 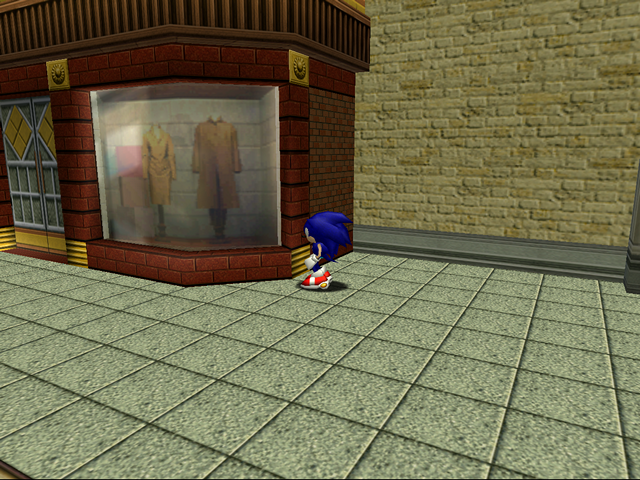 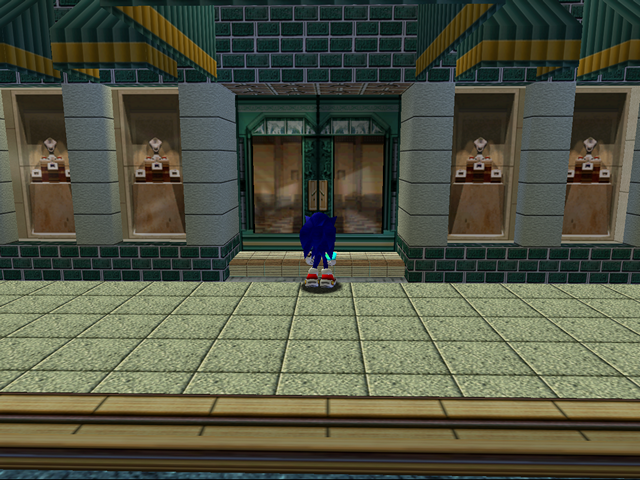 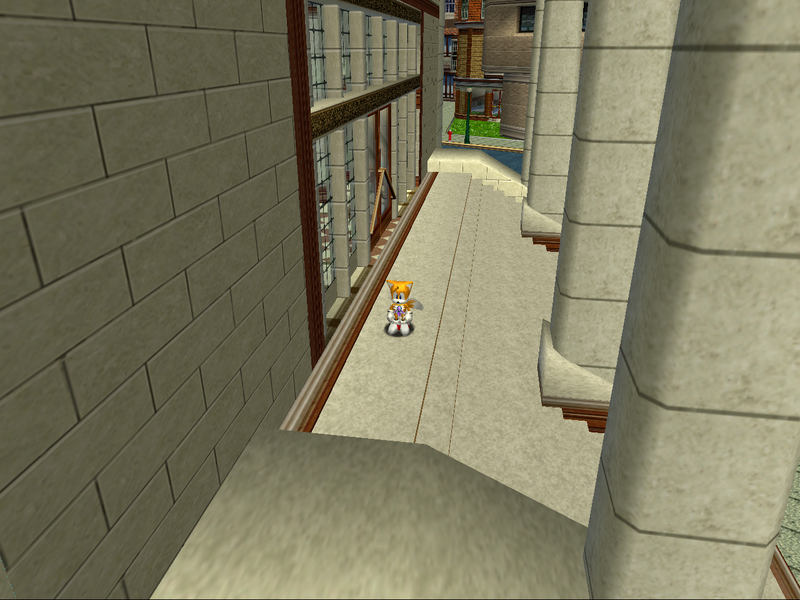 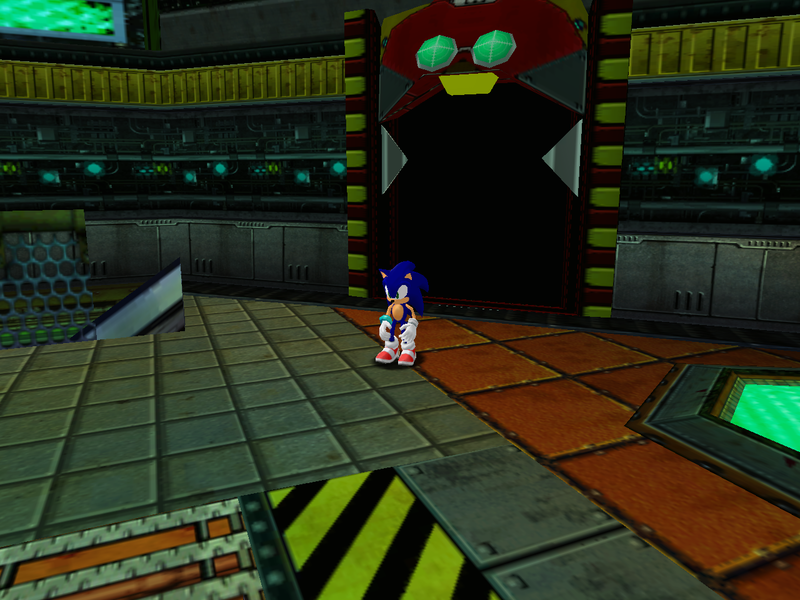 In SADX the clock tower was replaced with a smaller copy of the building’s lower segment. 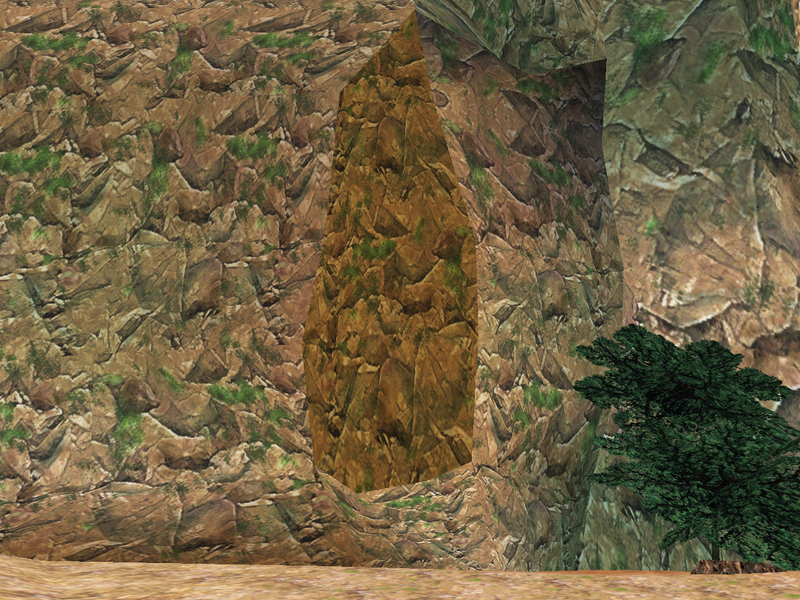 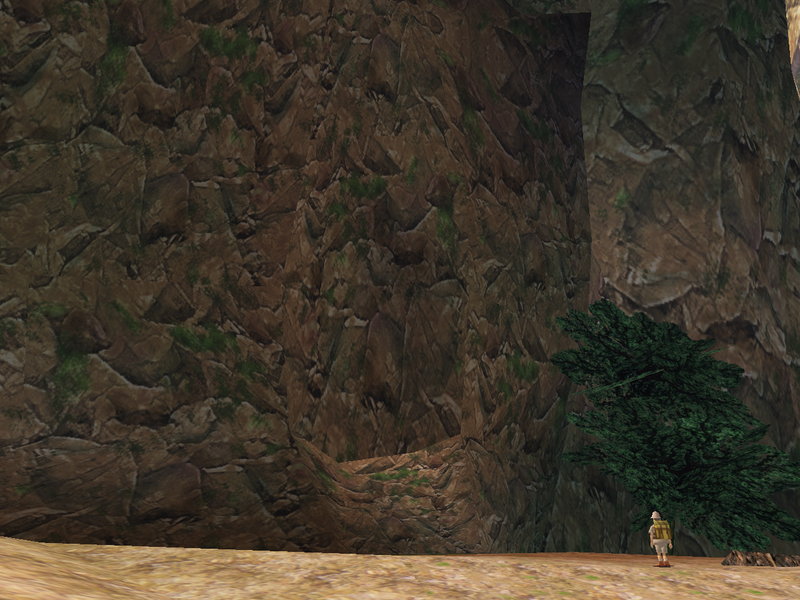 If you look closely you can see this area uses less unique textures, which are also lower quality than the original textures. 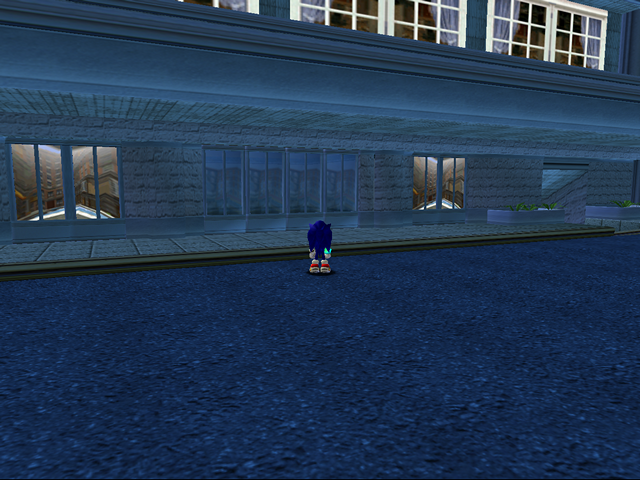 Another problem with this redesign is that it creates an inconsistency with Speed Highway Act 3 because this is supposed to be the same building you enter as Knuckles or leave as Sonic in that stage. 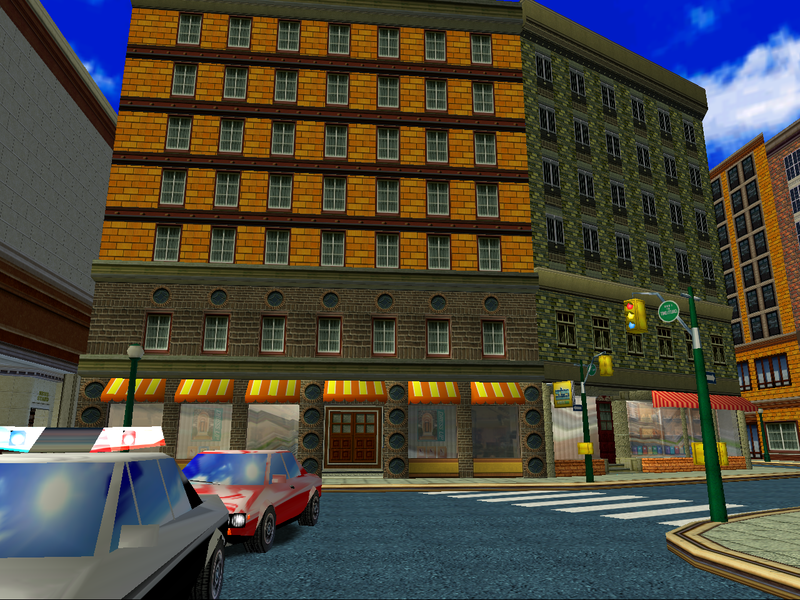 The building in Speed Highway still has the old design with the clock tower. 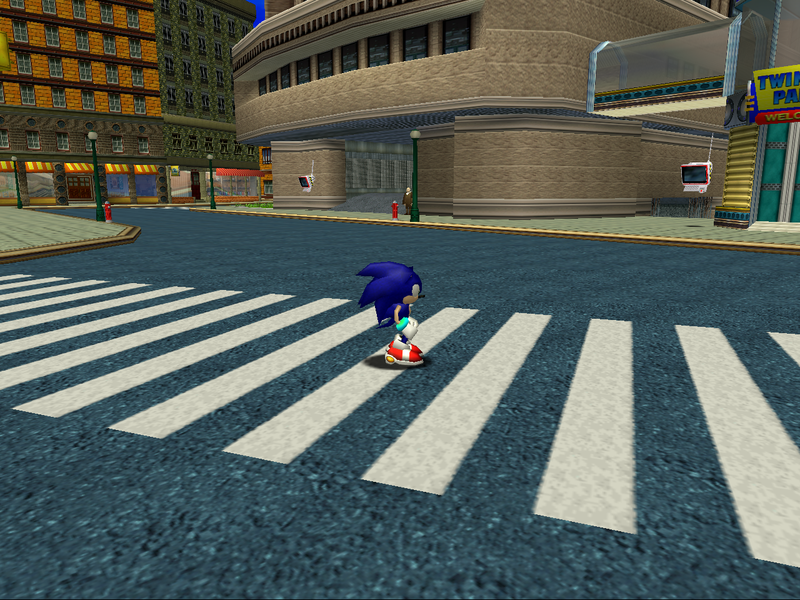 Some people claim that SADX has “better” asphalt textures because the SADX texture is supposedly “more realistic”. 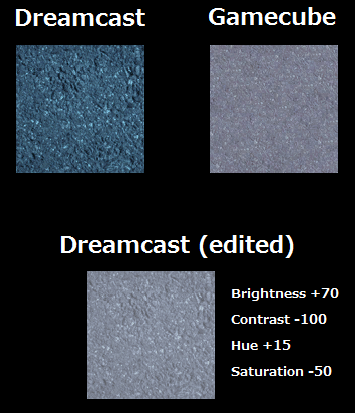 This can be proven wrong by just comparing the textures side by side. Let’s have a closer look: here’s the asphalt texture from the City Hall area from both versions of the game and my quick attempt to downgrade the original texture to the SADX level of quality. 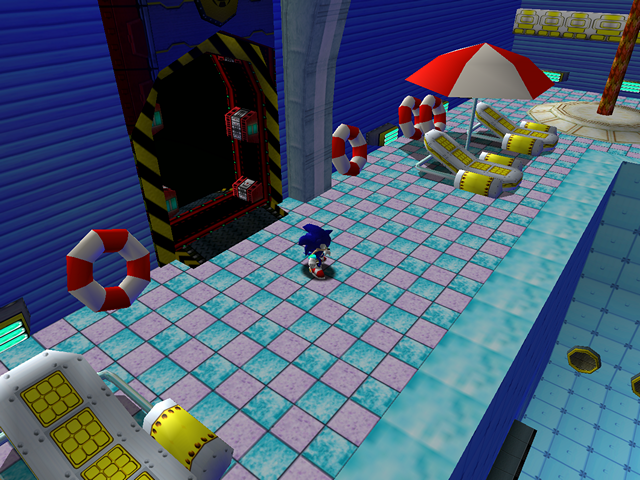 The sewers area received a minor redesign. 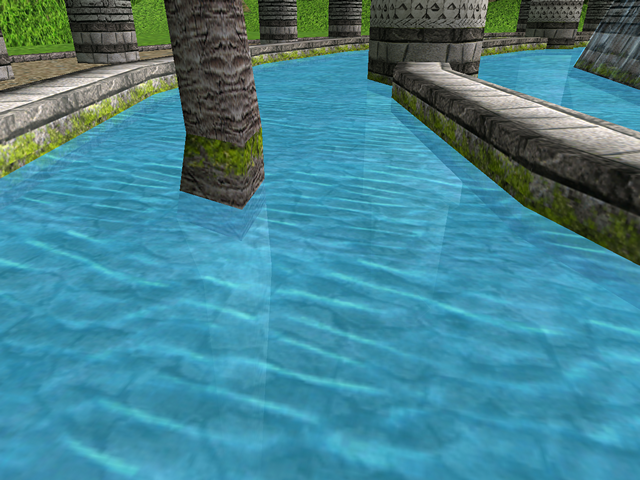 The water texture is no longer animated, its resolution wasn’t increased either, but the color was changed. 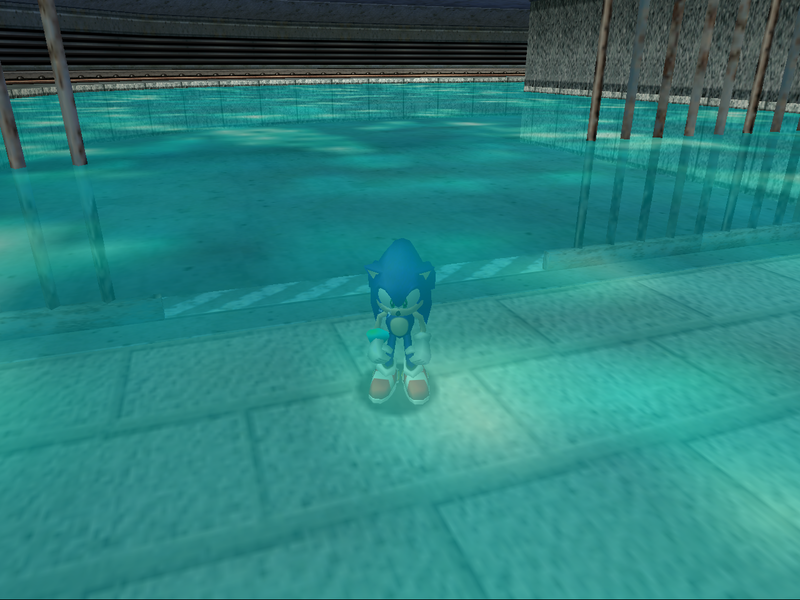 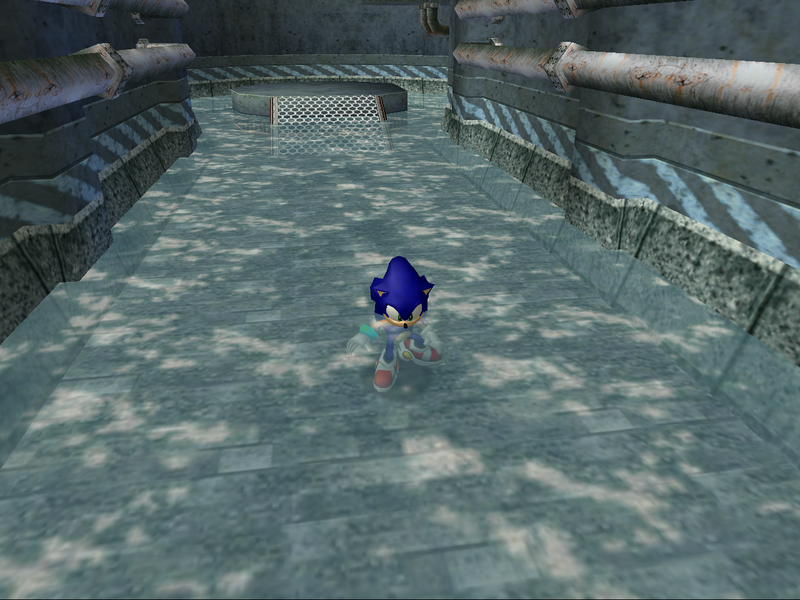 The distortion effect takes care of water animation on the Gamecube, but the PC version reverts to a Dreamcast-like look which now looks awkward because the water texture isn’t animated. 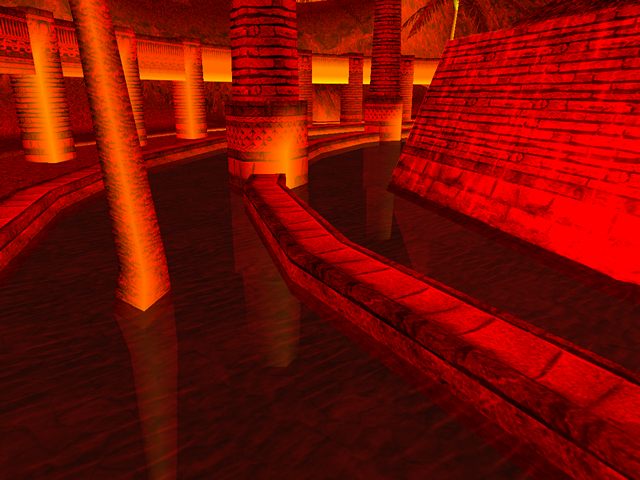 Some vertex colors were added to compensate for the loss of palette lighting. The lighting in the sewers changed depending on the time of day in the Dreamcast version, which didn’t make much sense. 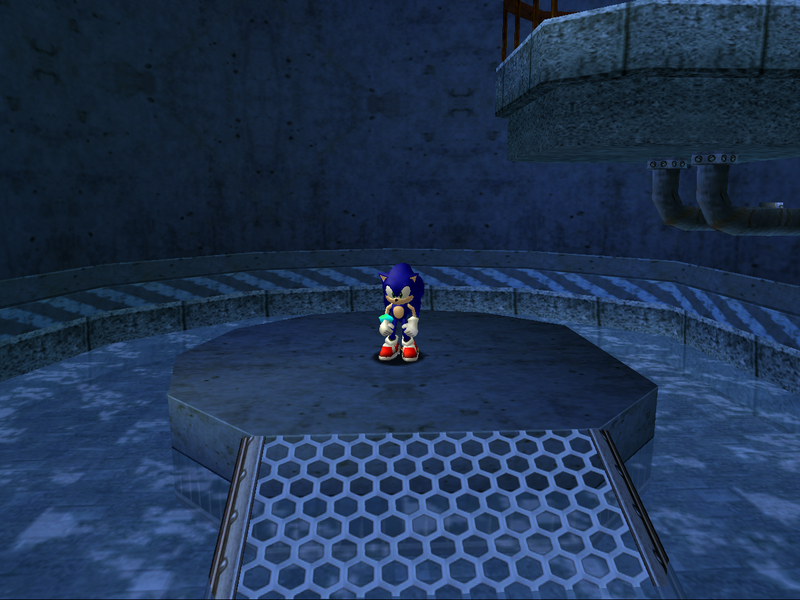 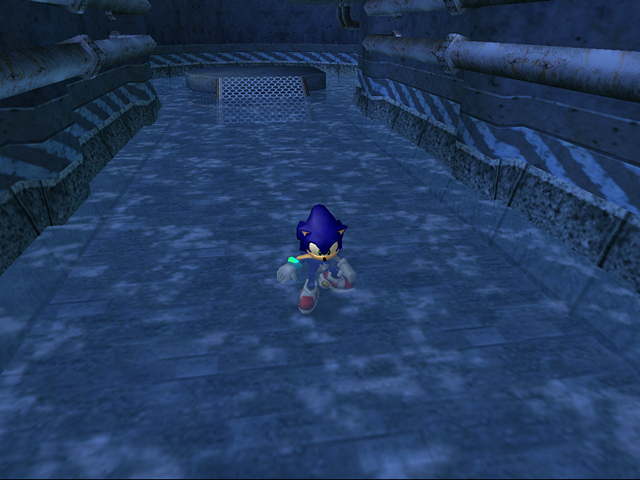 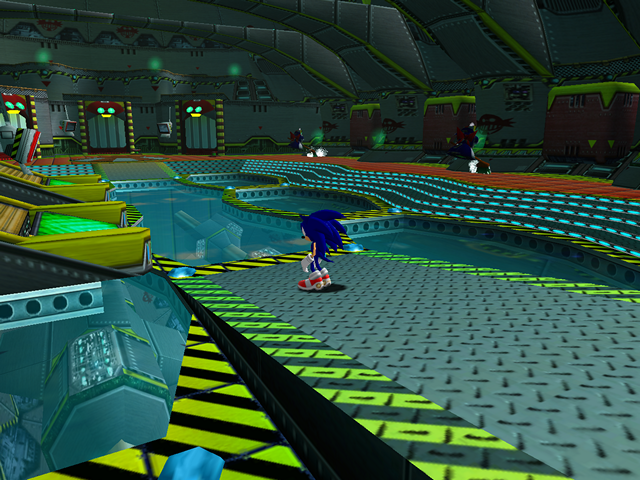 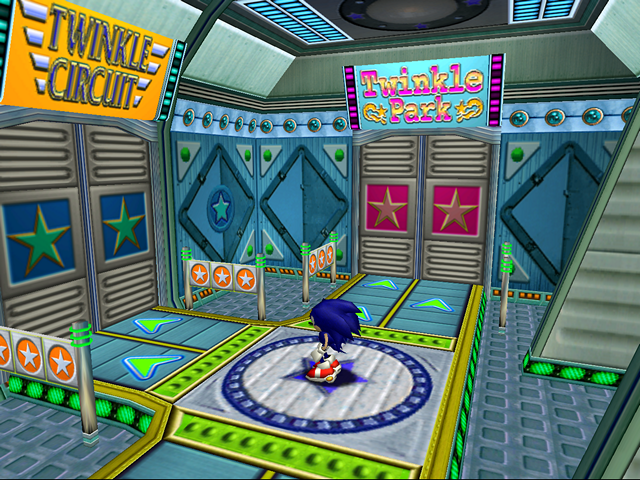 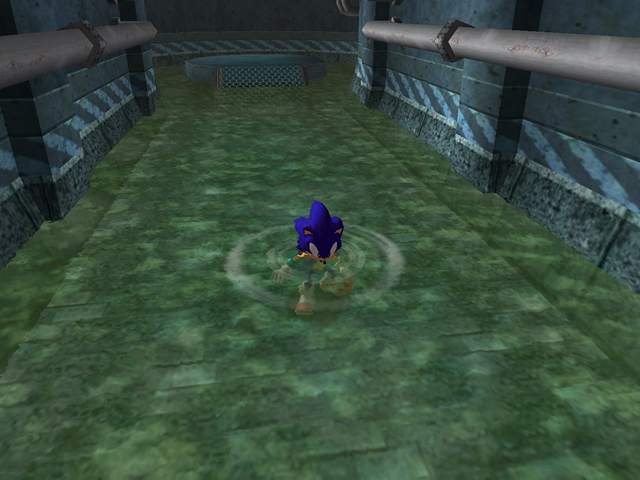 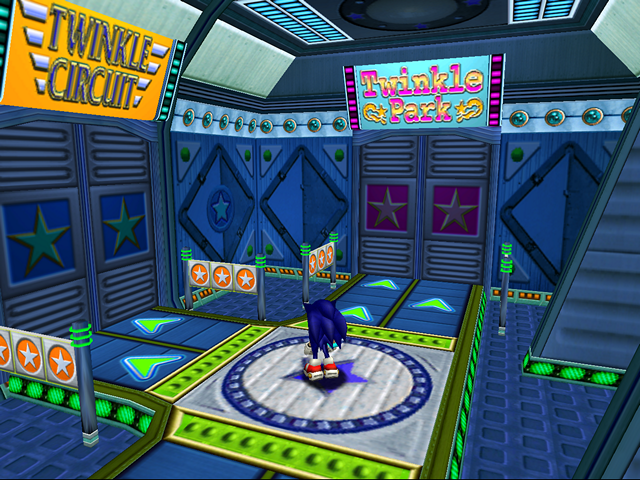 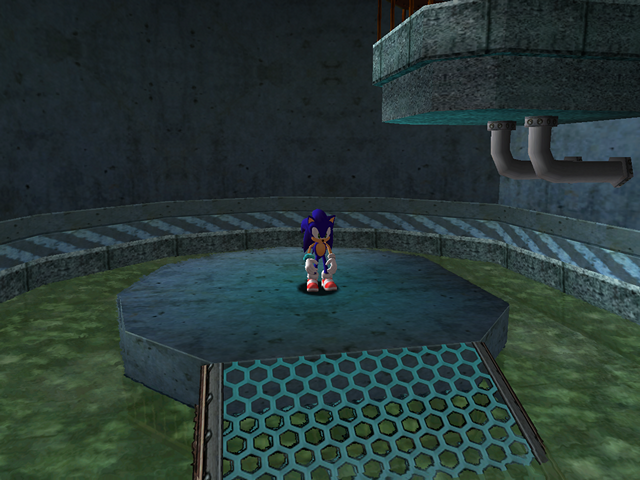 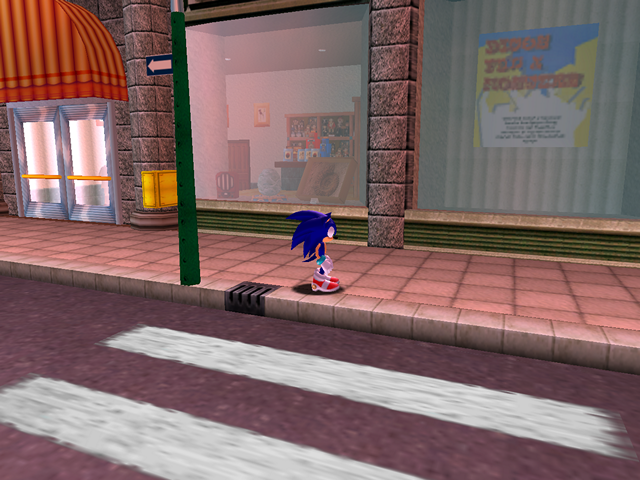 In SADX the sewers area looks the same regardless of the time of day. 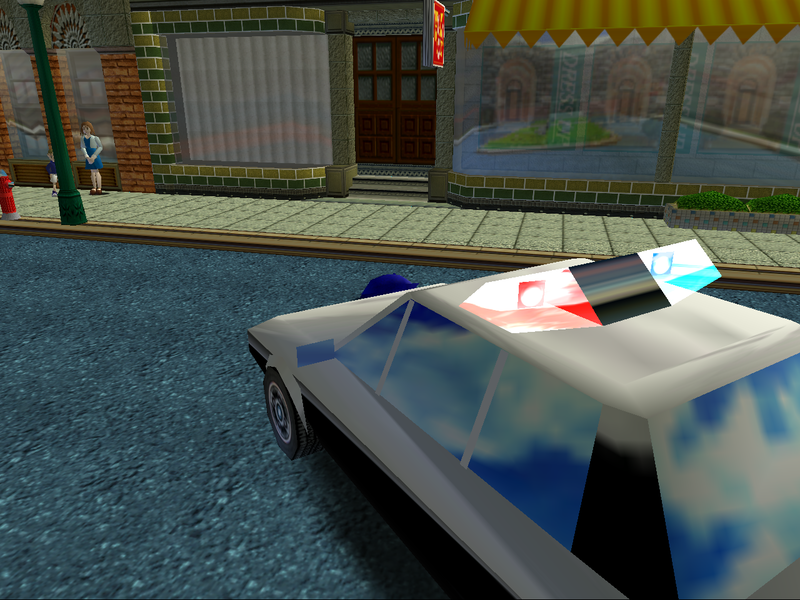 The police cars have lost transparency in their flashers, which not only looks less “realistic”, but also makes the inner pieces invisible. 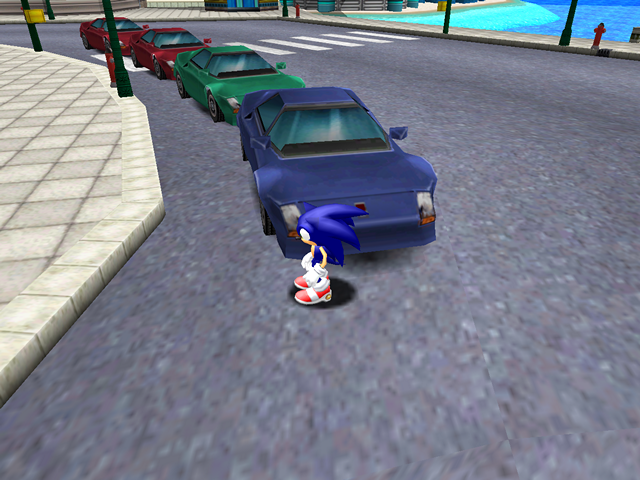 They were supposed to rotate as the car moved. 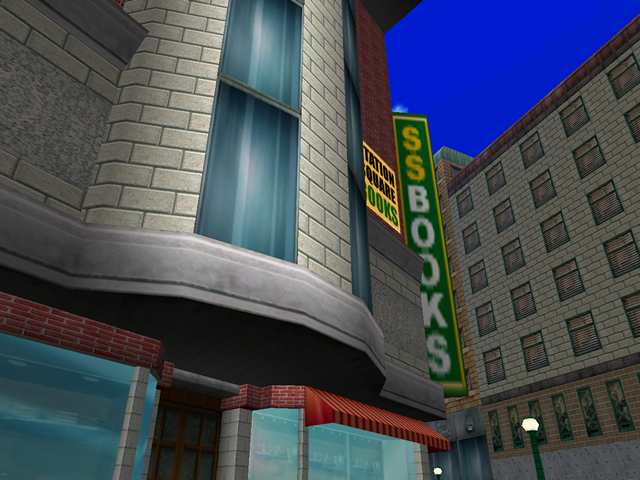 If you look closer, you may notice that the supposed bookshop sells food! 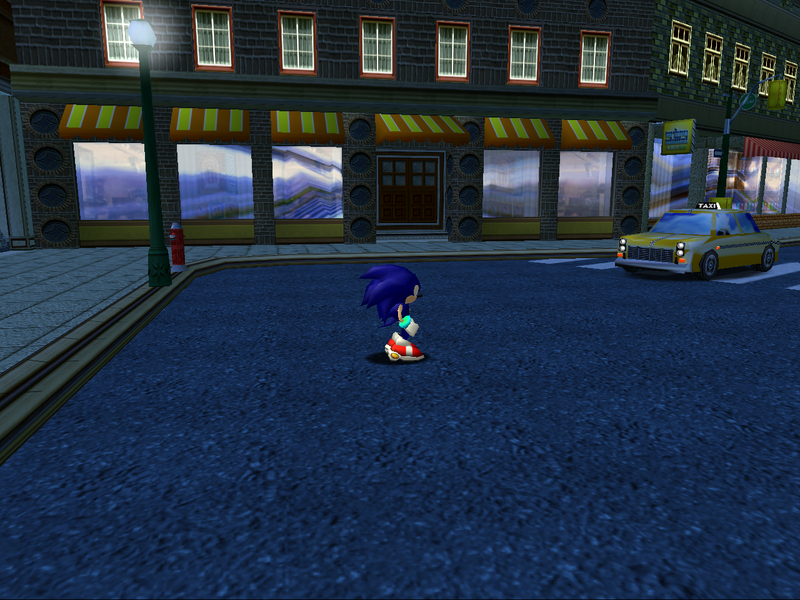 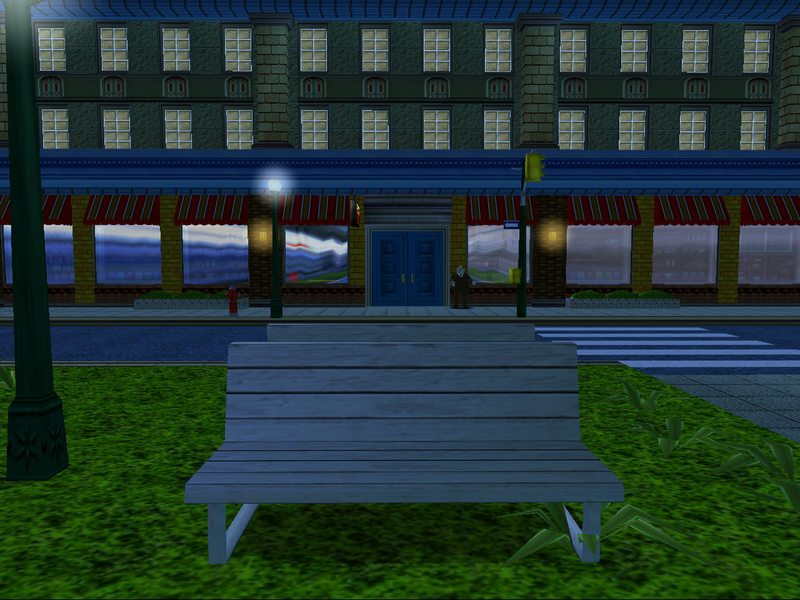 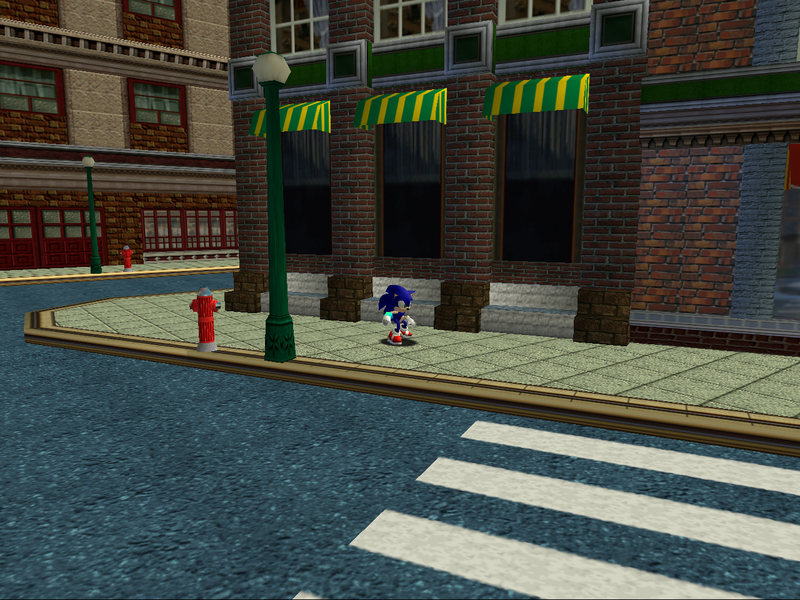 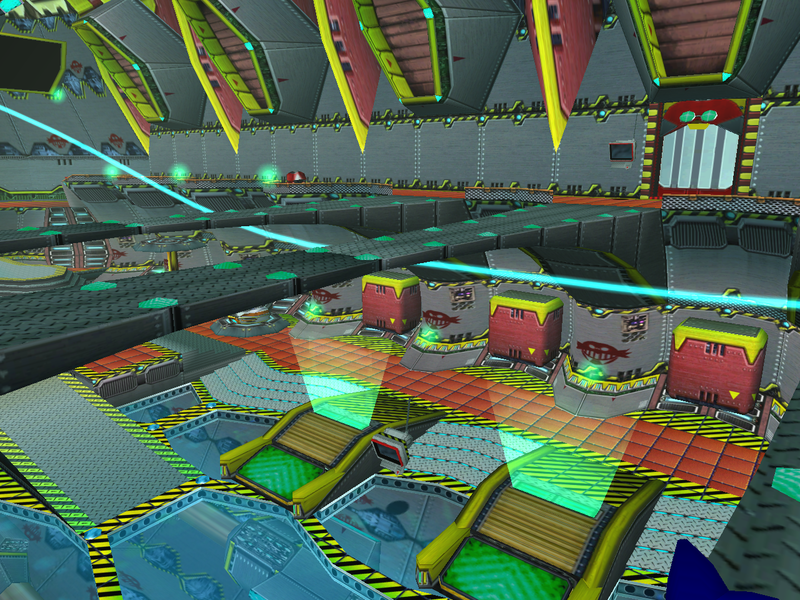 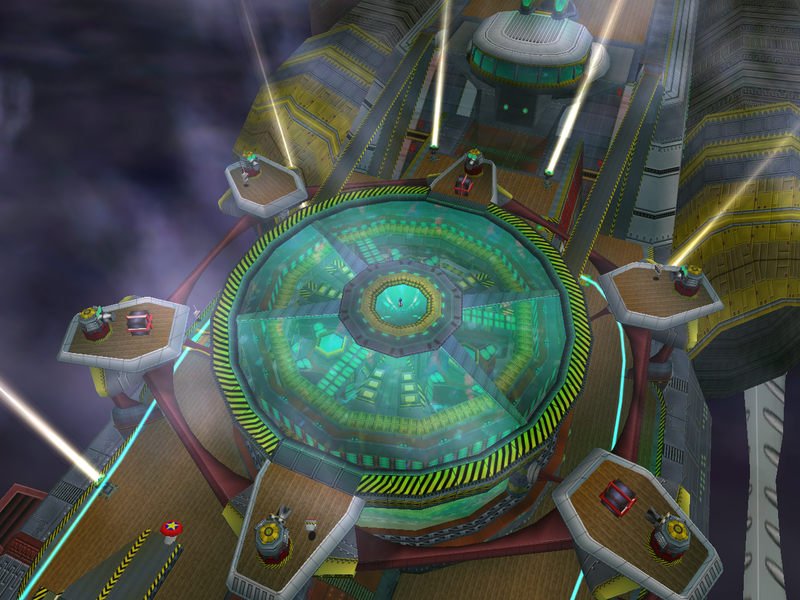 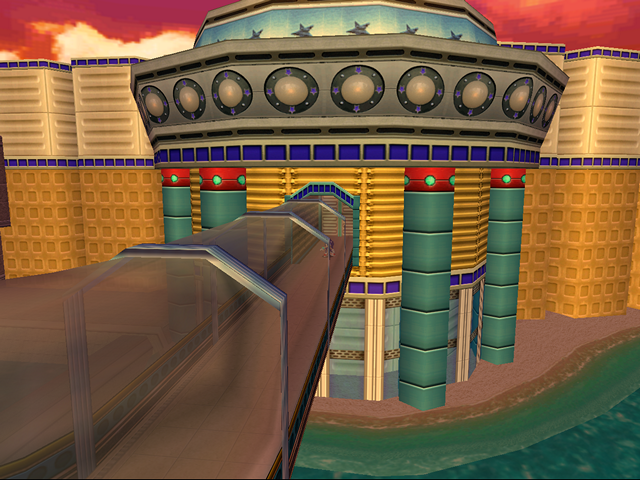 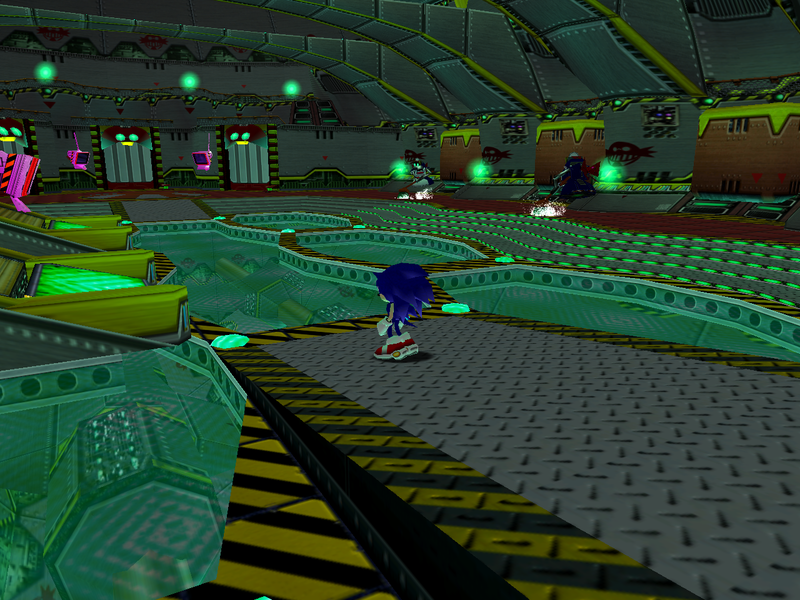 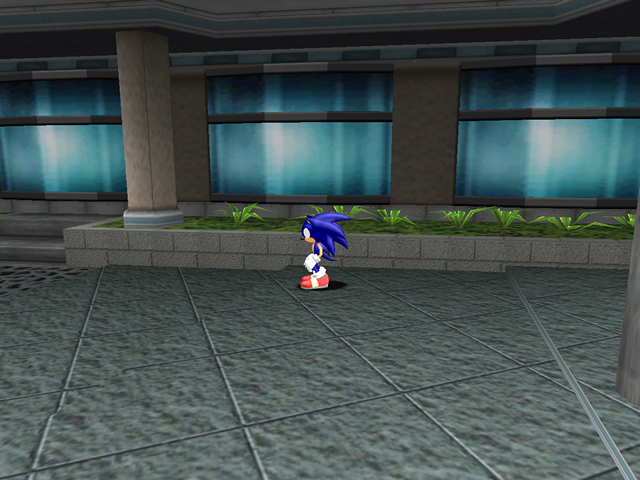 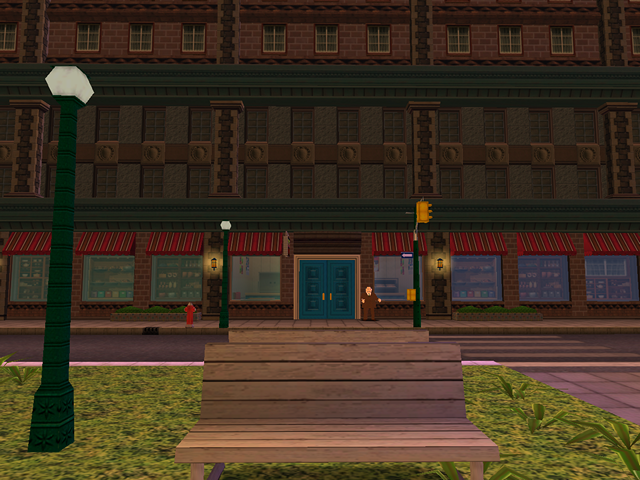 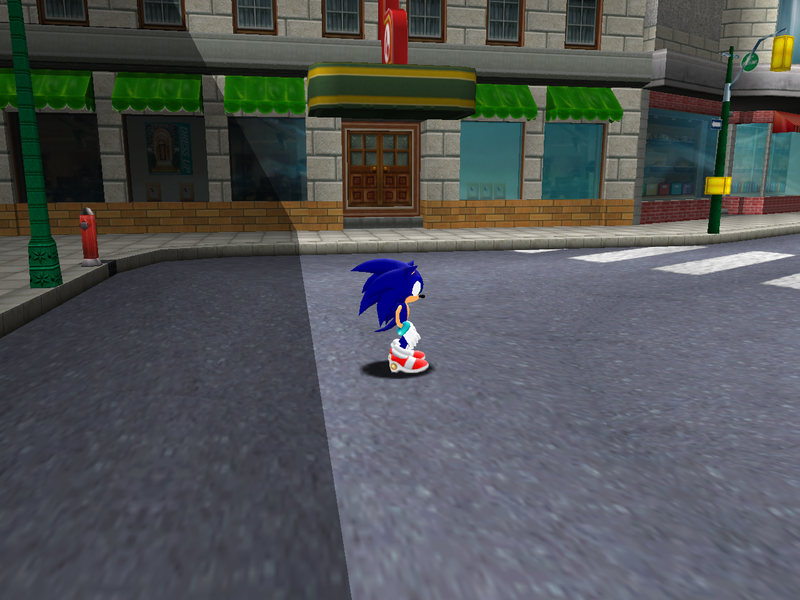 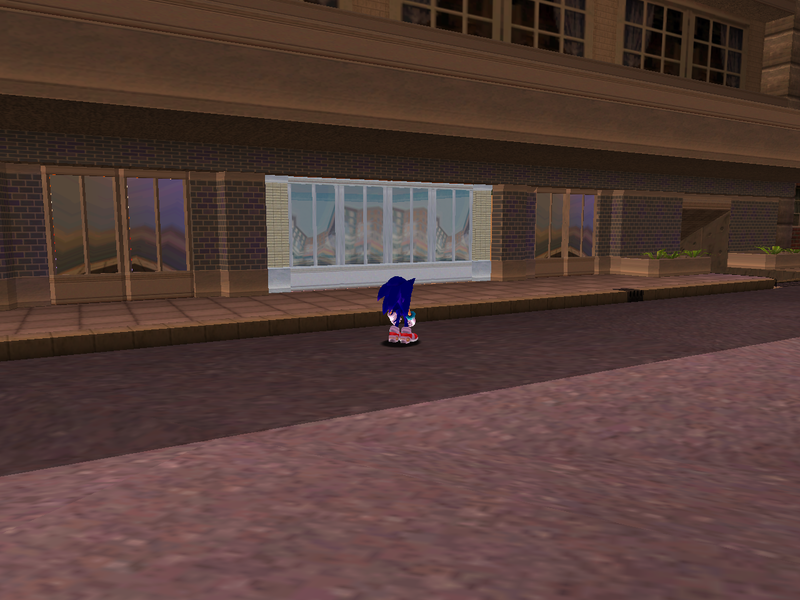 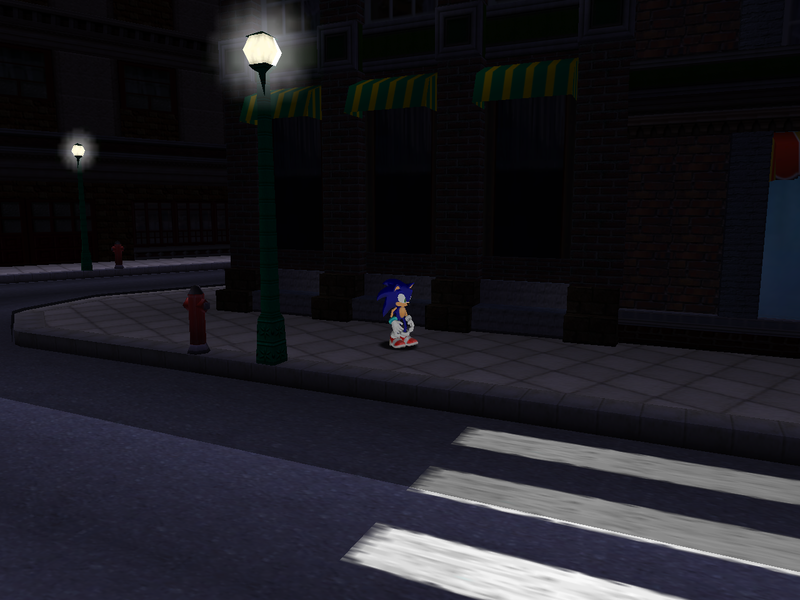 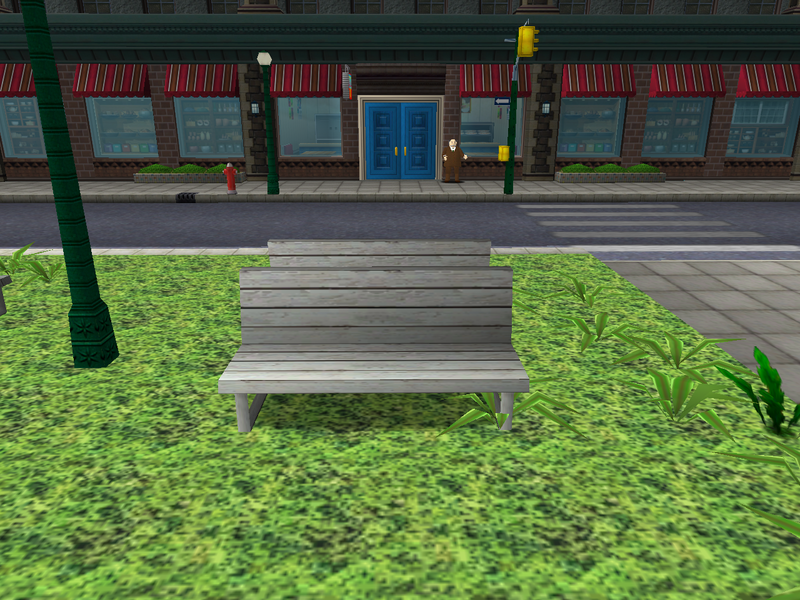 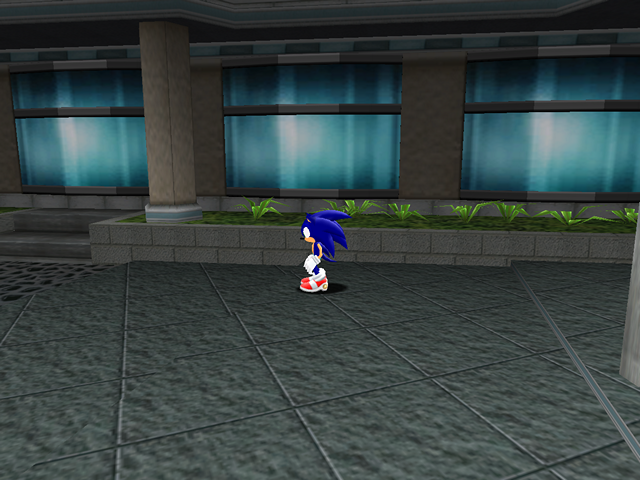 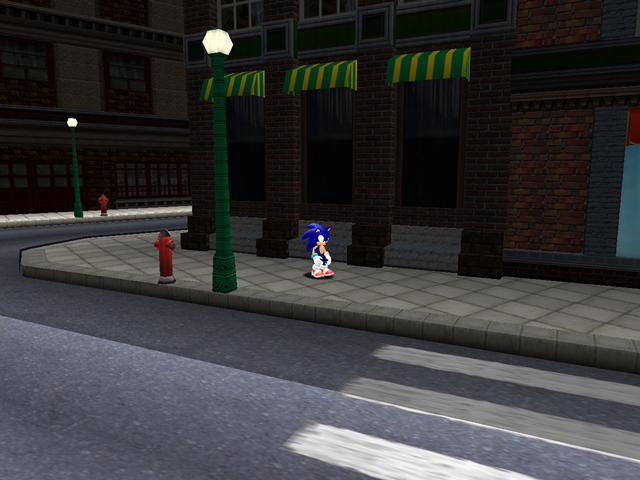 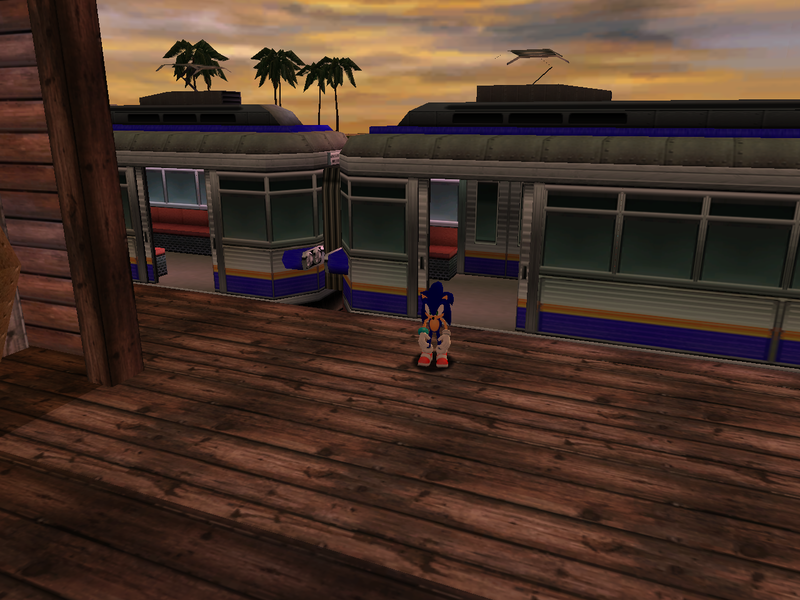 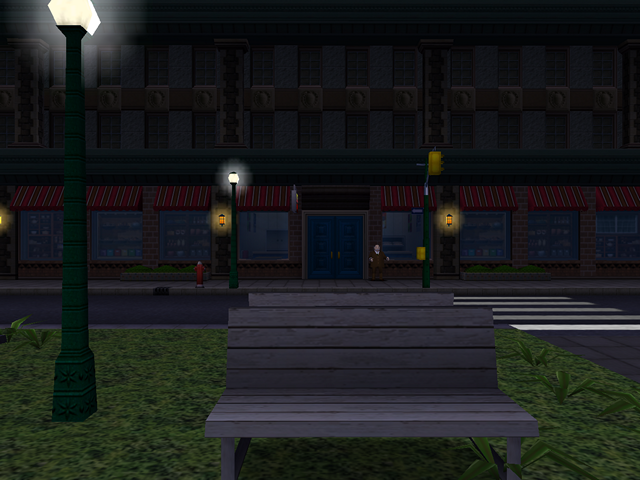 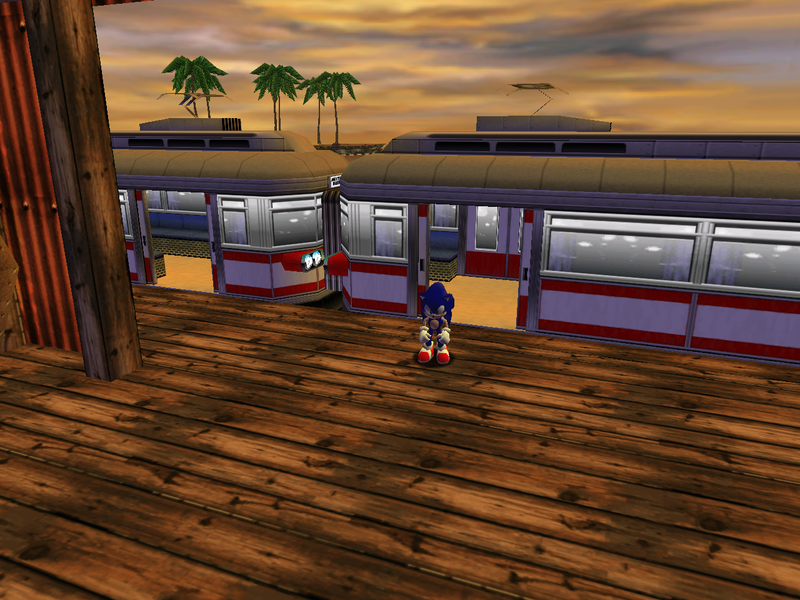 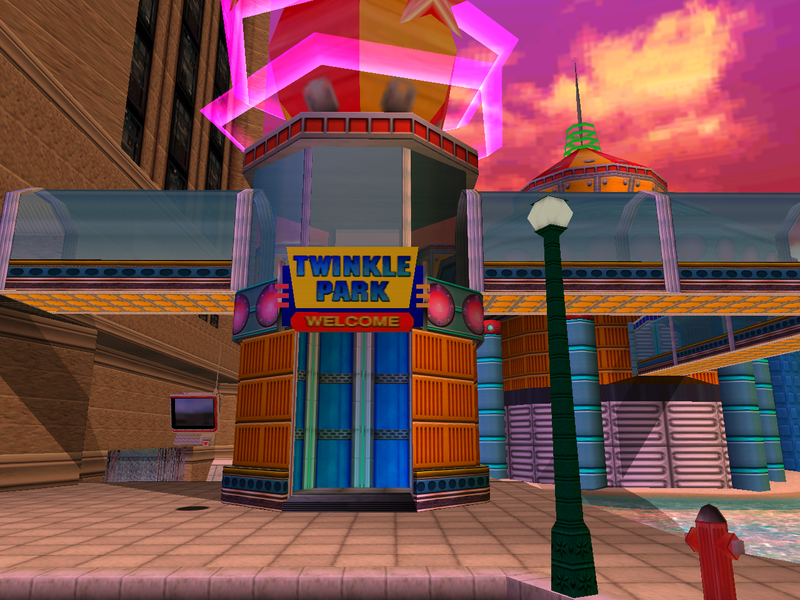 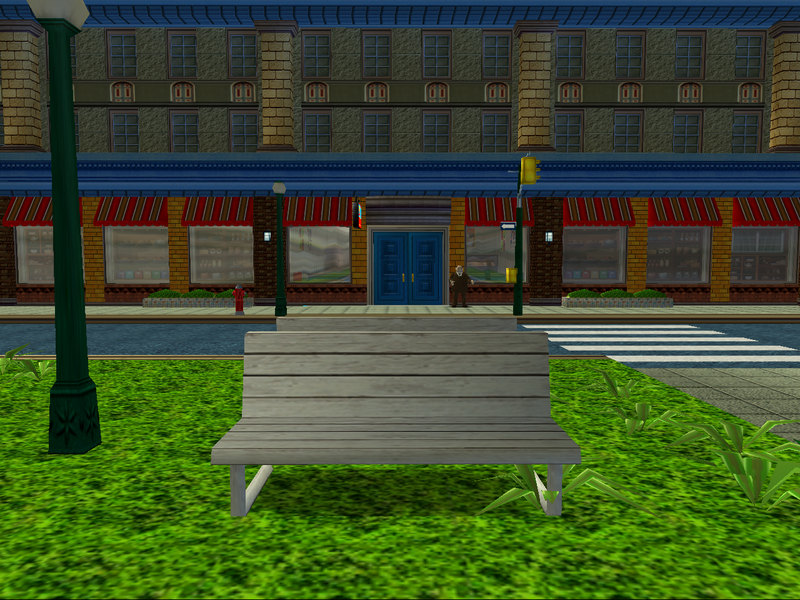 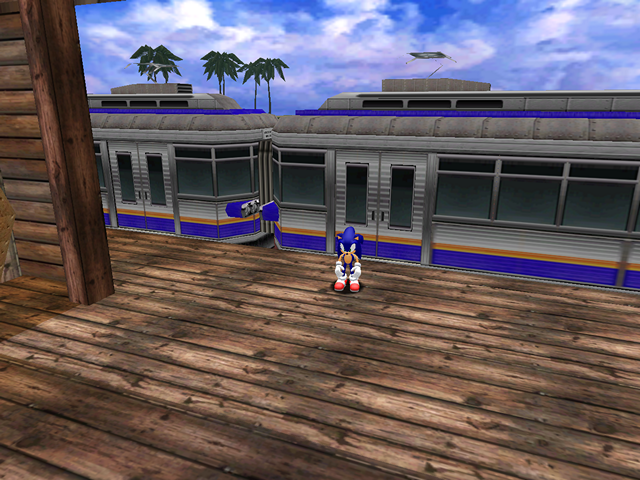 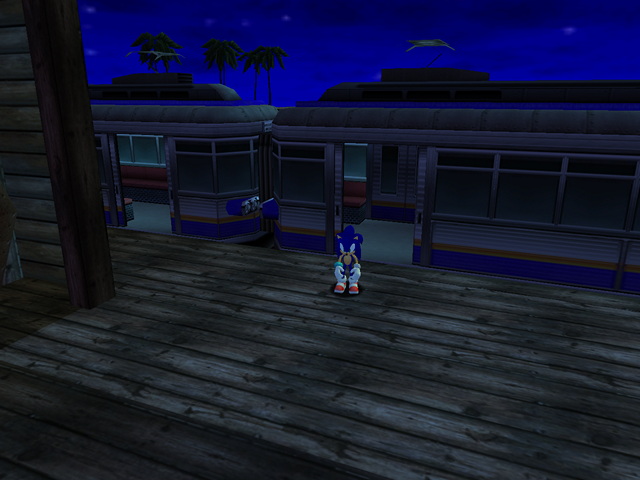 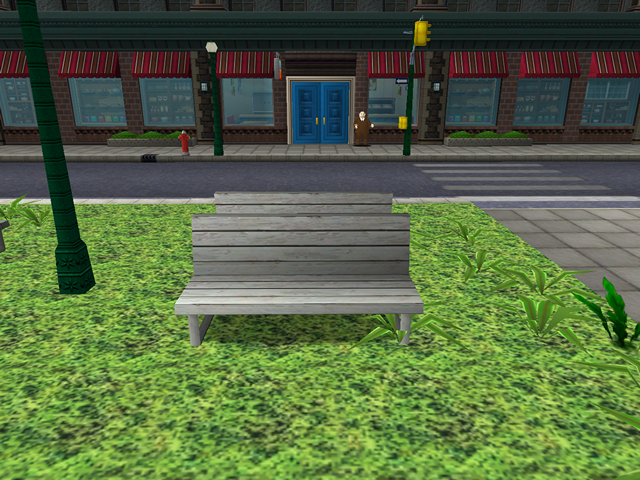 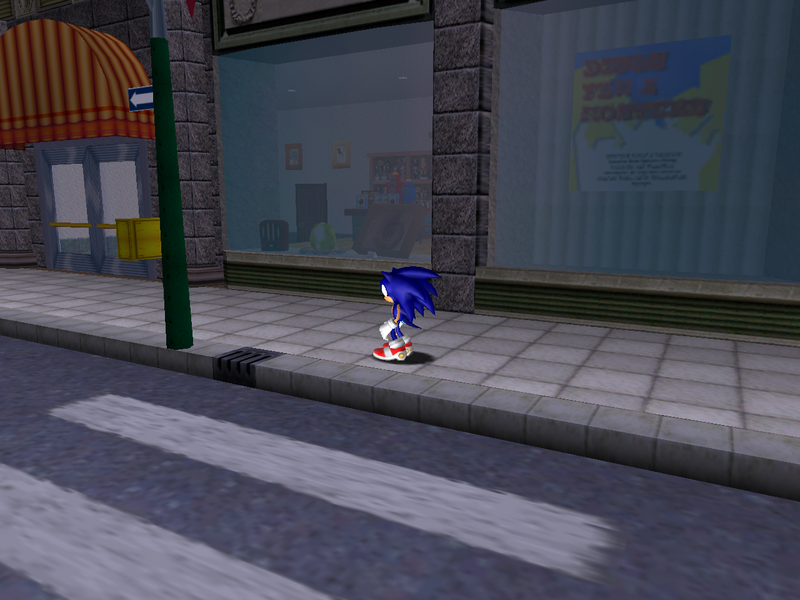 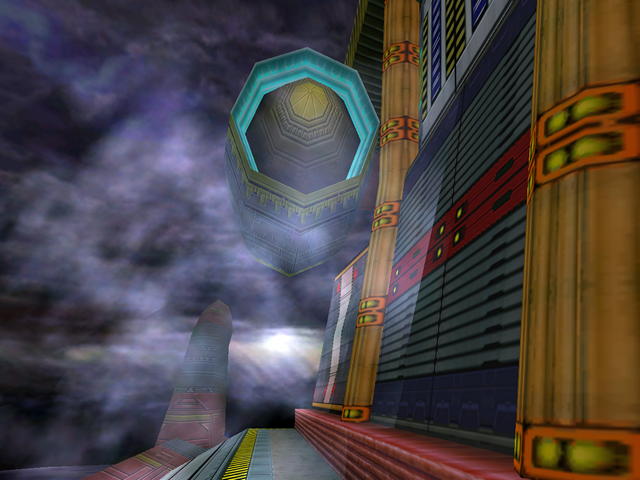 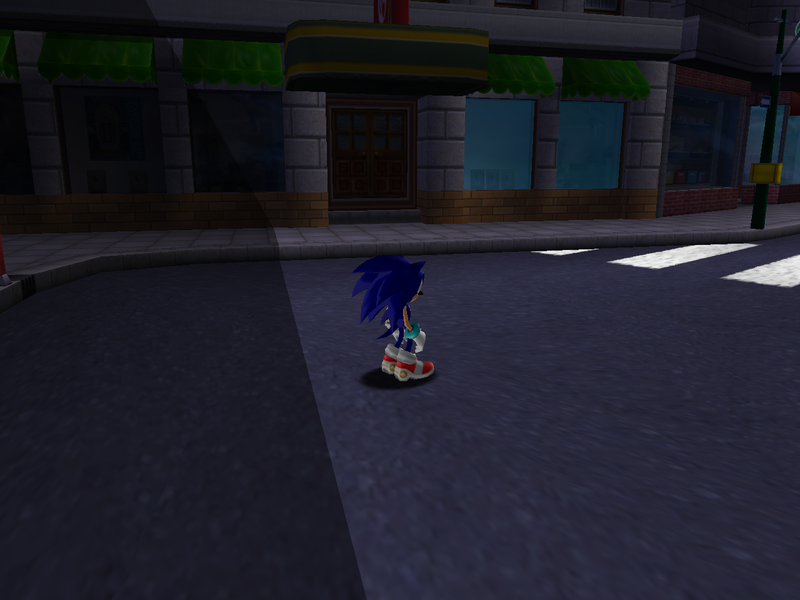 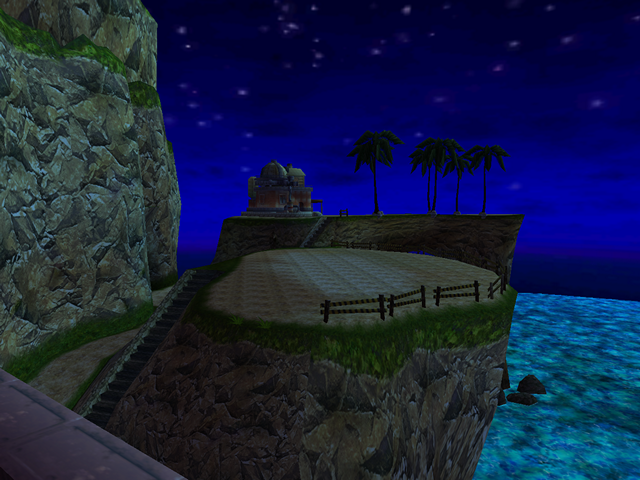 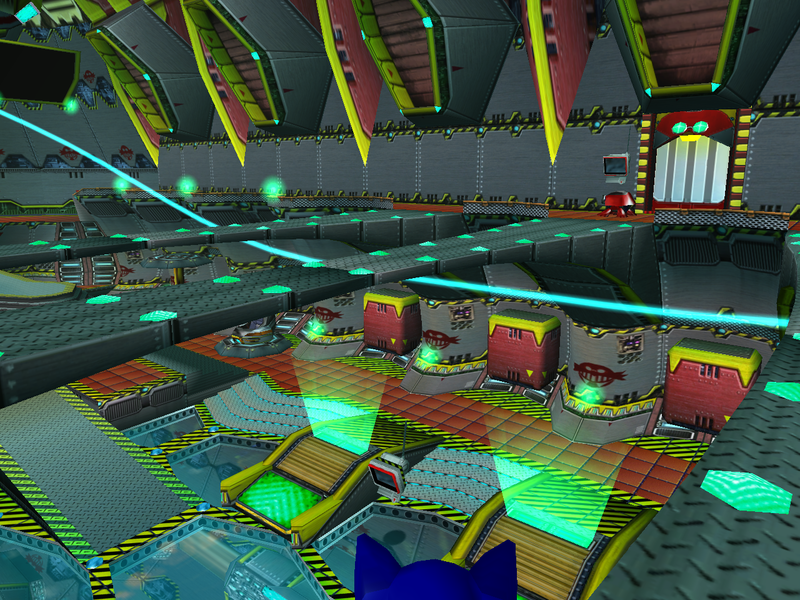 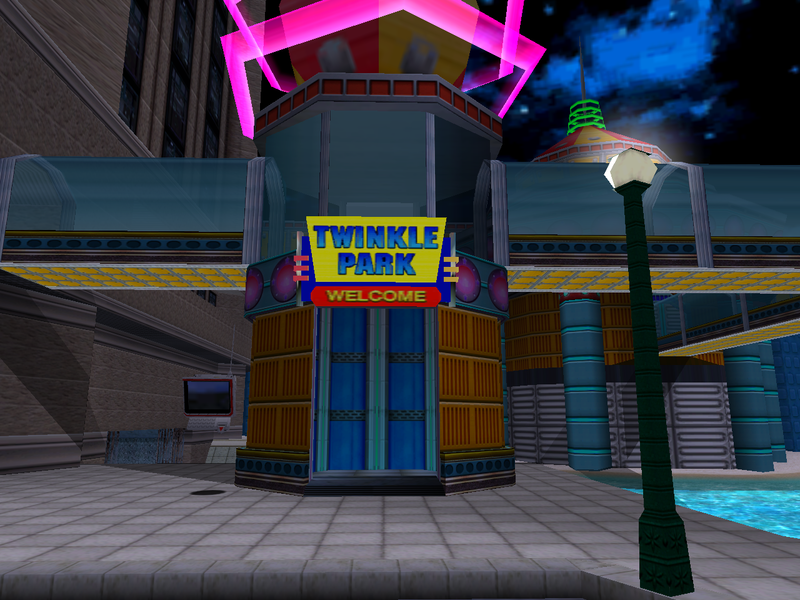 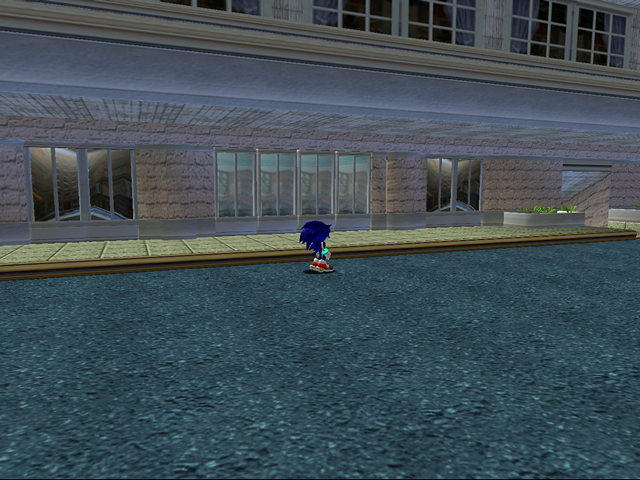 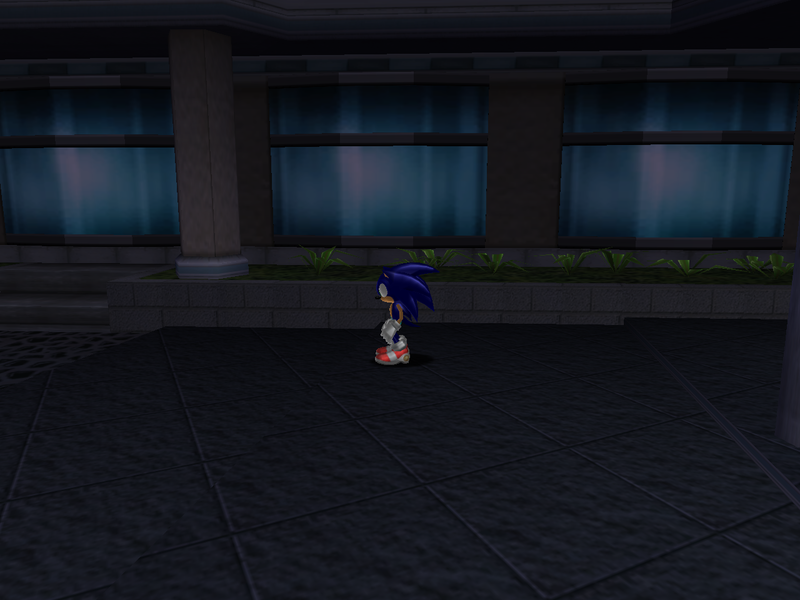 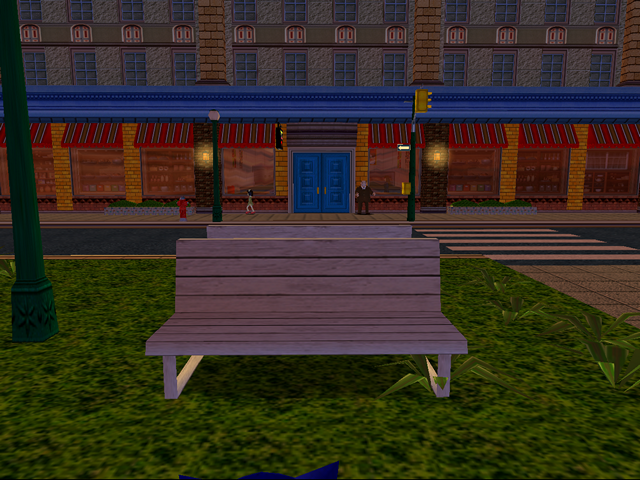 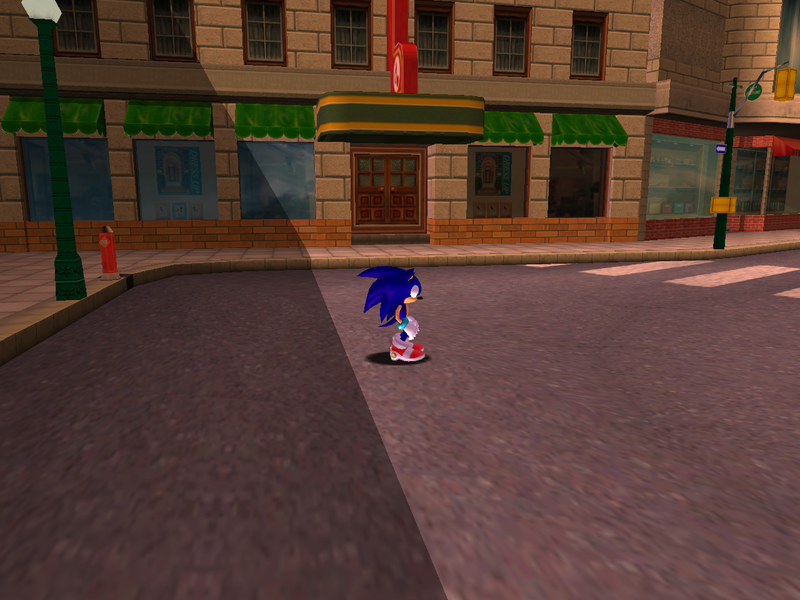 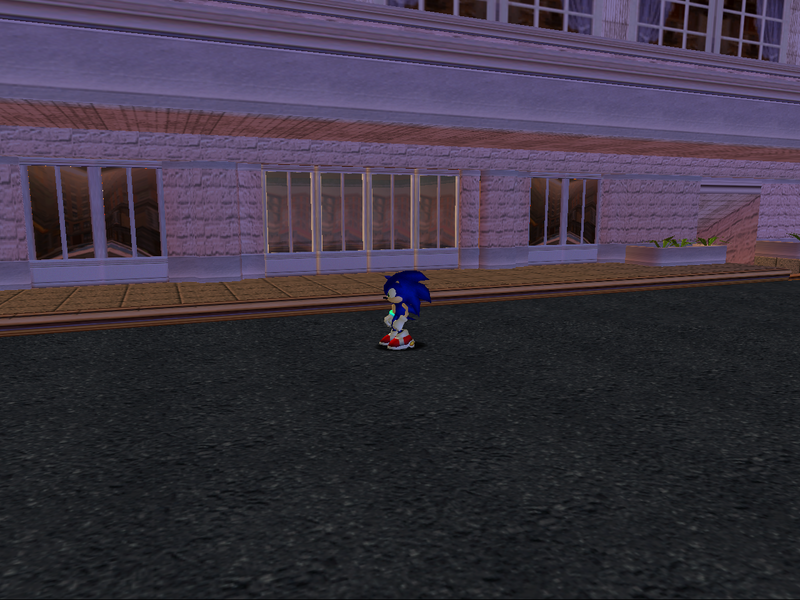 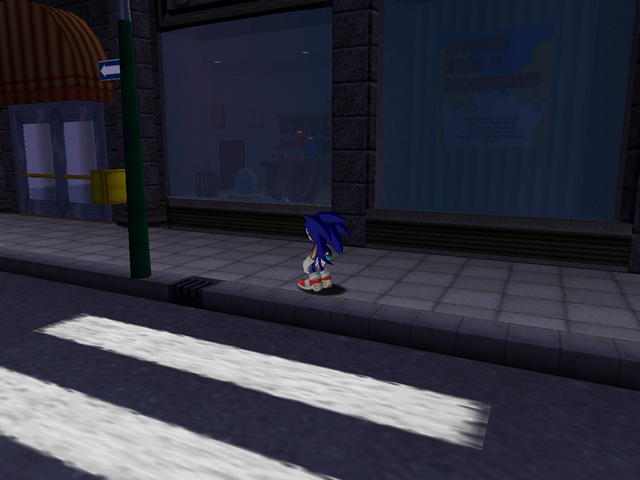 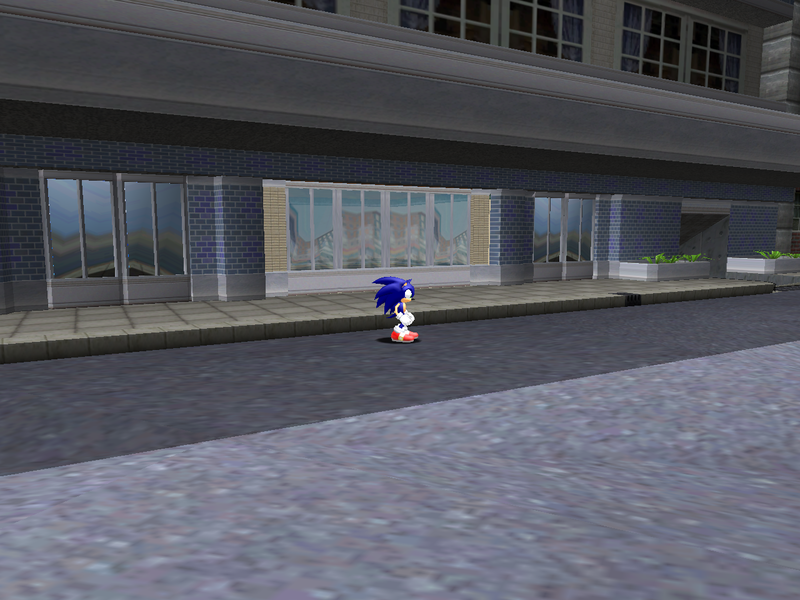 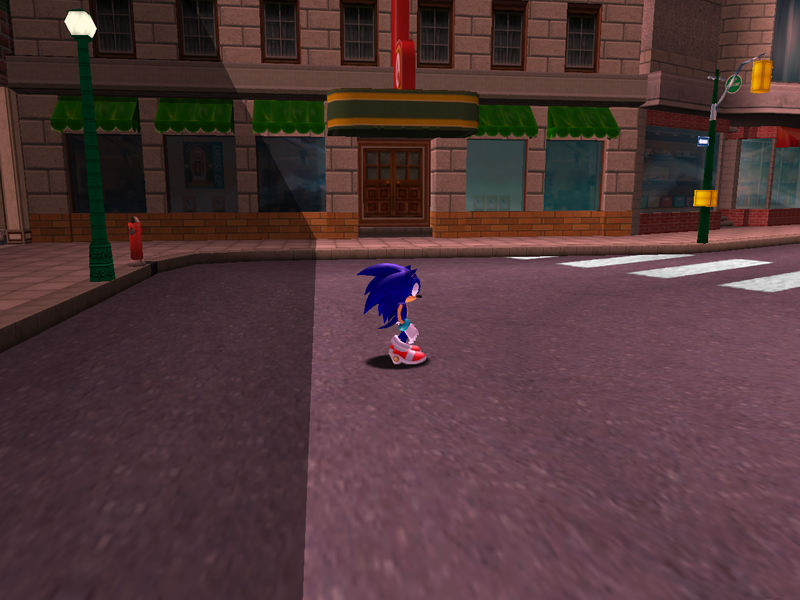 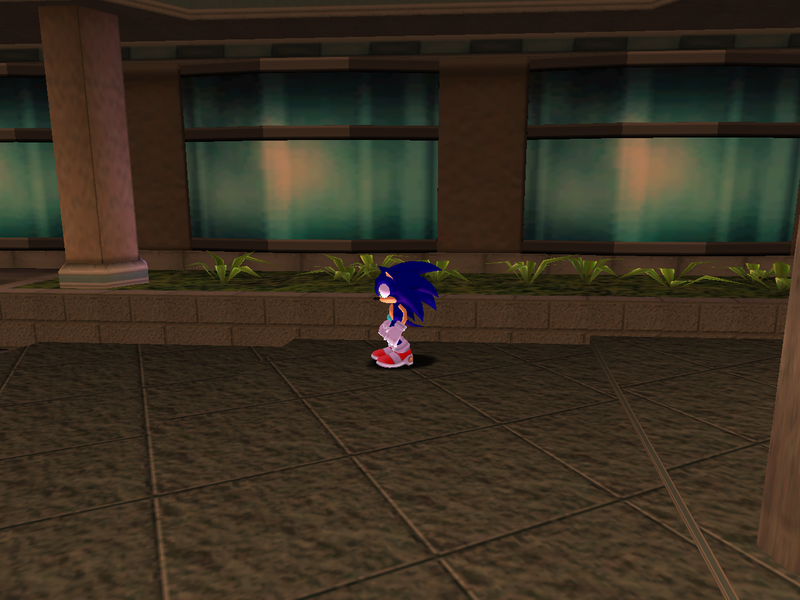 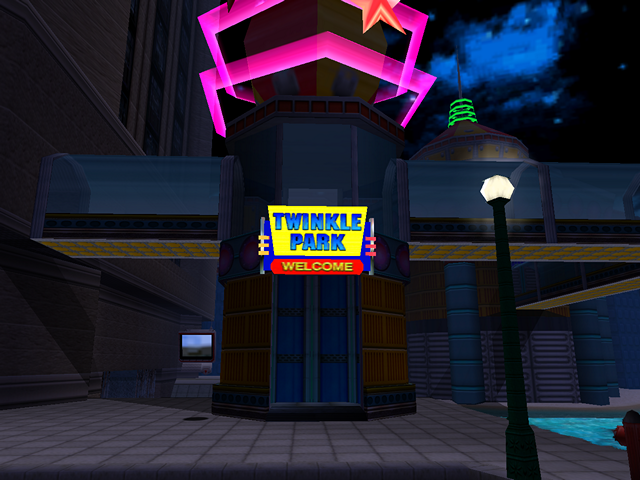 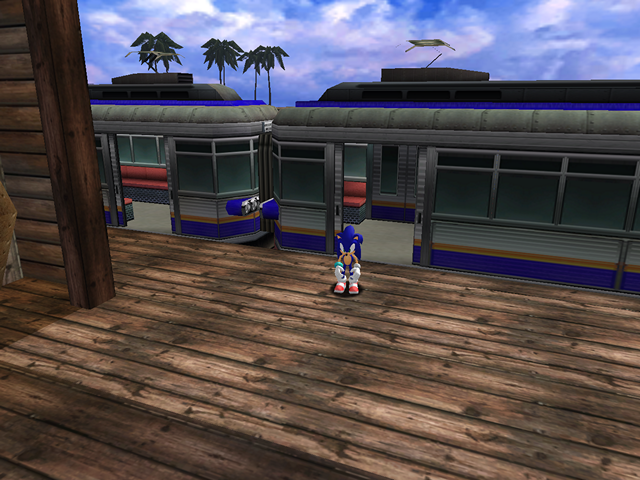 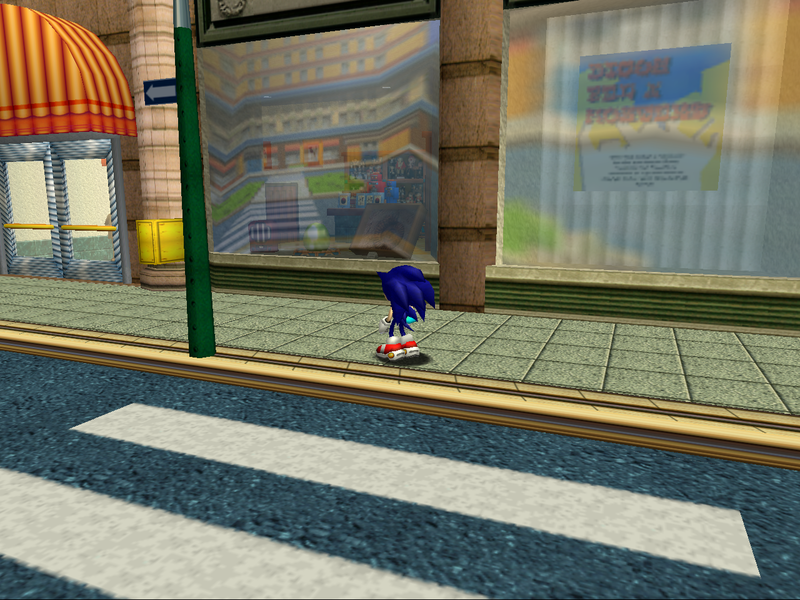 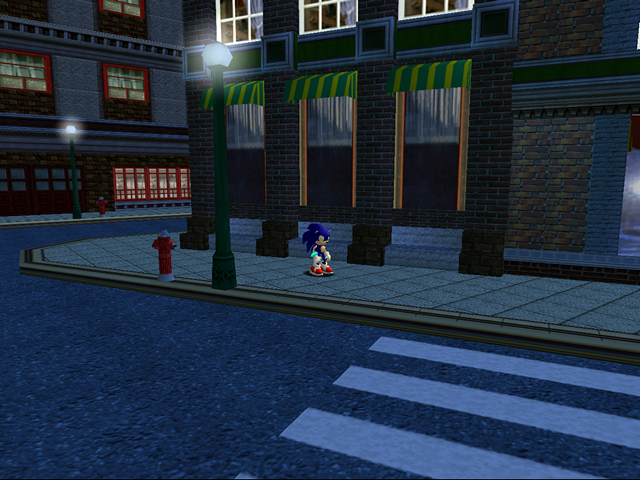 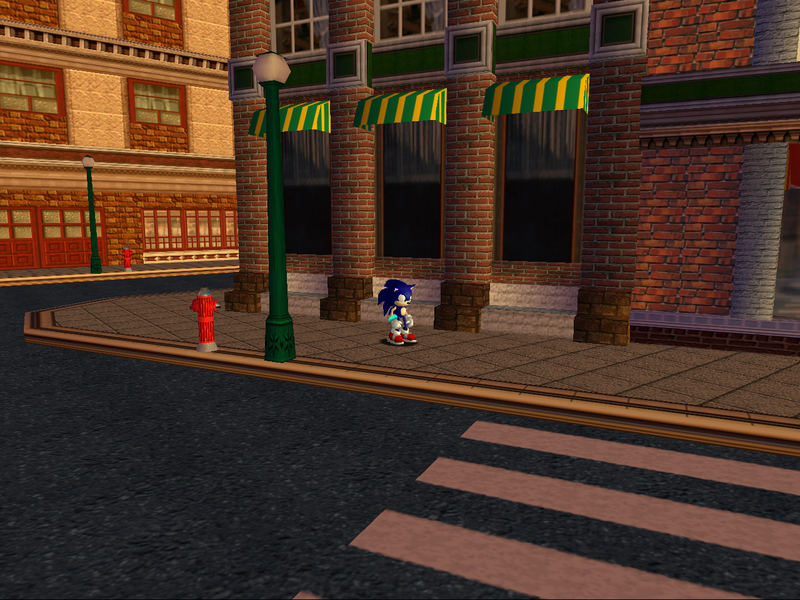 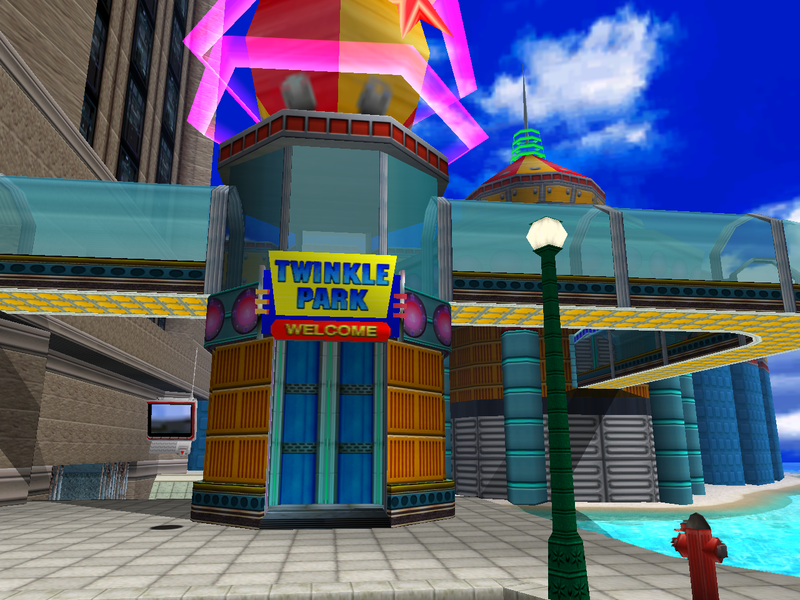 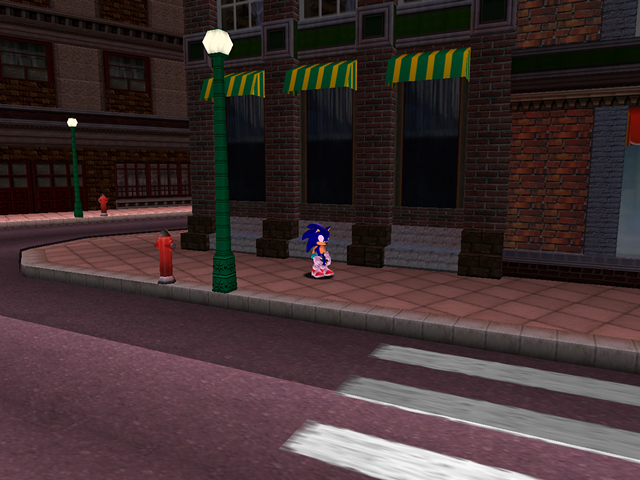 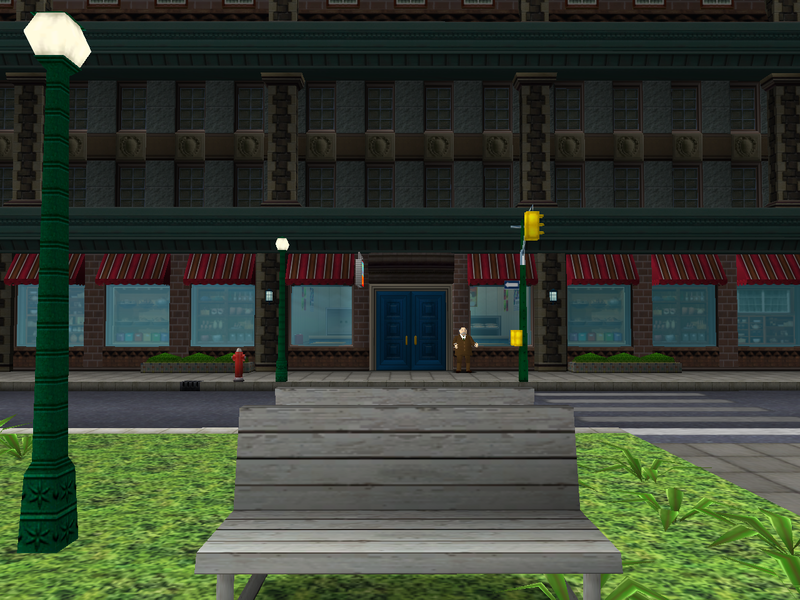 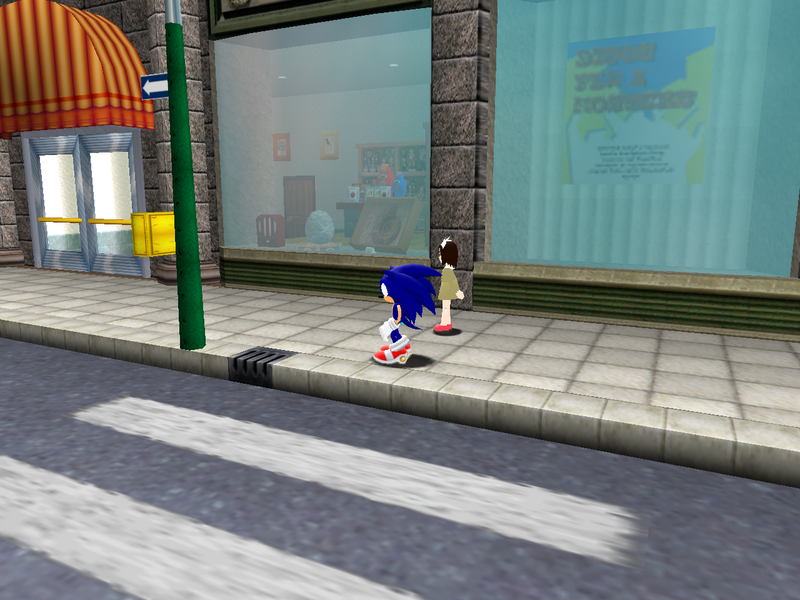 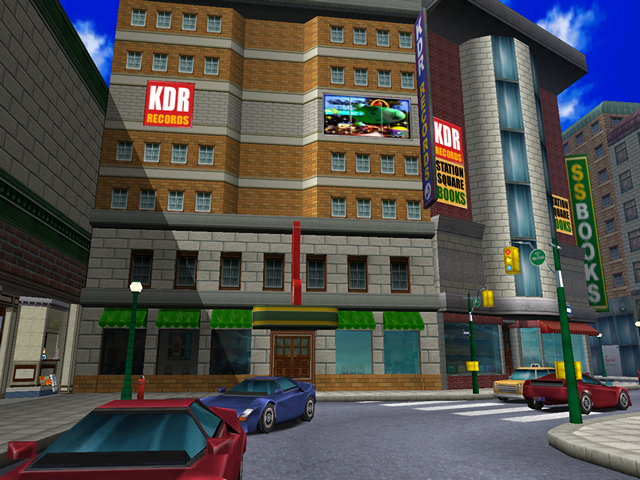 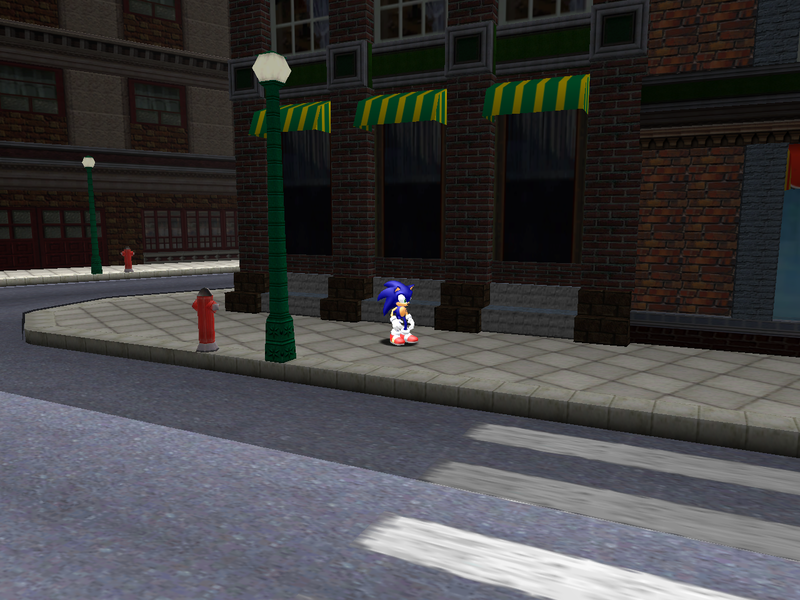 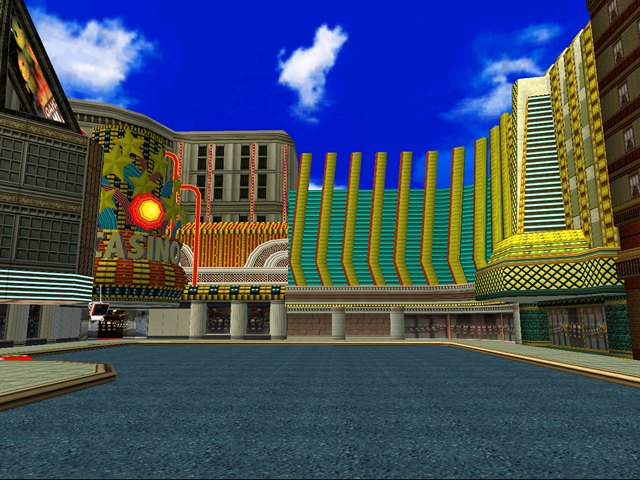 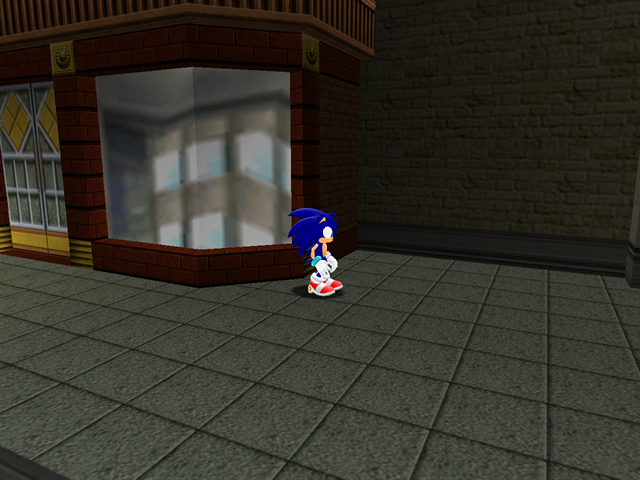 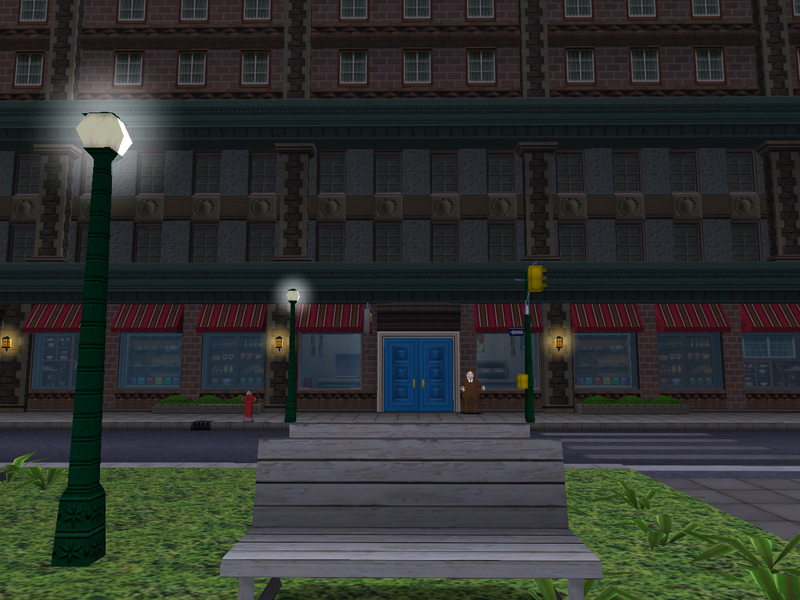 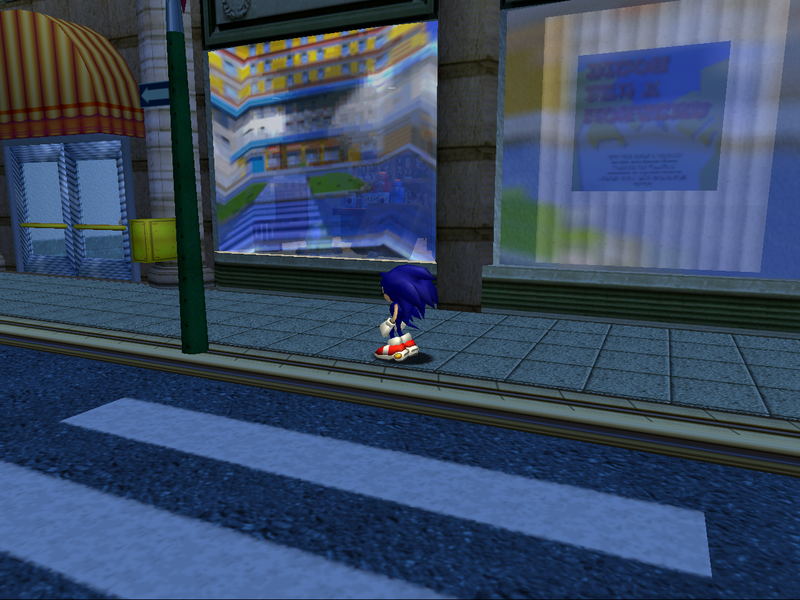 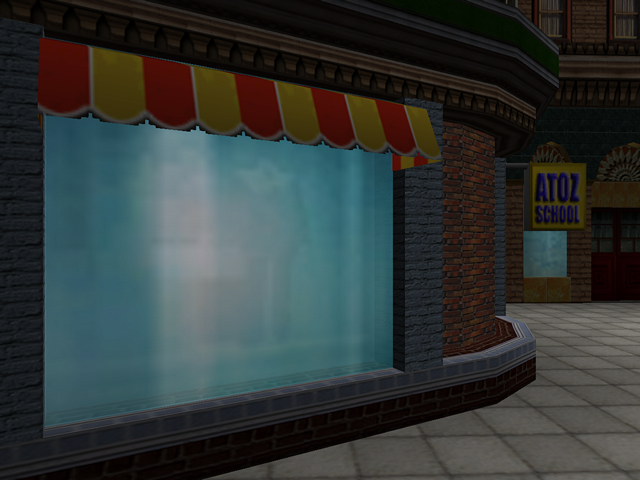 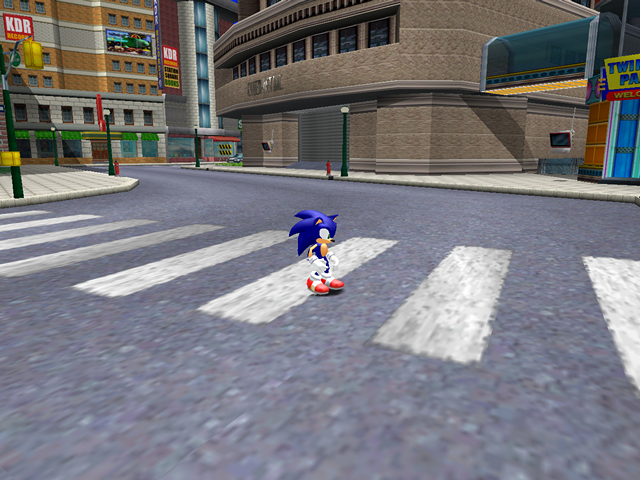 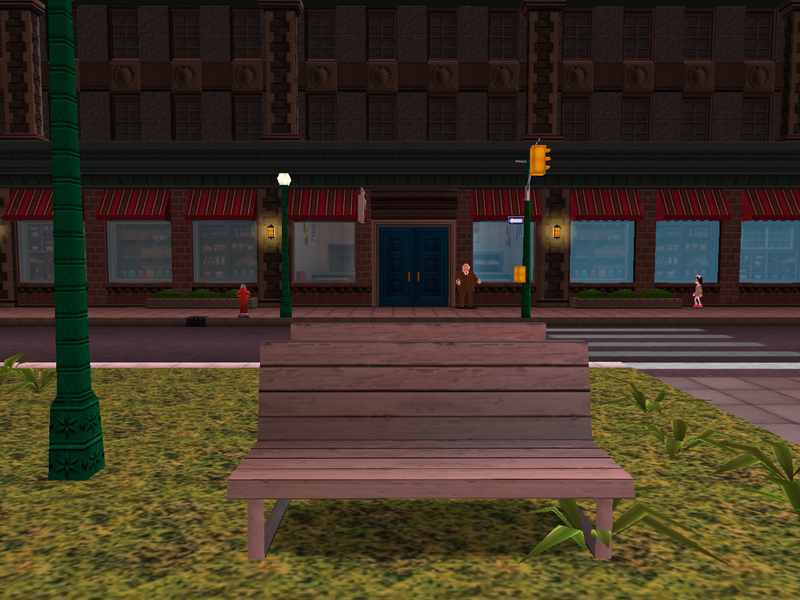 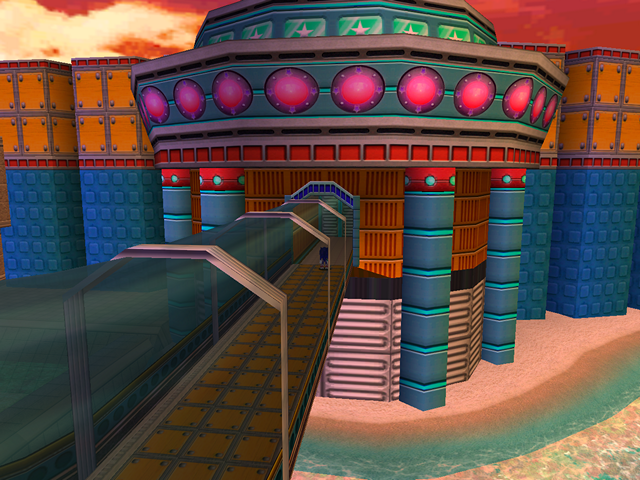 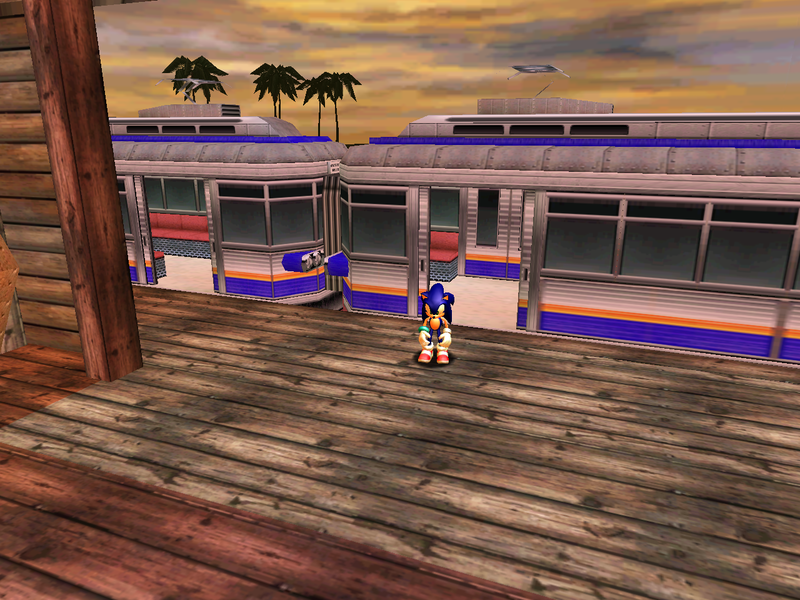 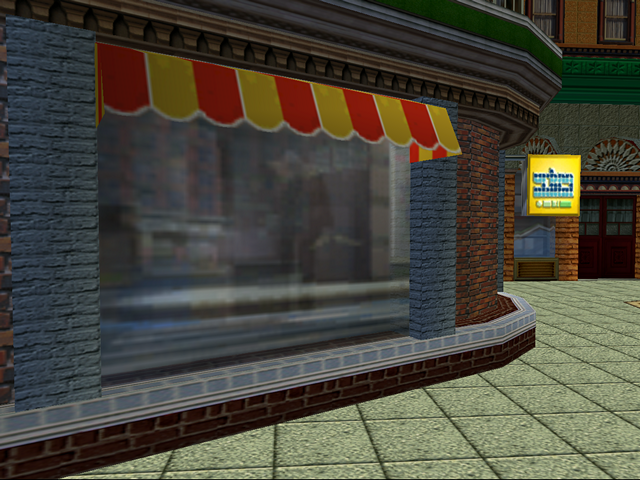 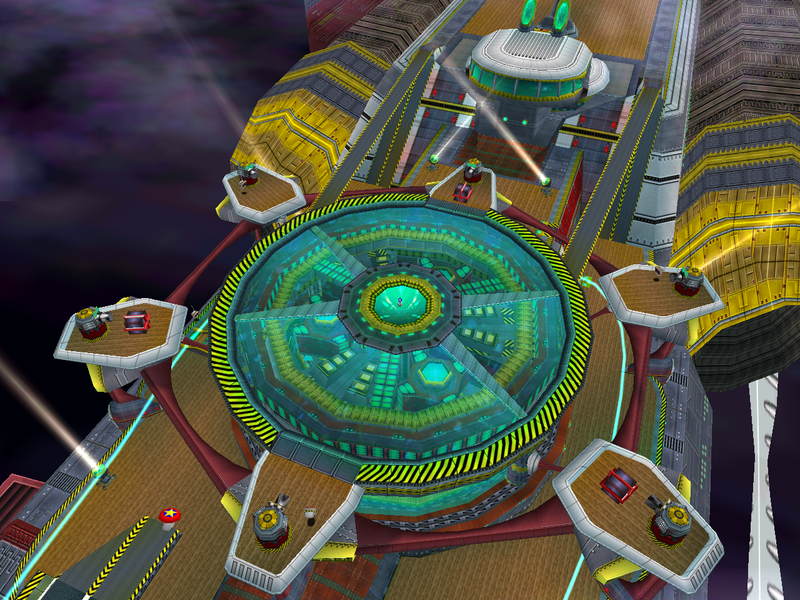 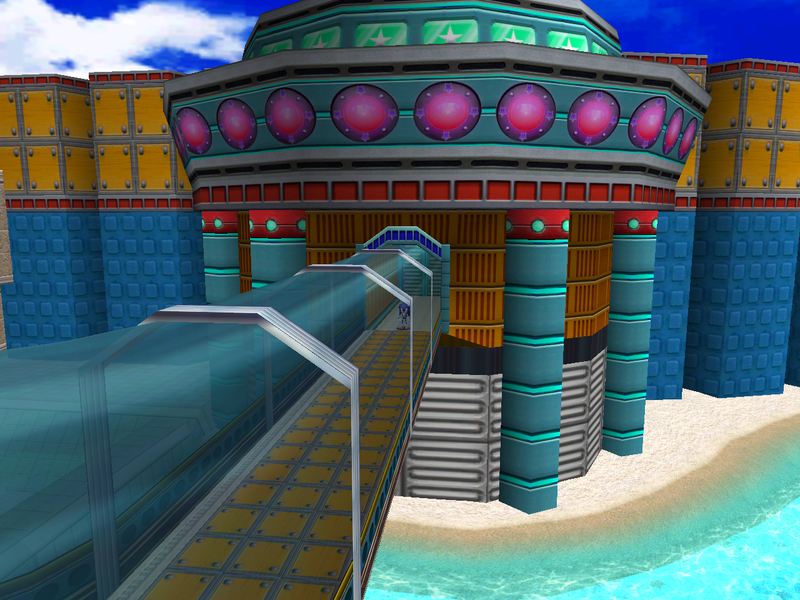 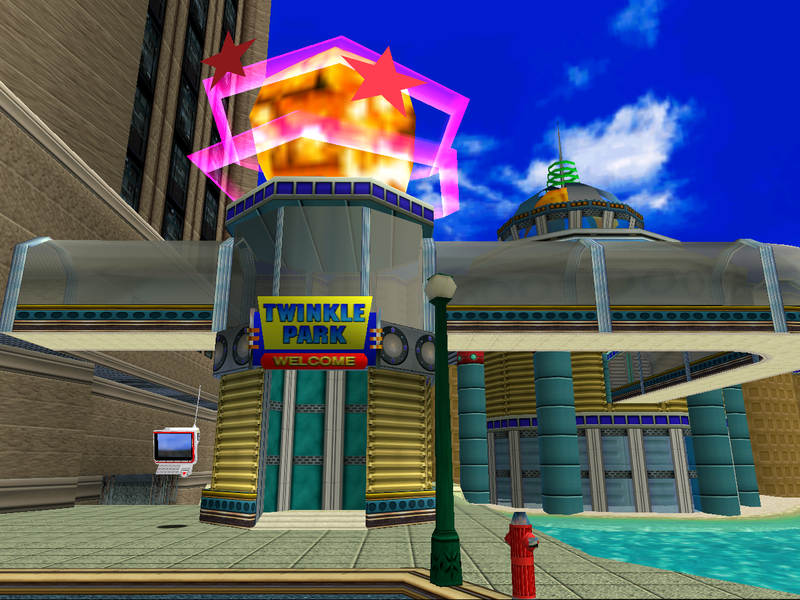 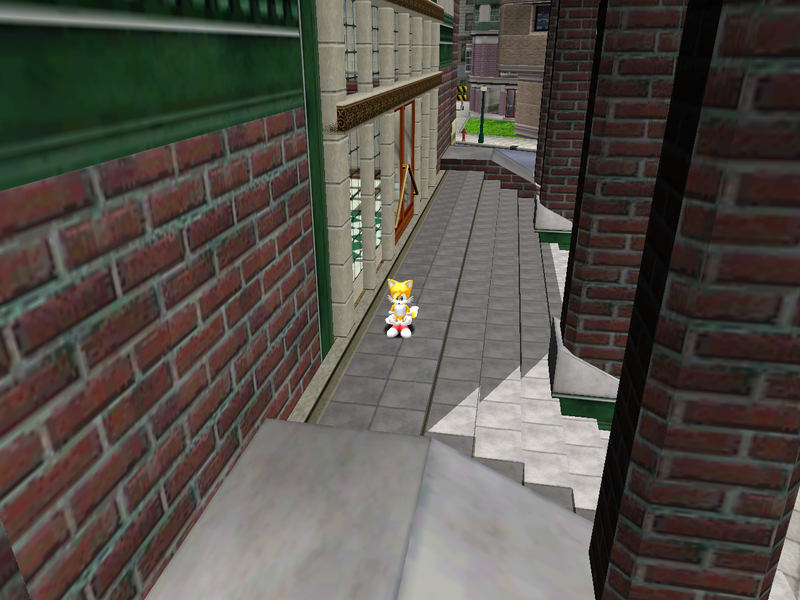 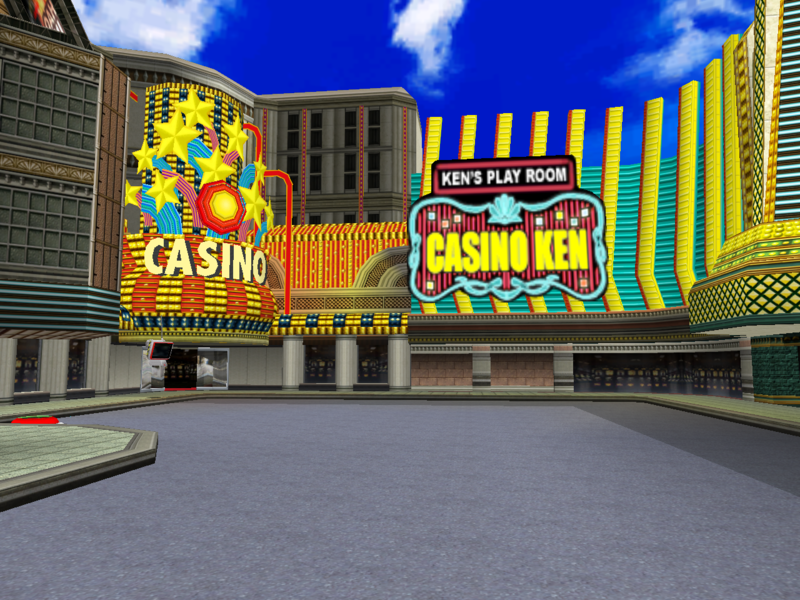 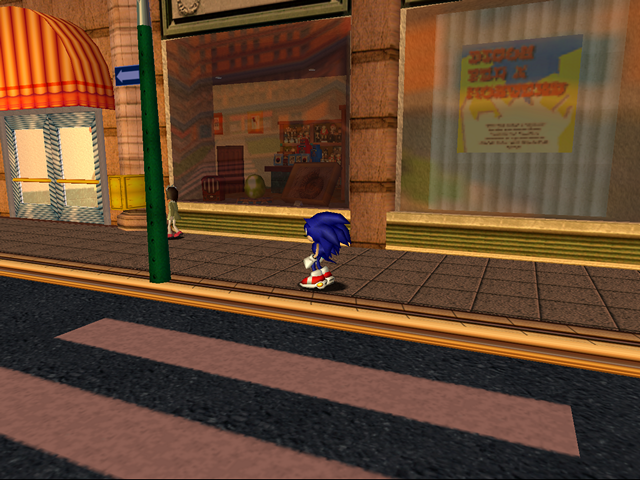 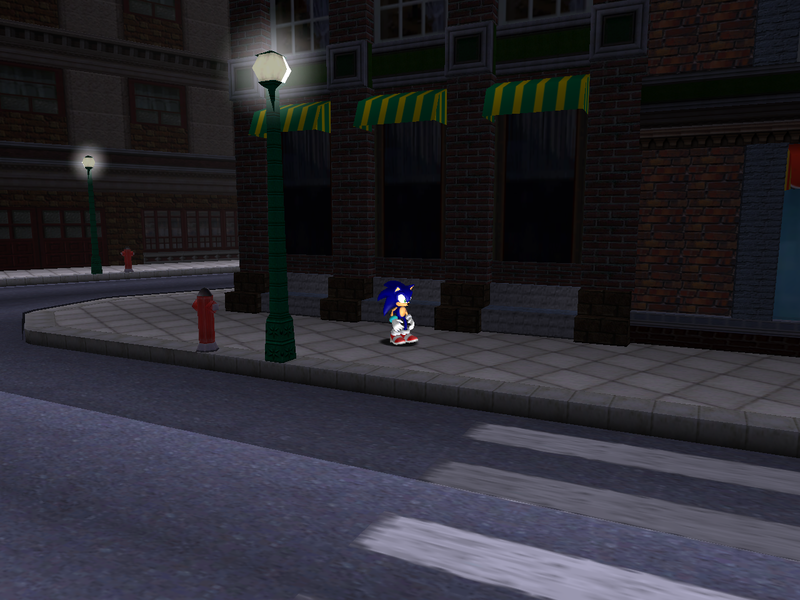 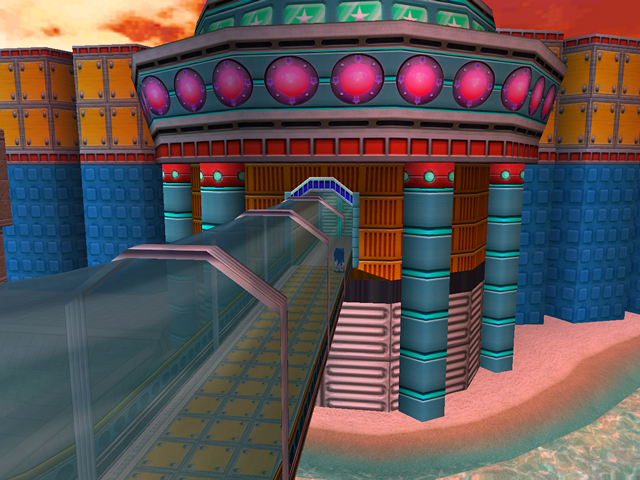 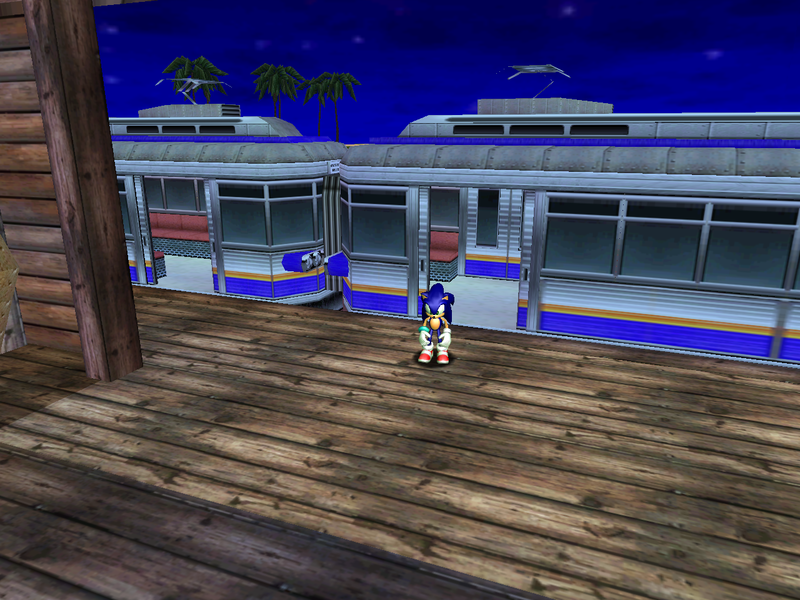 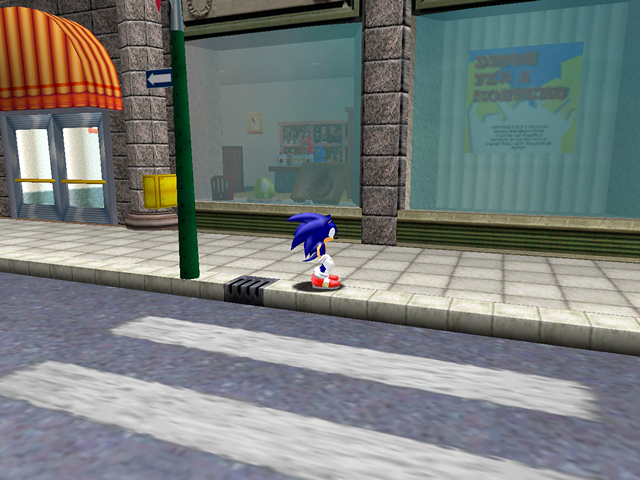 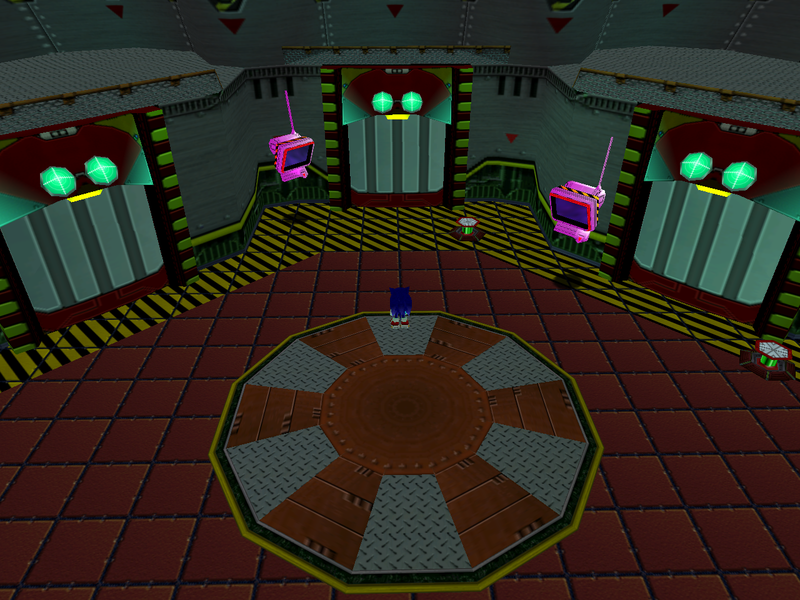 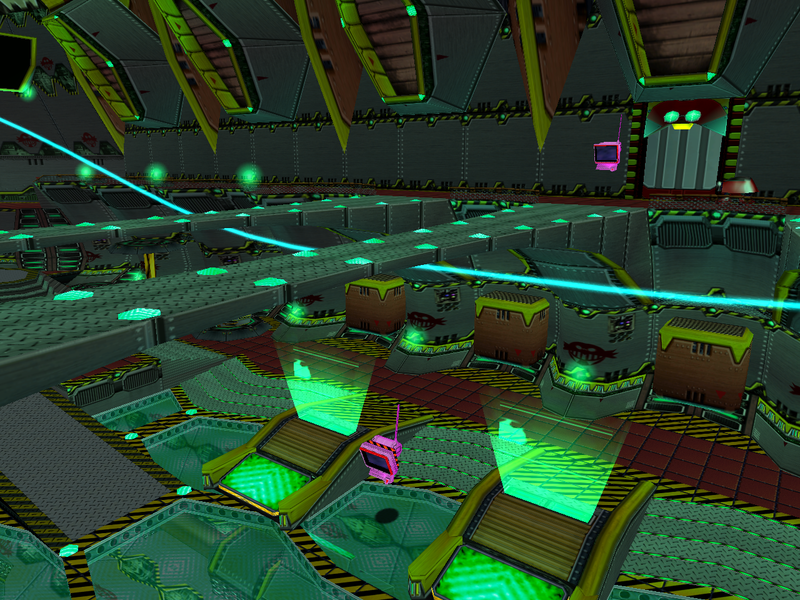 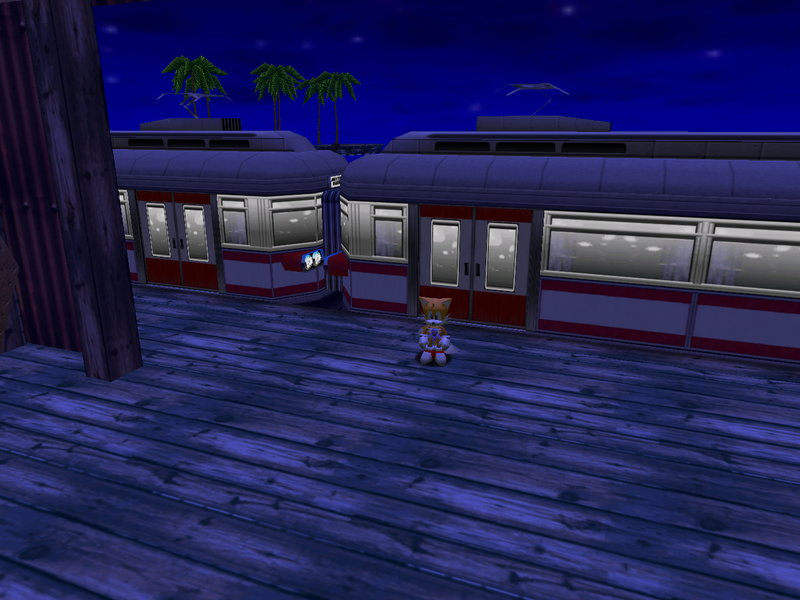 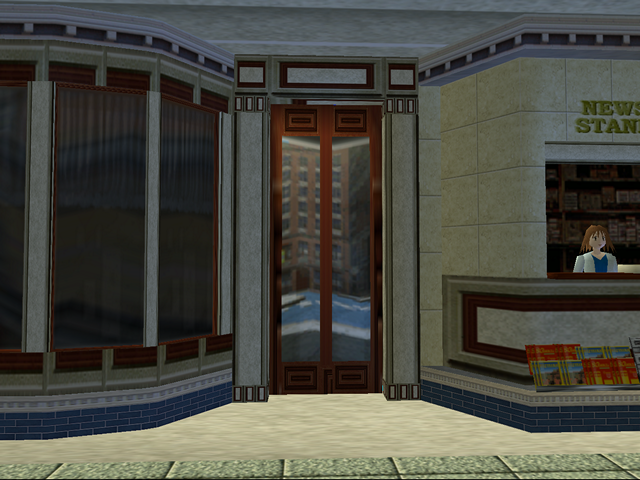 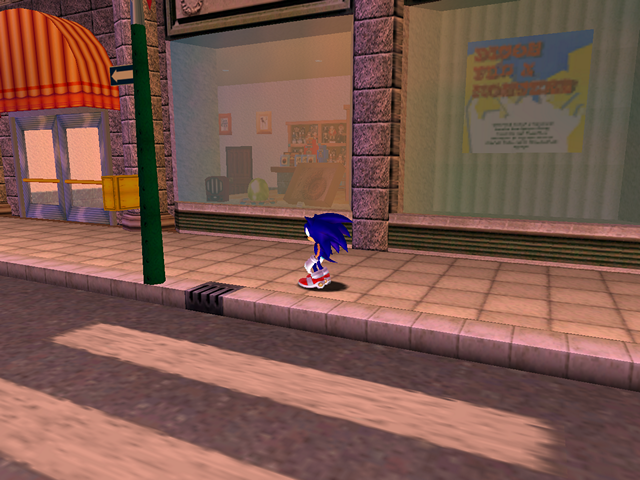 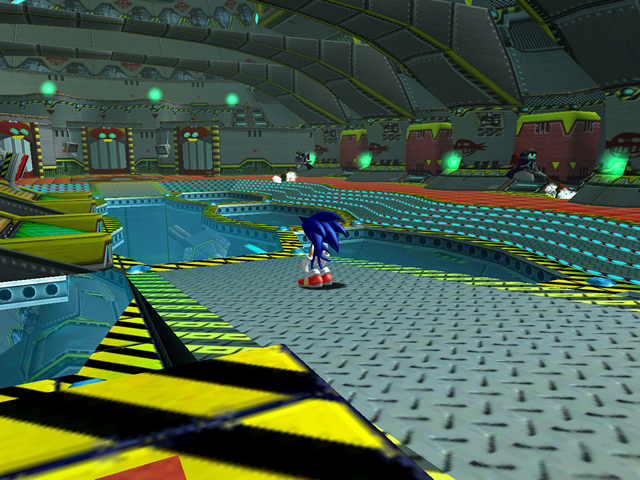 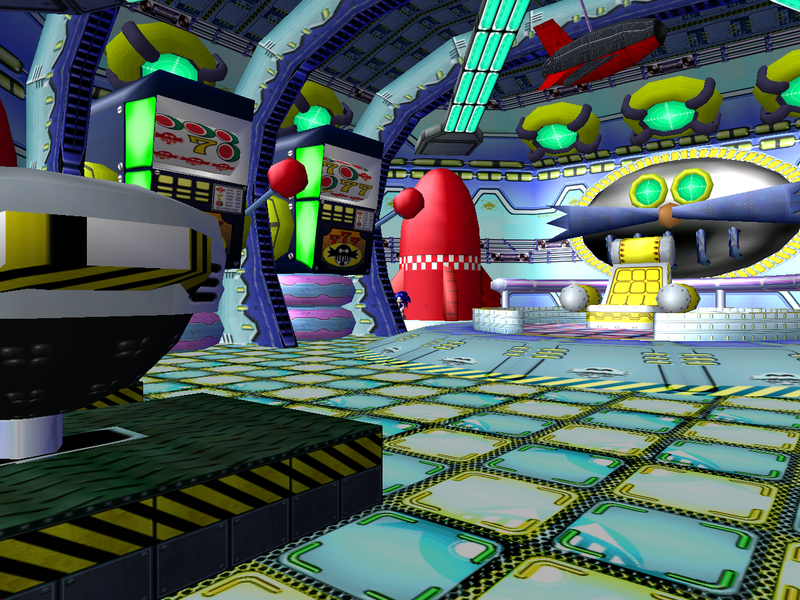 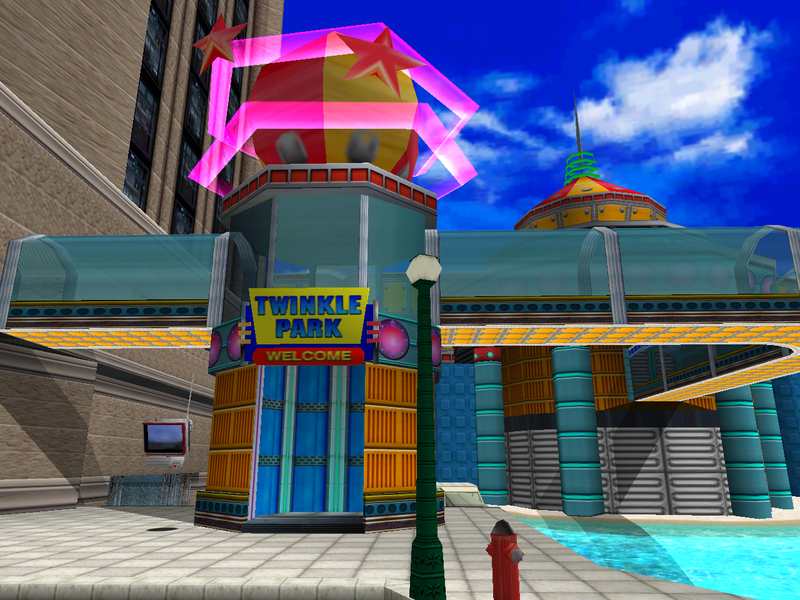 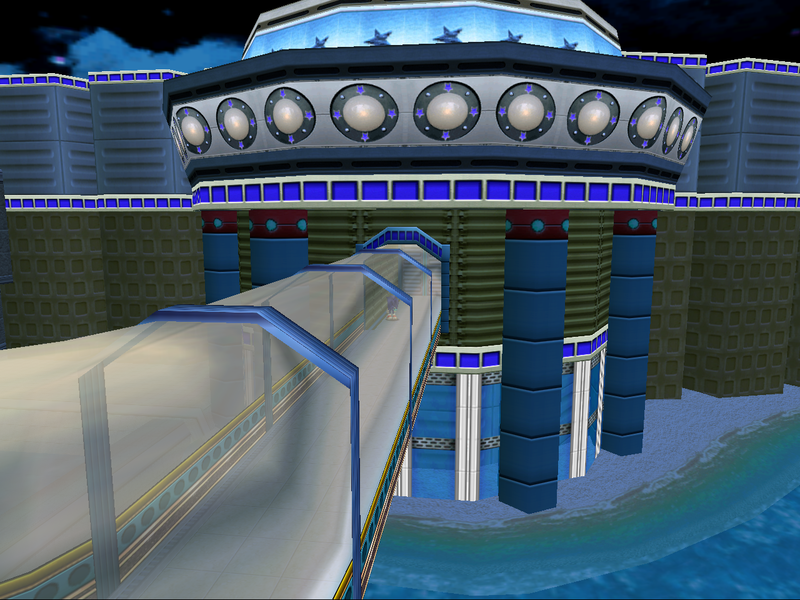 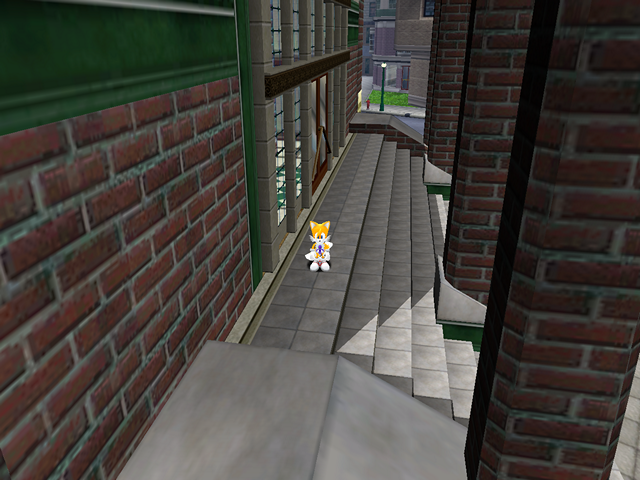 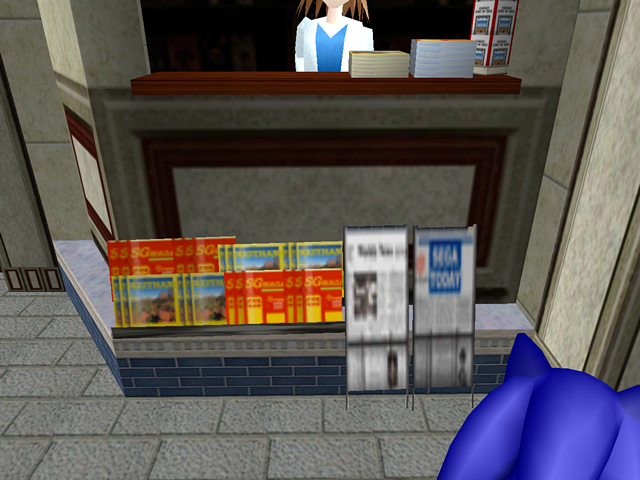 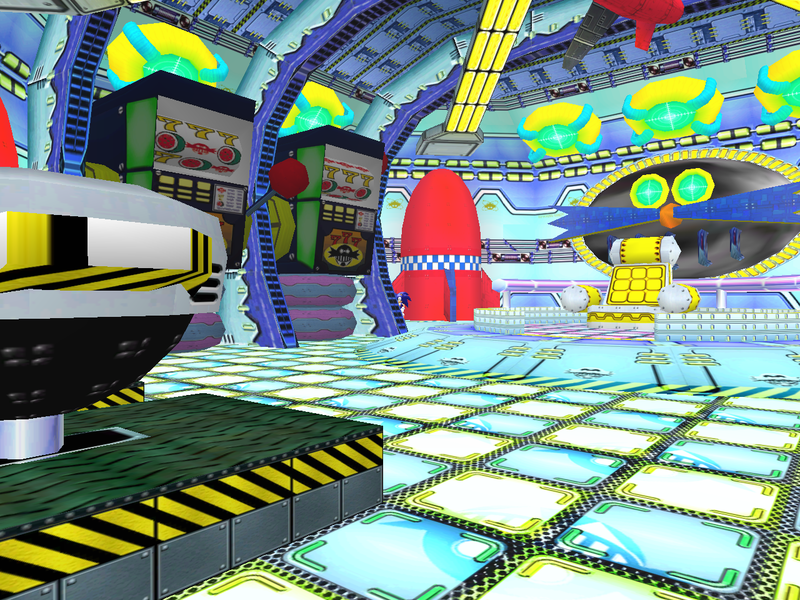 Station Square loses a lot of its original atmosphere in SADX, and the fake shadows arguably don’t compensate for it. 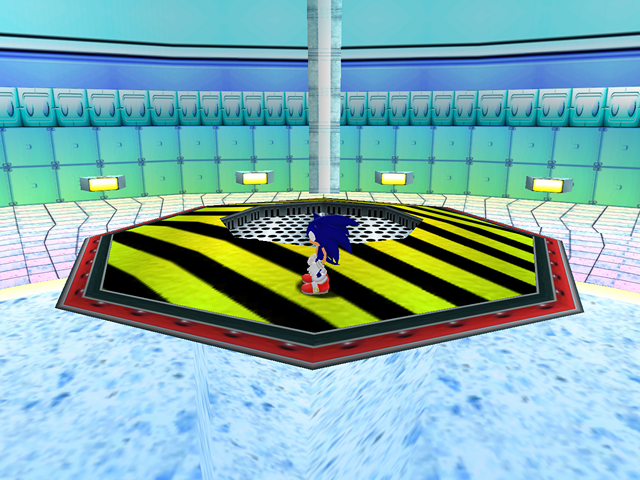 It’s the most severely downgraded Adventure Field in the game, with loss of texture variety, UV and lighting downgrades, missing effects, transparency issues and various visual bugs. However, this level can be reverted to the original version with the Dreamcast Conversion mod. Check out this section on how to install mods on the PC version.